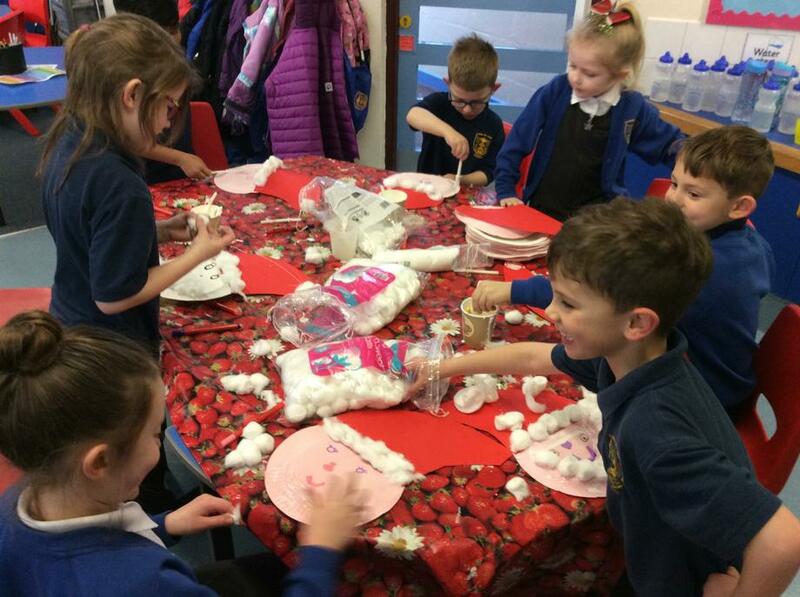 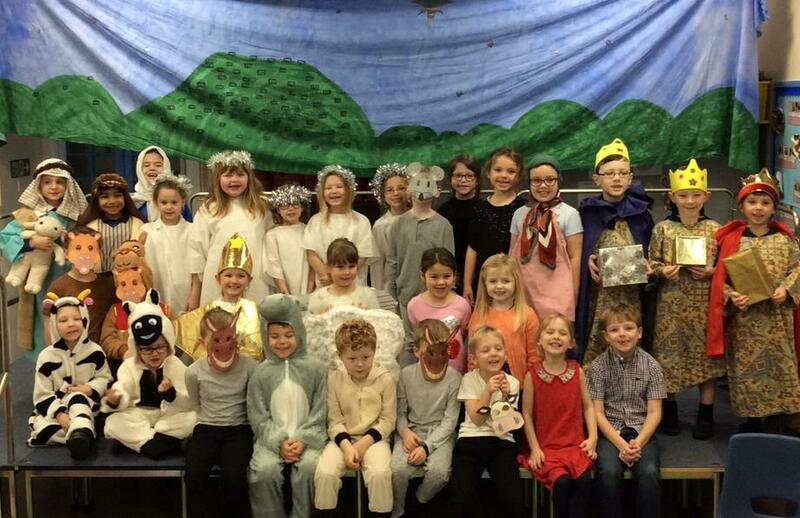 Our class teachers are Mrs Hewson and Miss Huck and we are very lucky to have three teaching assistants in our class - Miss Gibson, Mrs Harding and Mrs Thornton. 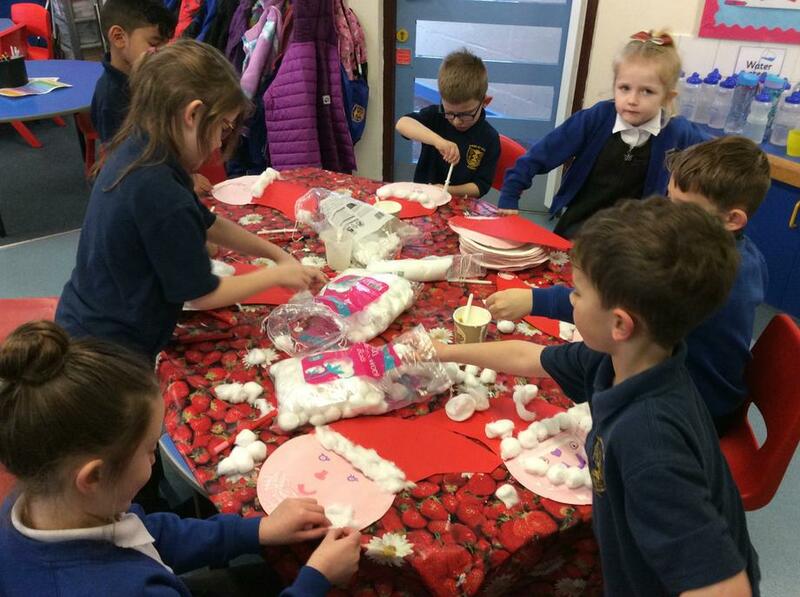 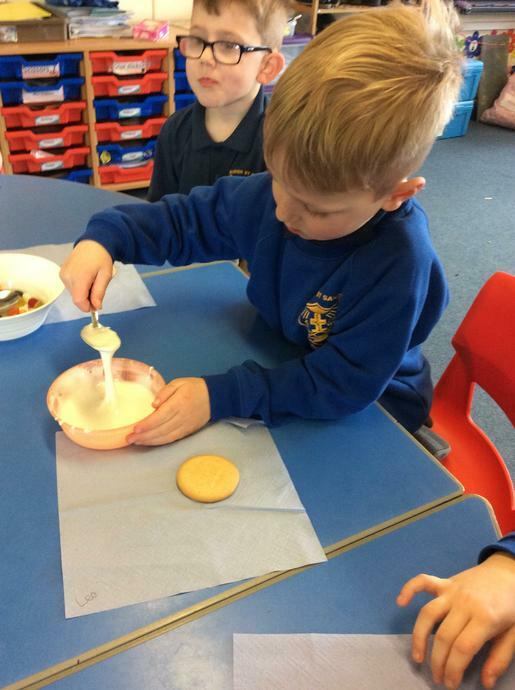 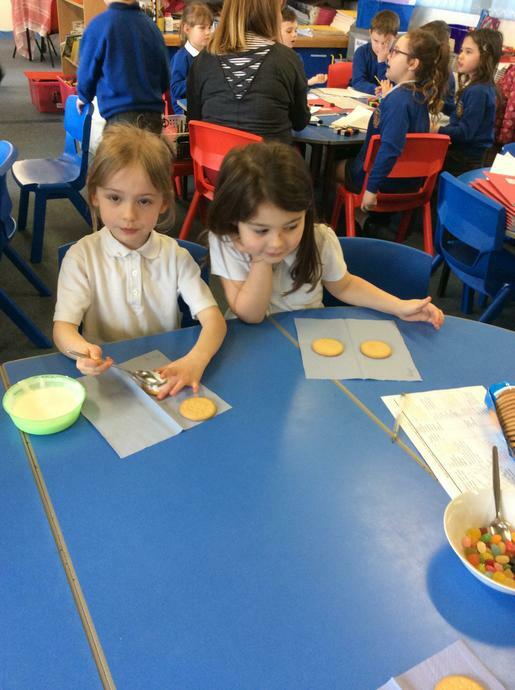 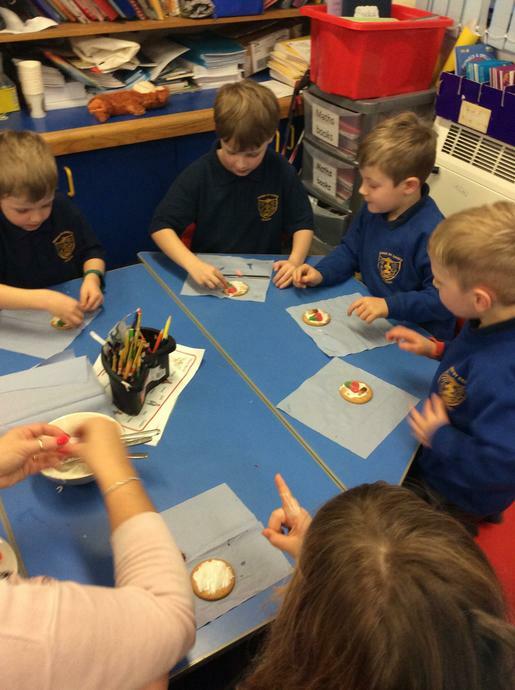 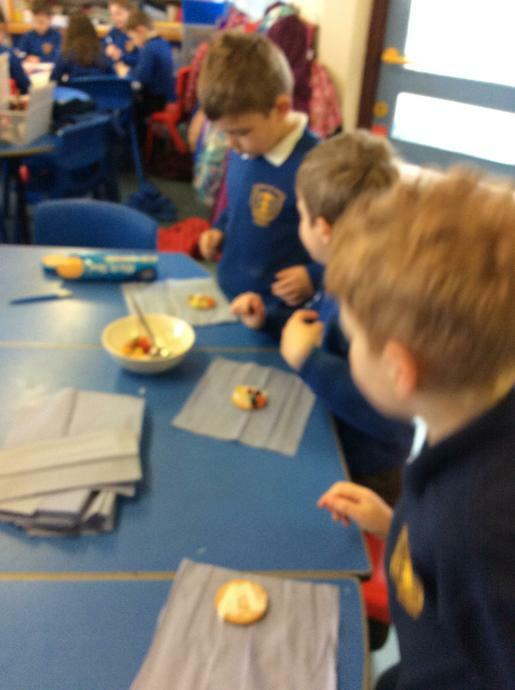 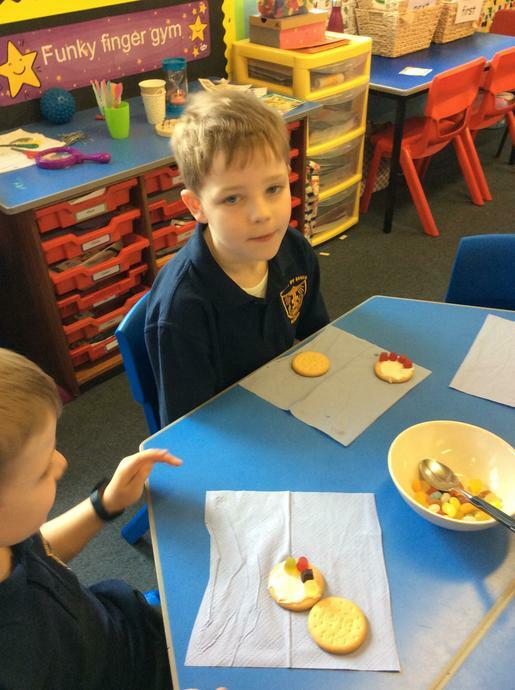 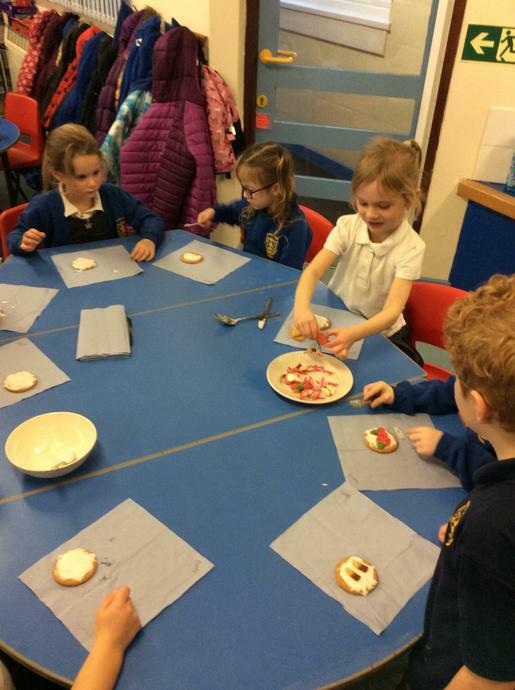 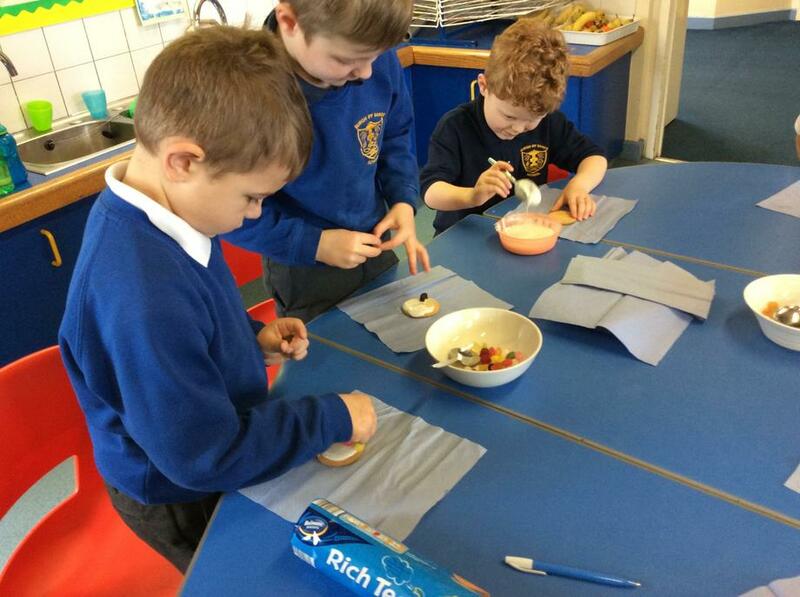 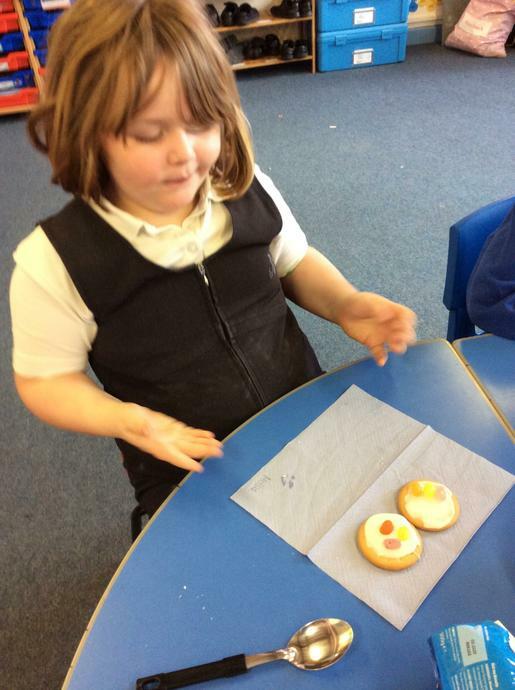 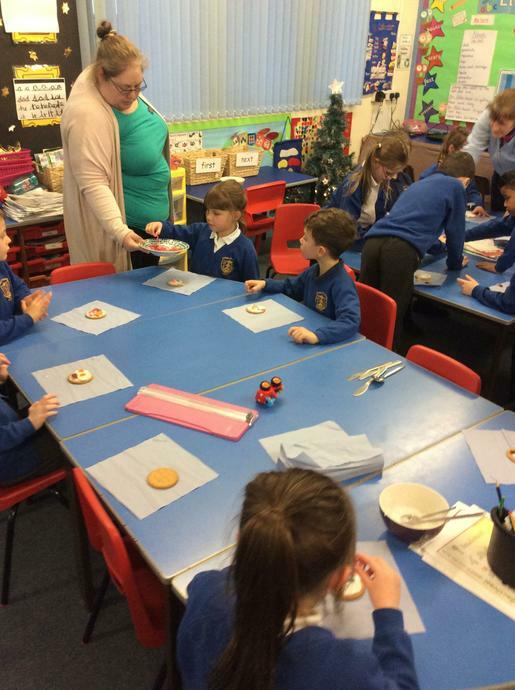 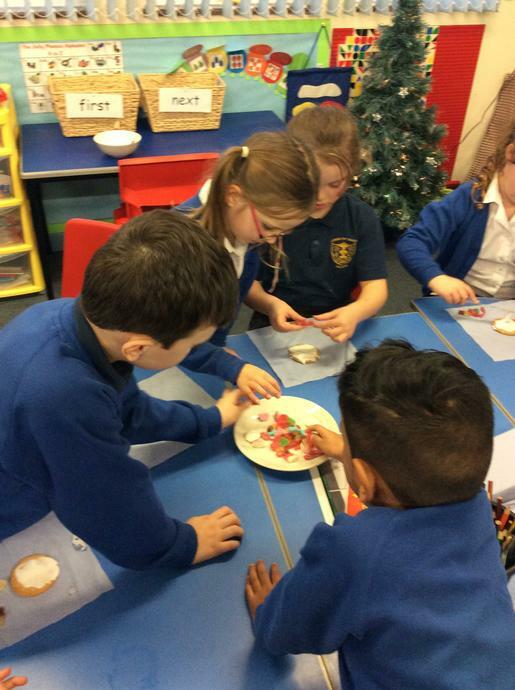 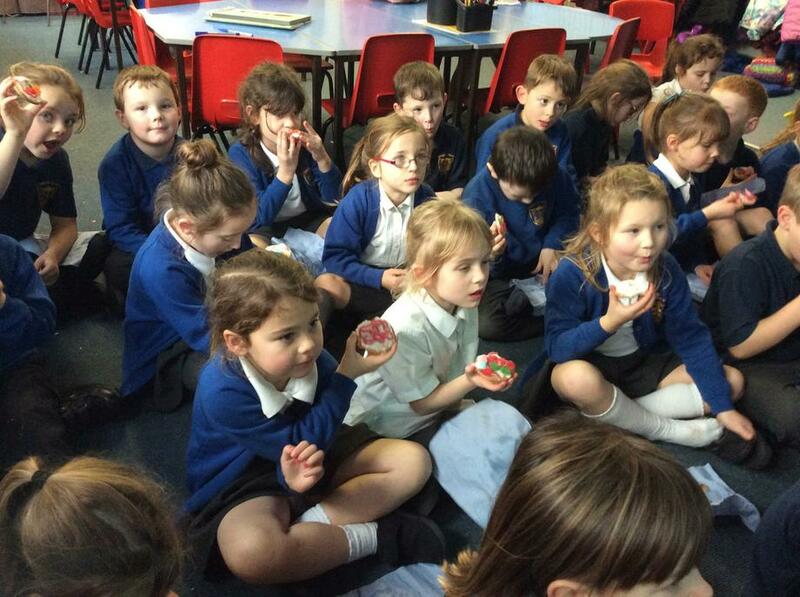 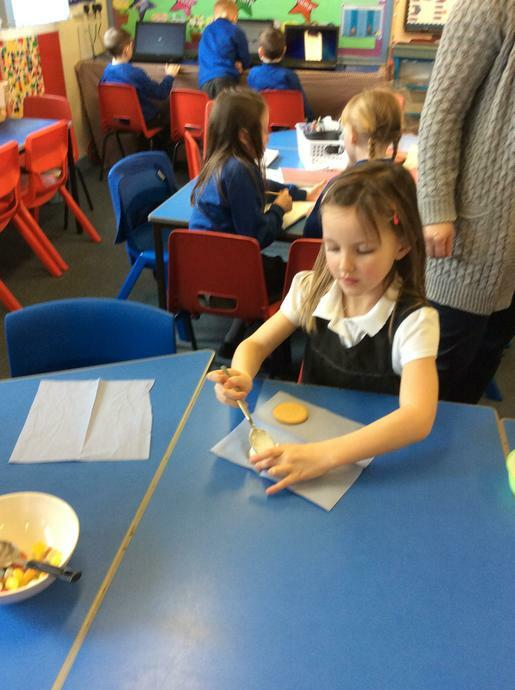 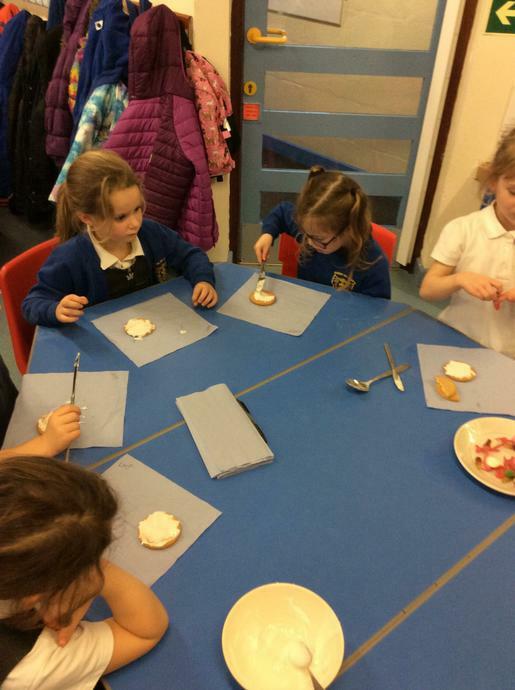 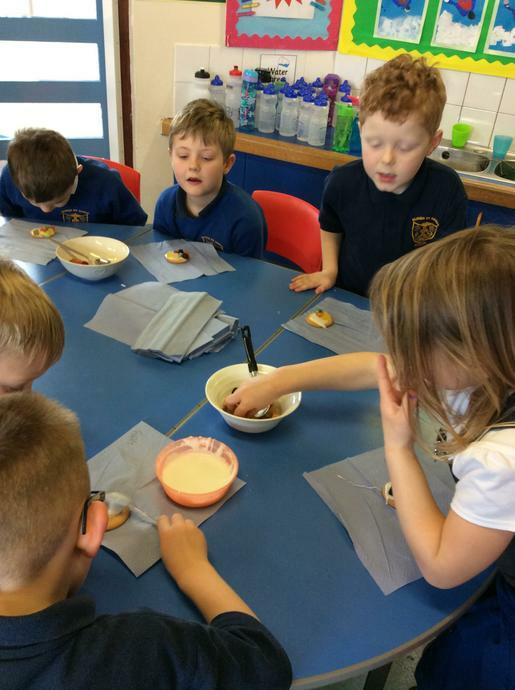 The year 1 children enjoyed doing some biscuit decorating in maths this week, we were trying to decorate half of the biscuit. 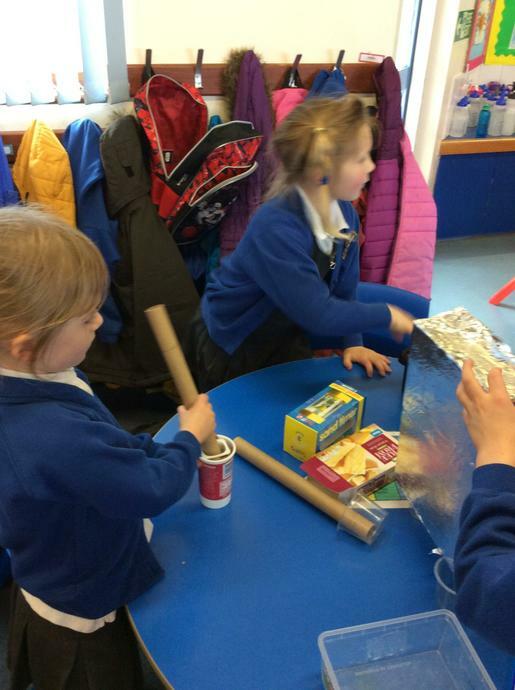 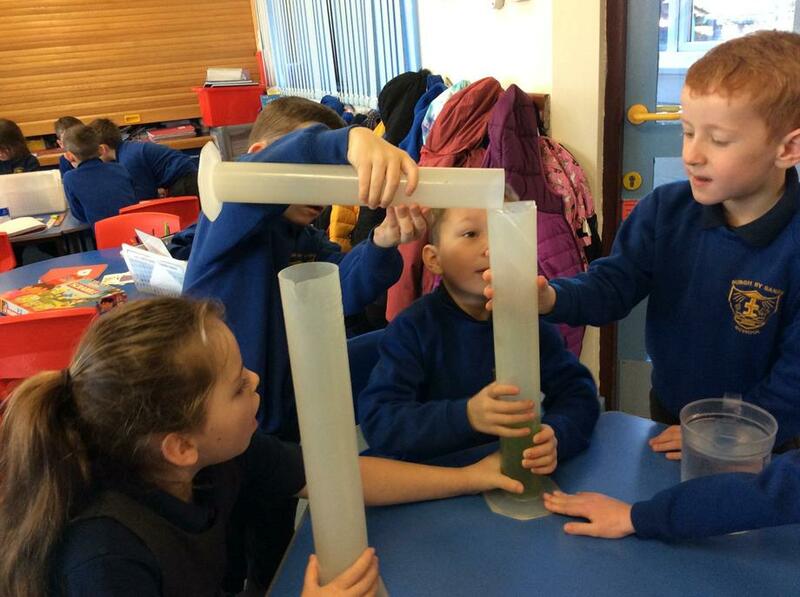 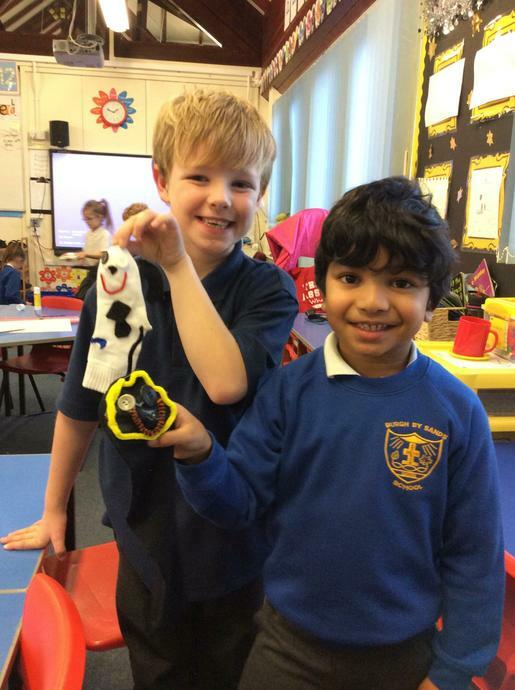 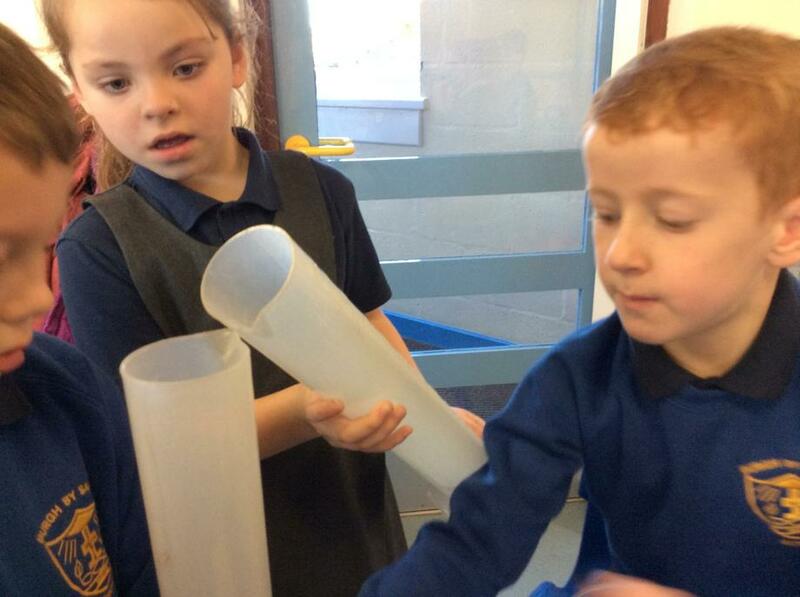 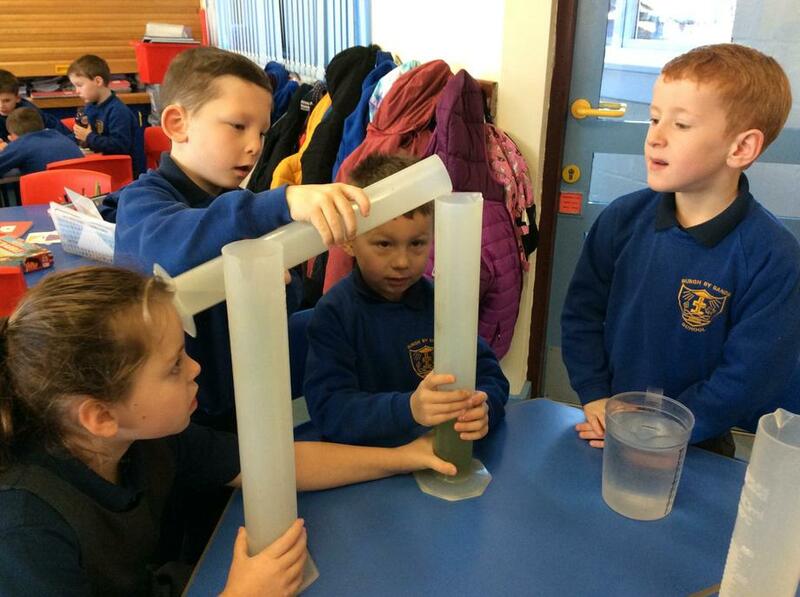 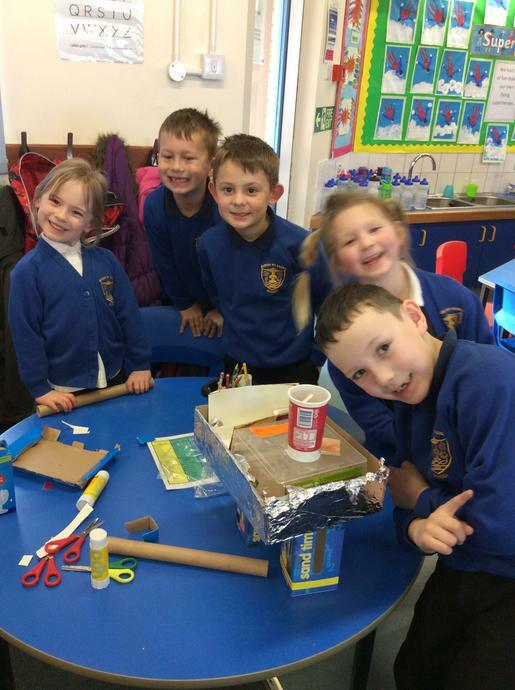 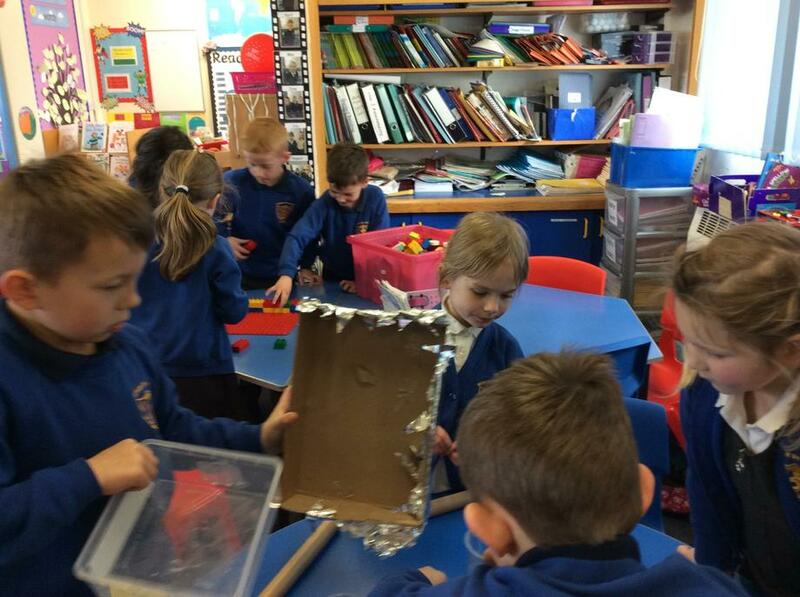 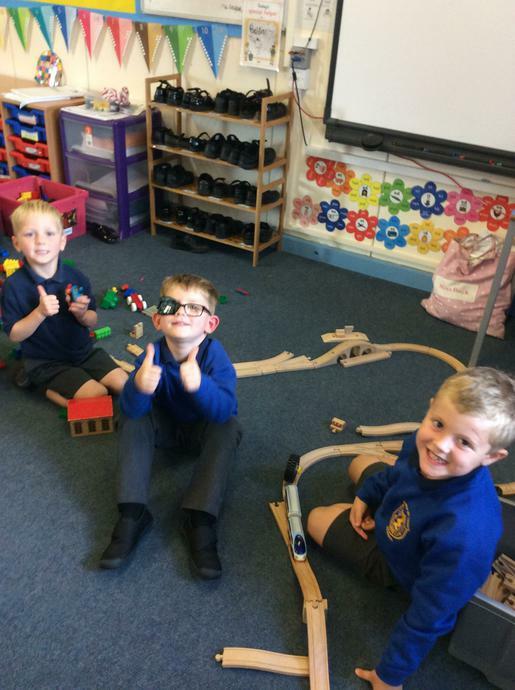 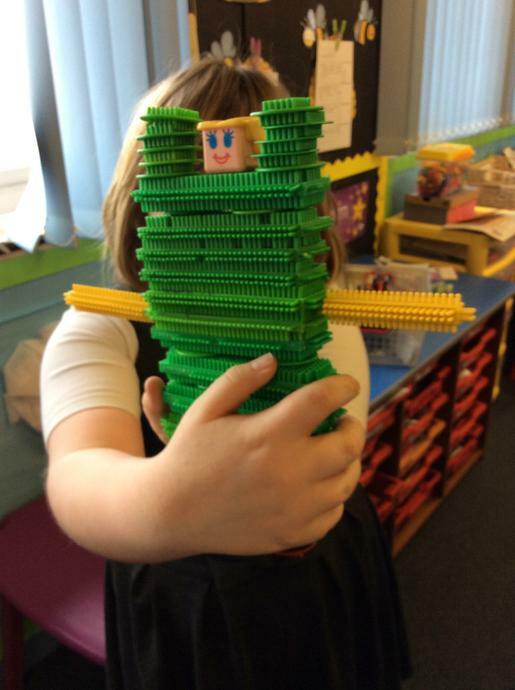 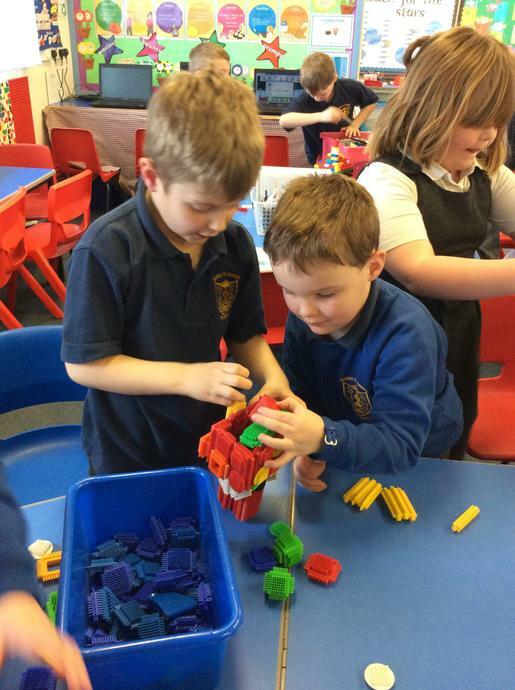 We have been learning about Christopher Columbus and Neil Armstrong in topic.Today we compared the two explorers and tried to build our own rocket models from different materials. 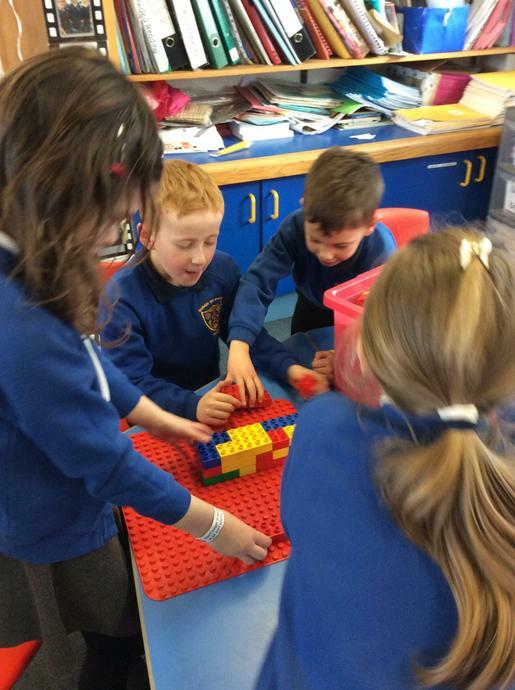 We tried really hard to work well together in our teams. 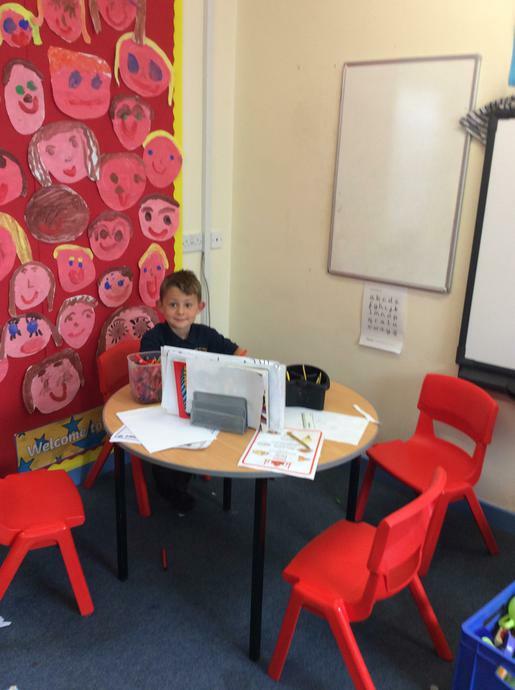 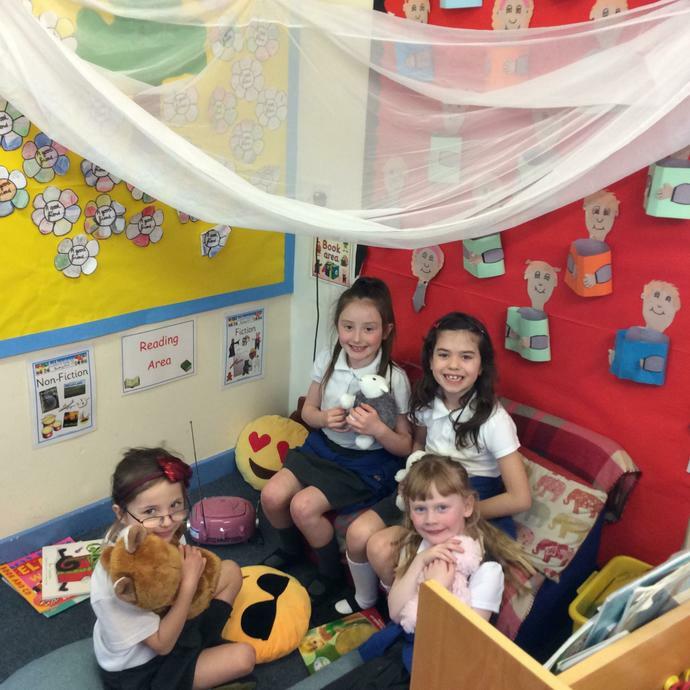 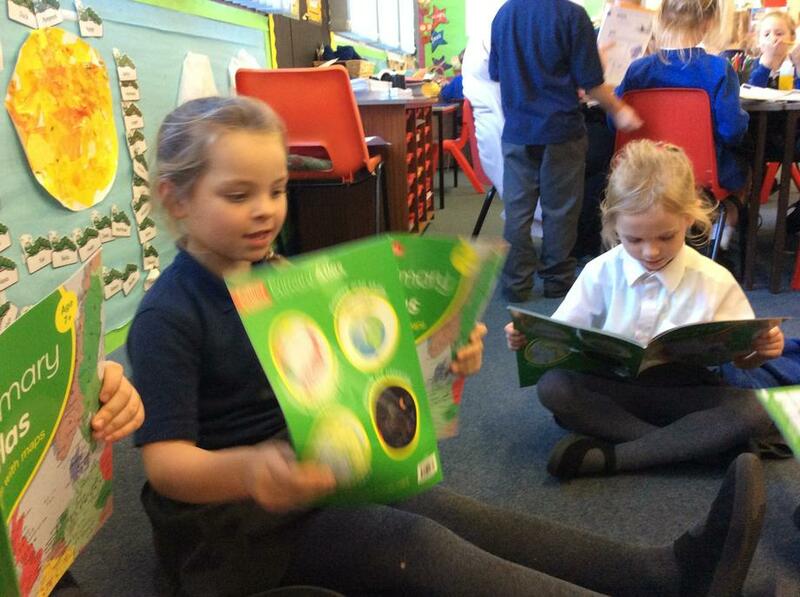 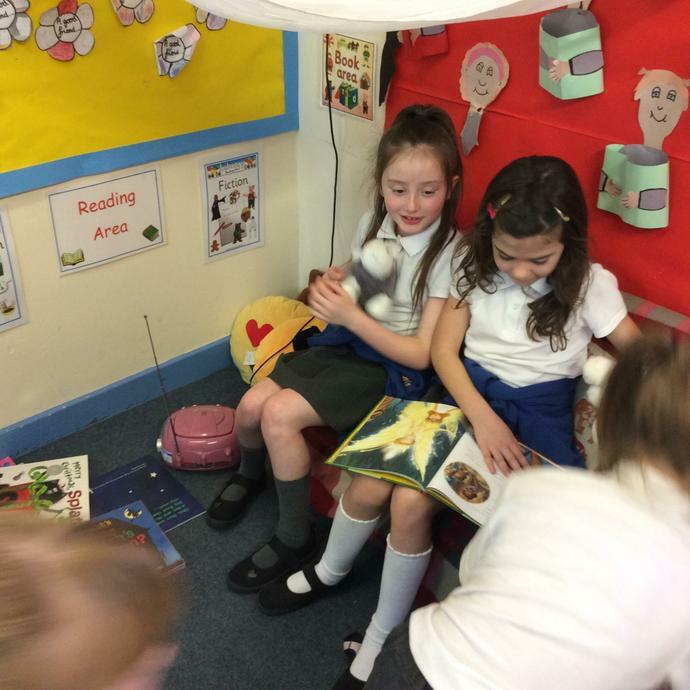 Enjoying our new independent learning area! 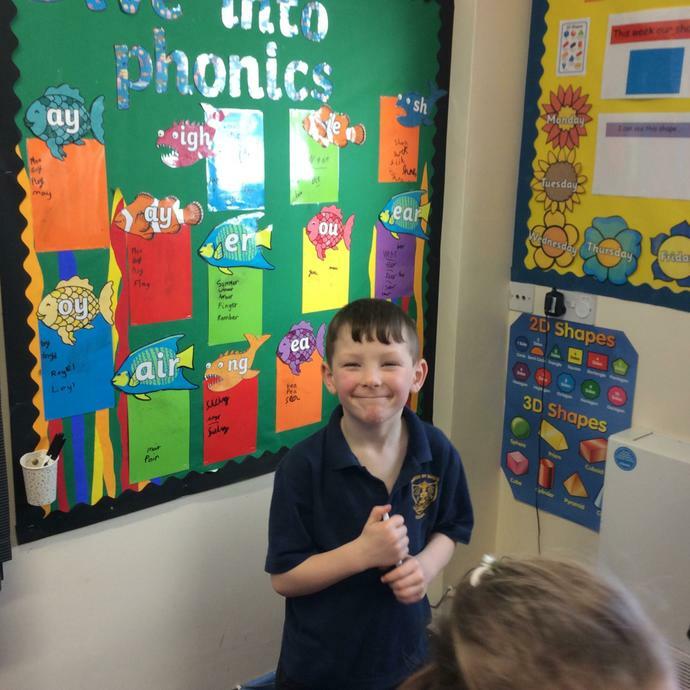 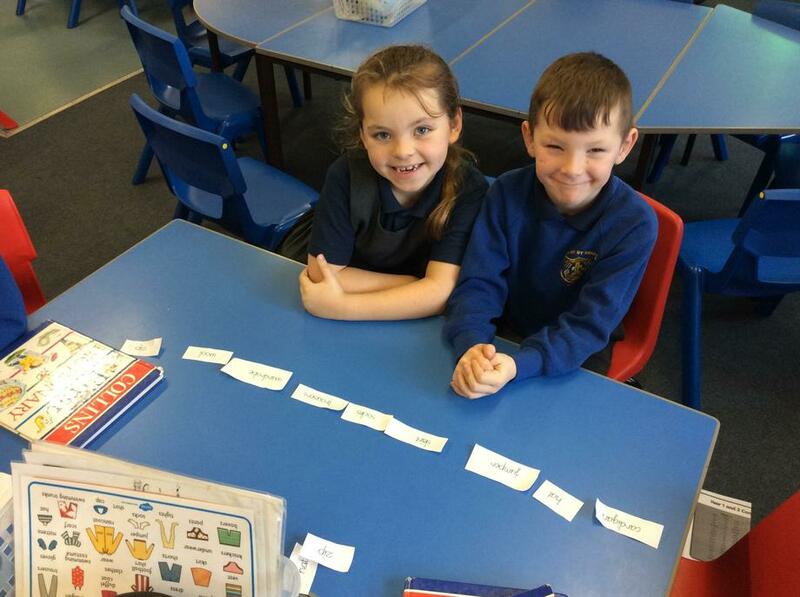 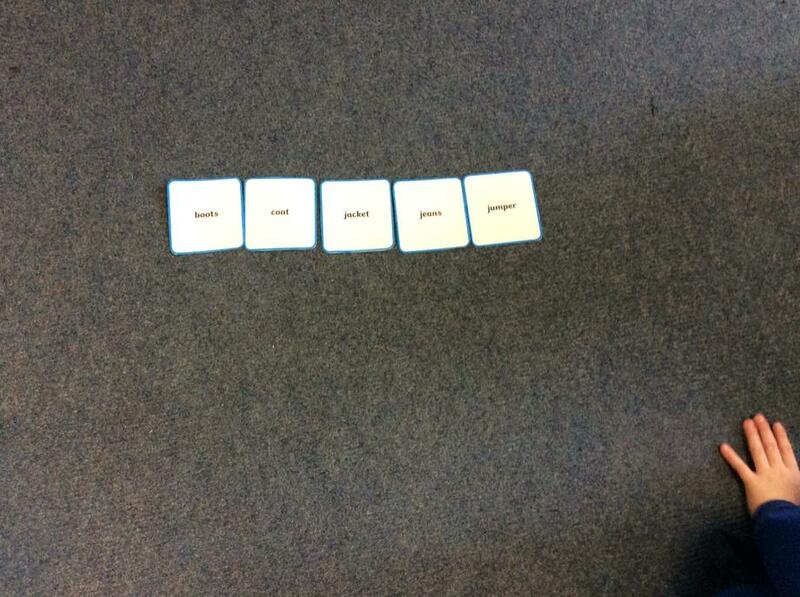 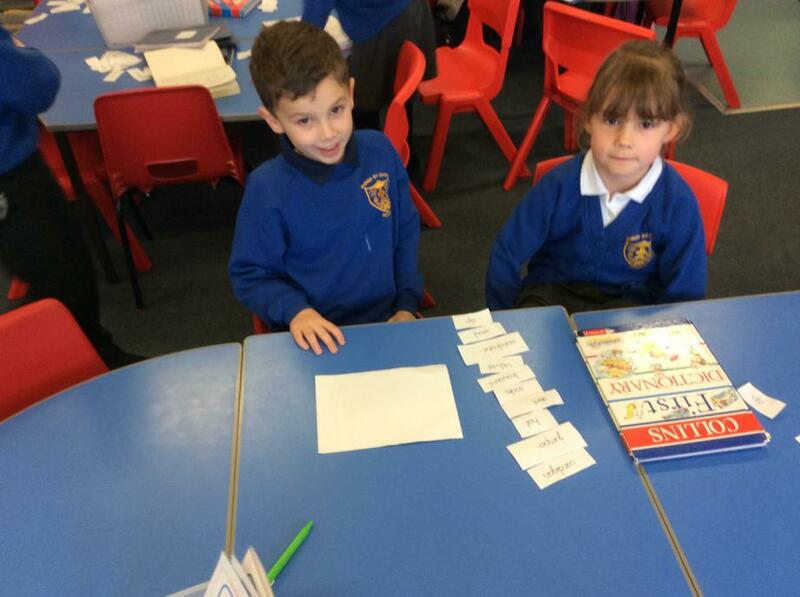 We used the programme Clicker7 to build sentences in literacy today. 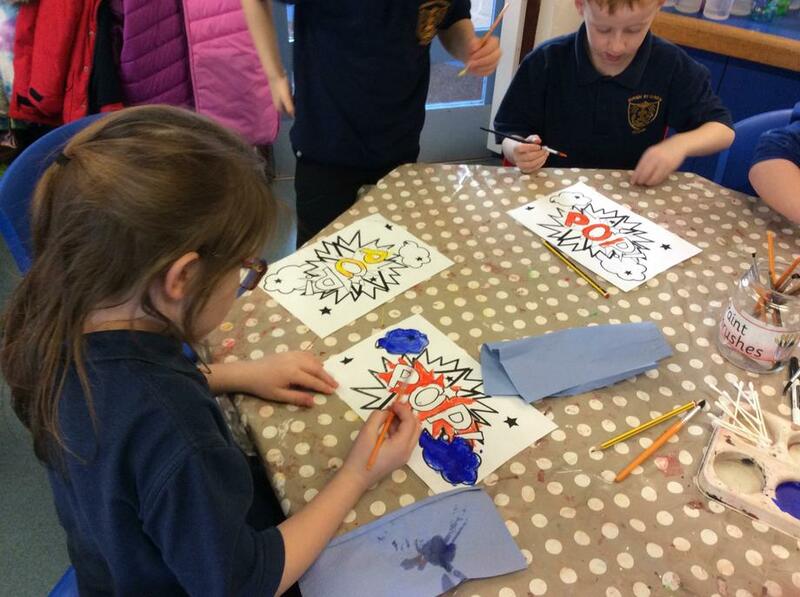 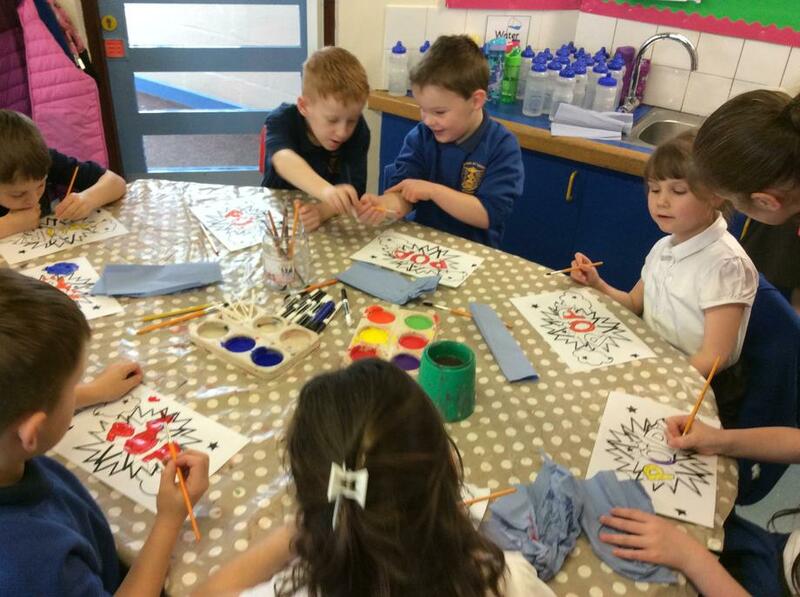 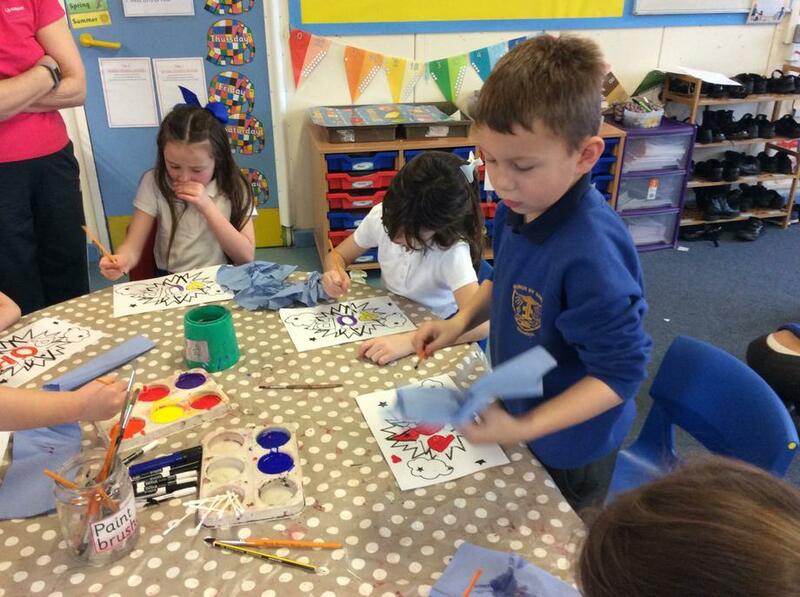 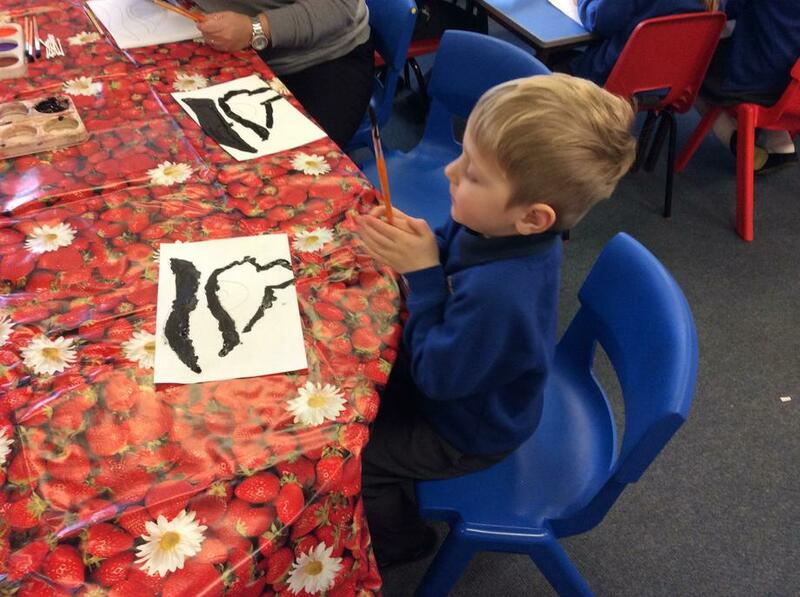 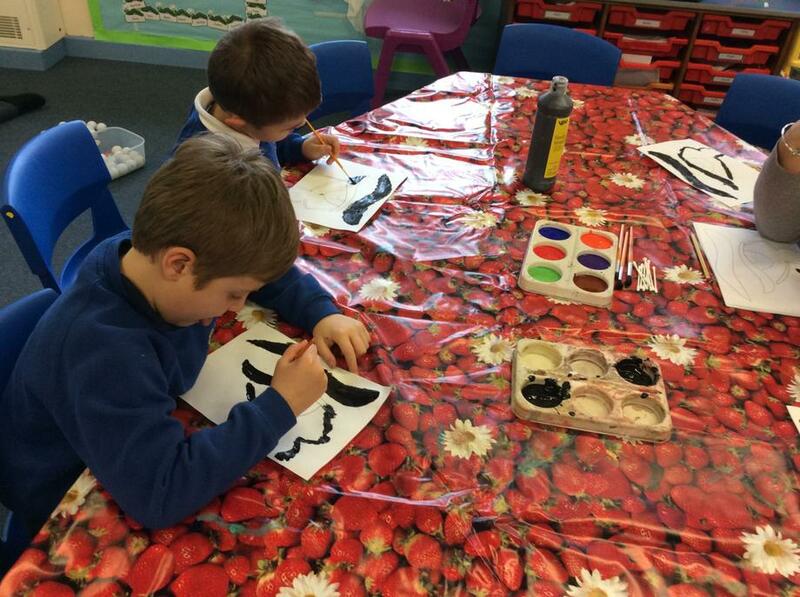 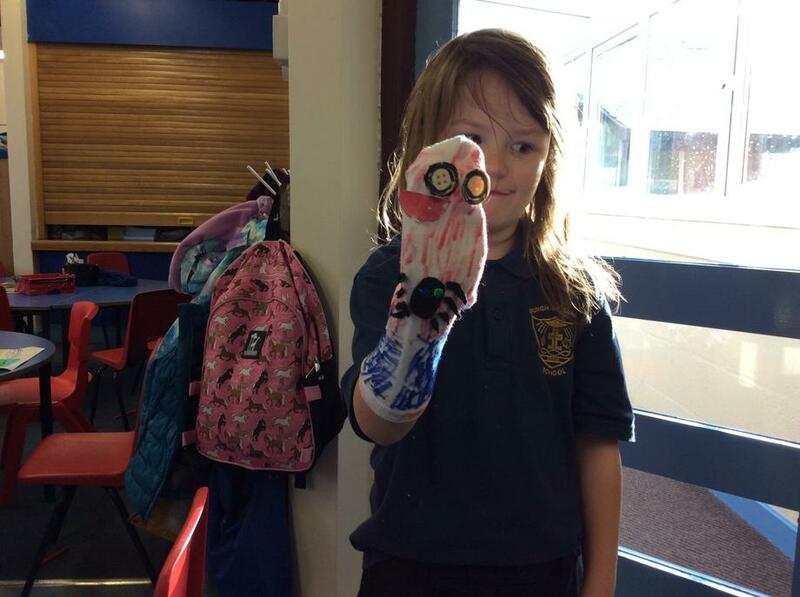 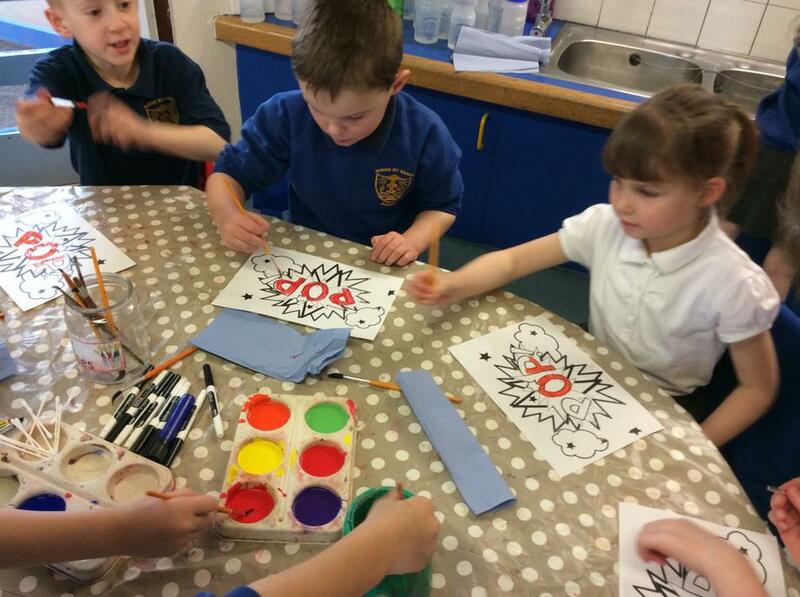 Painting in the style of Roy Lichtenstein! 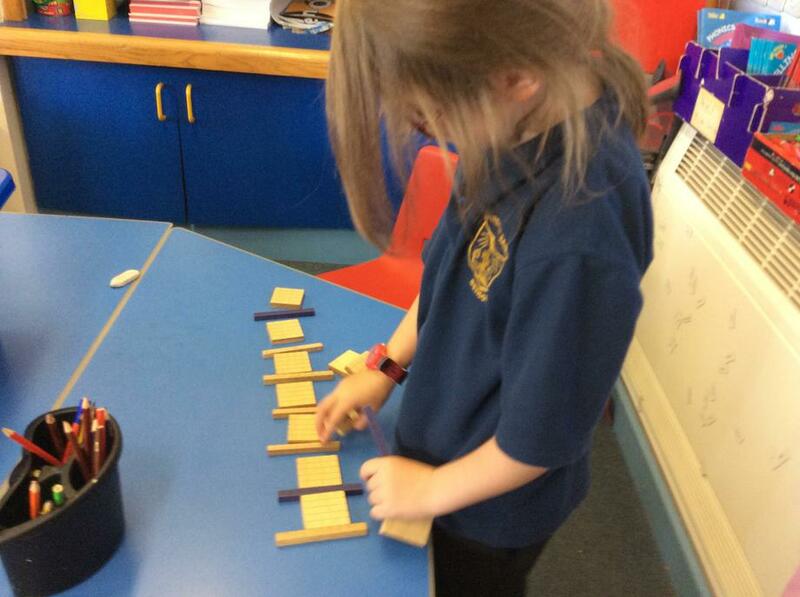 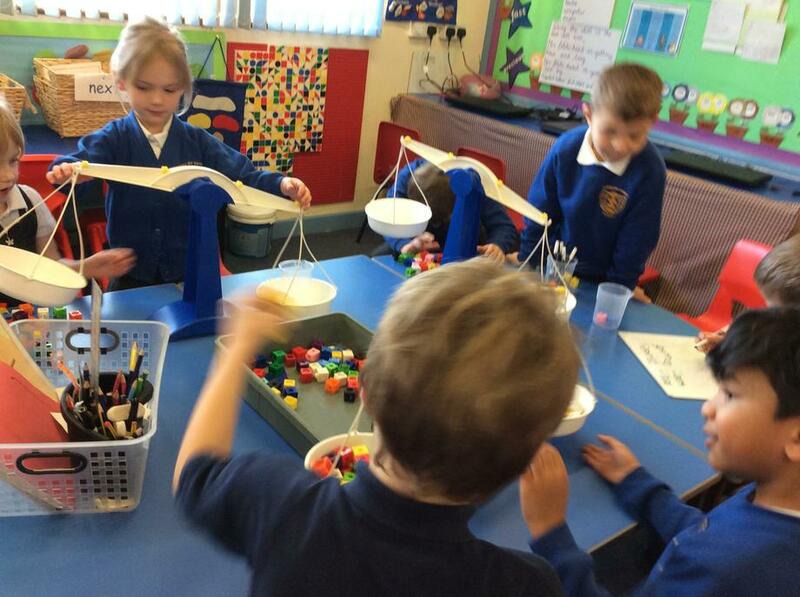 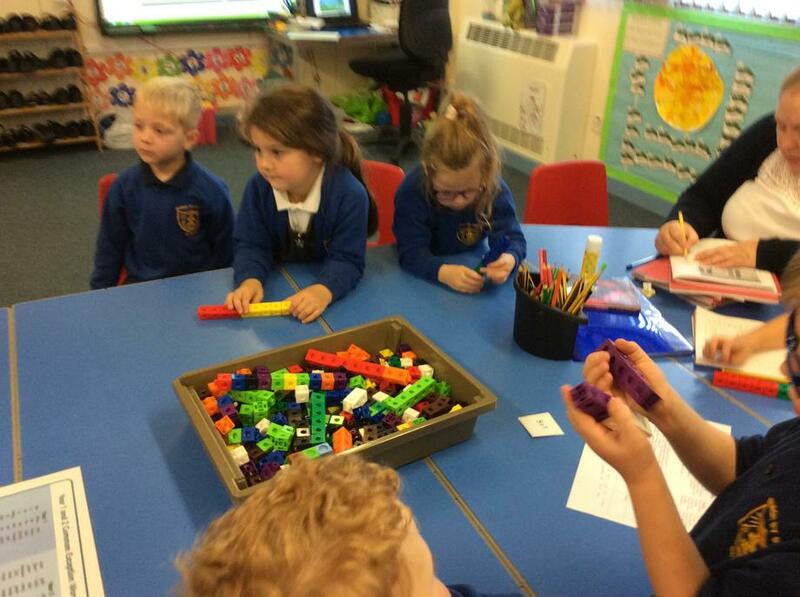 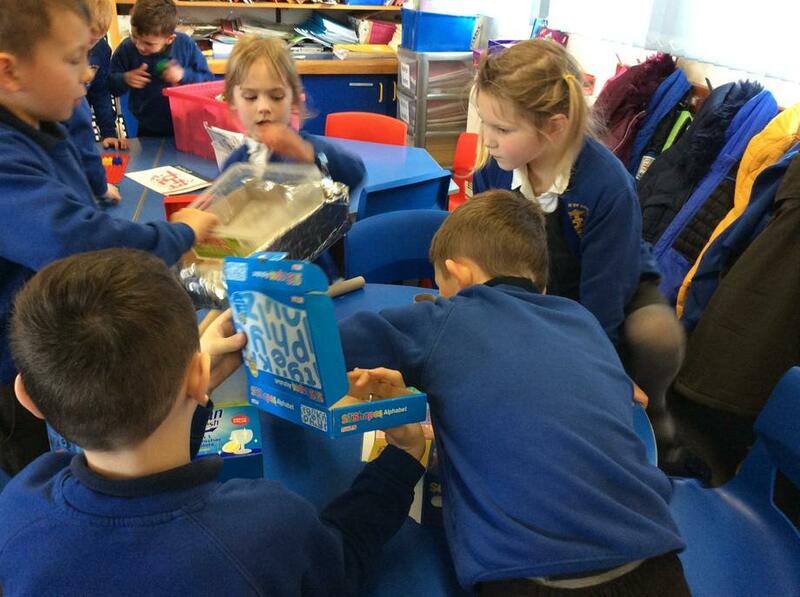 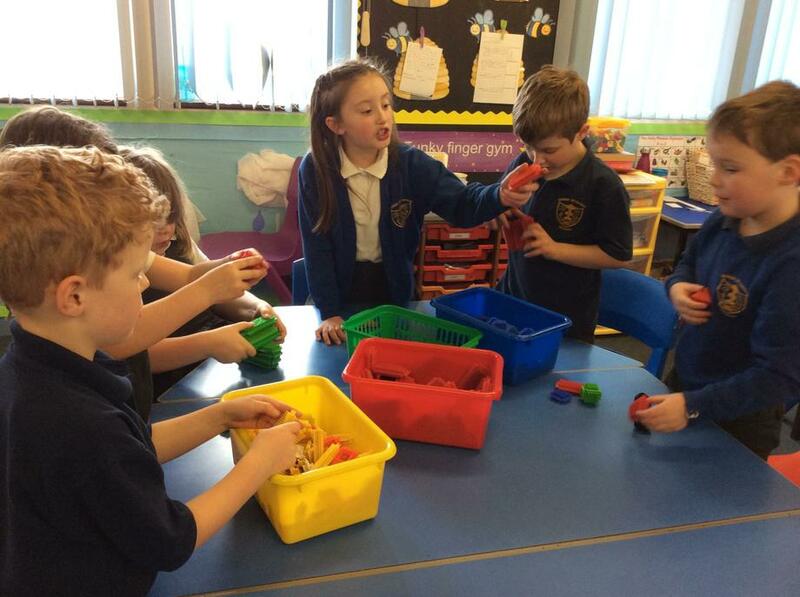 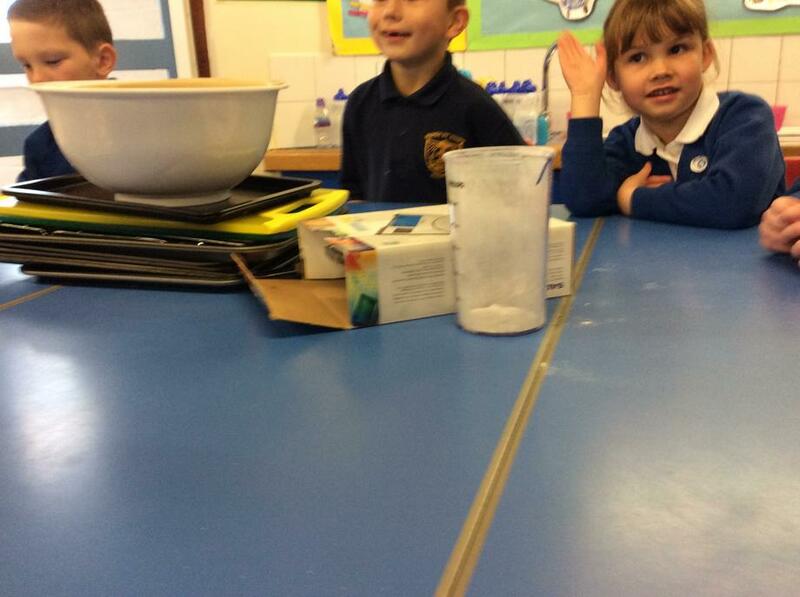 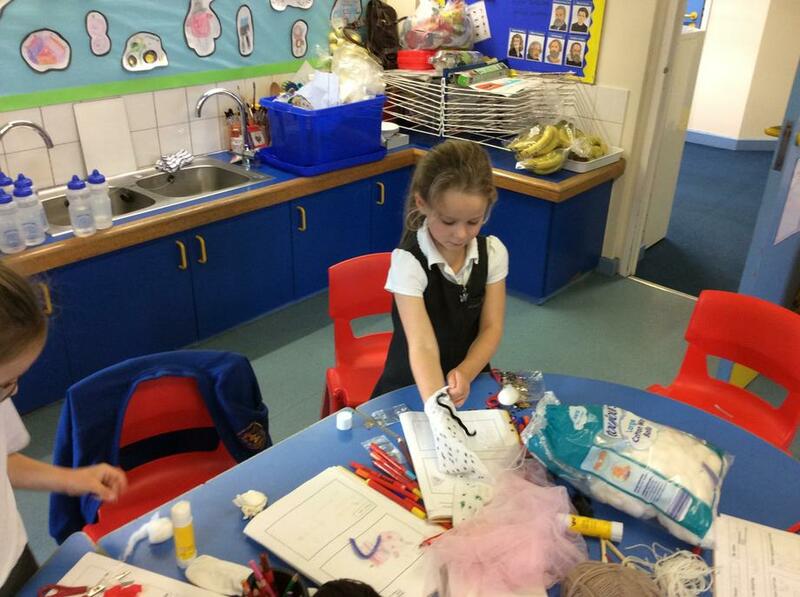 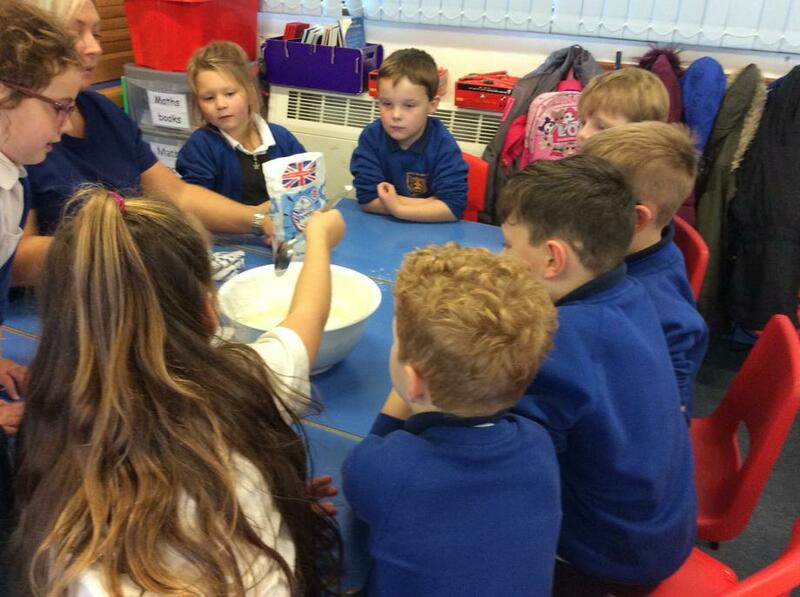 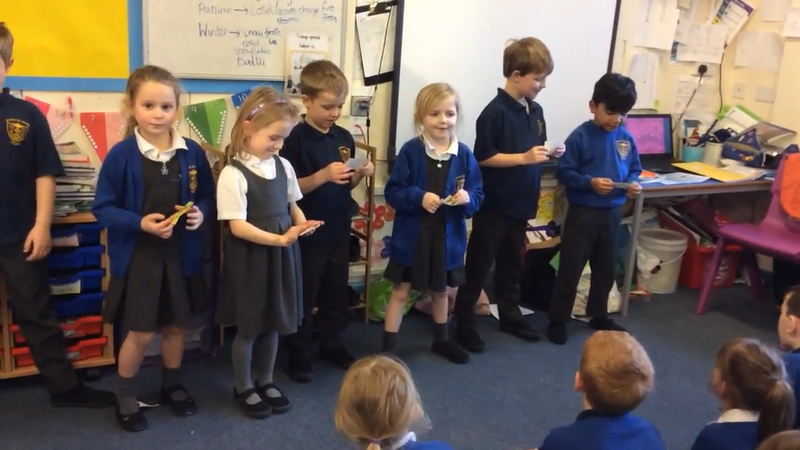 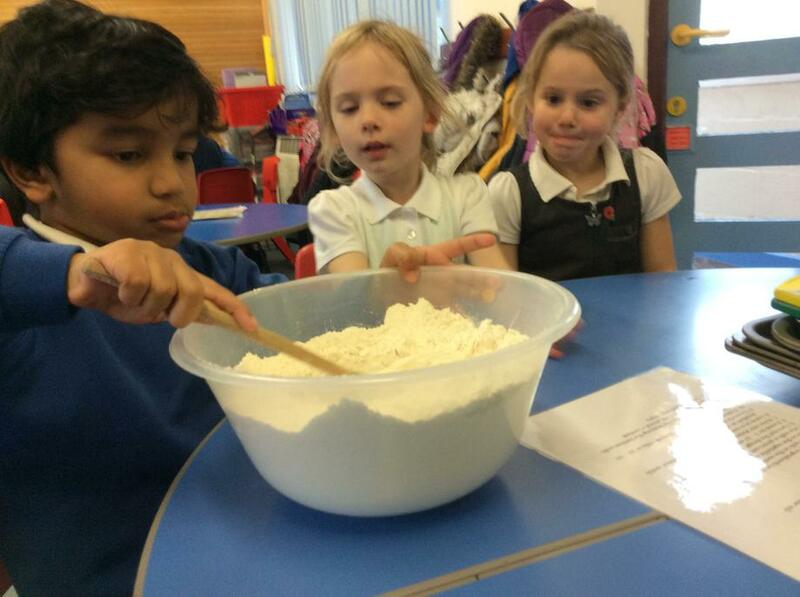 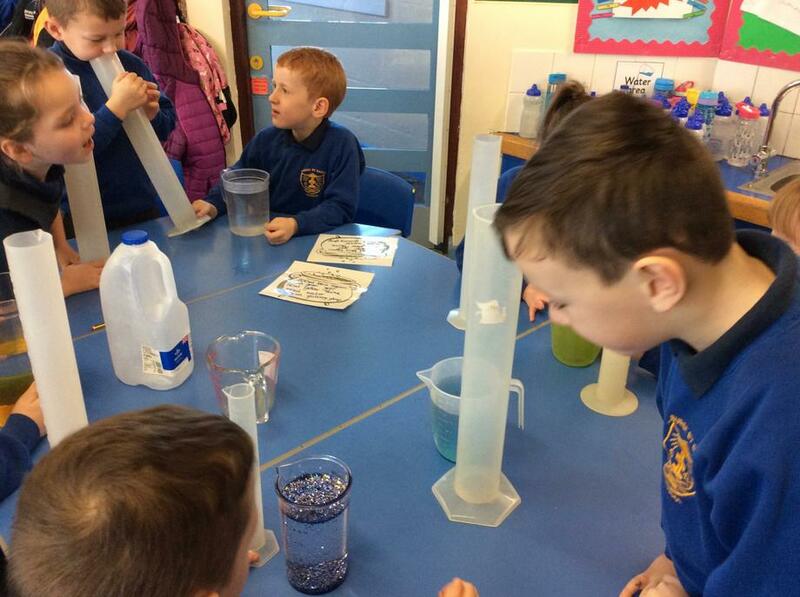 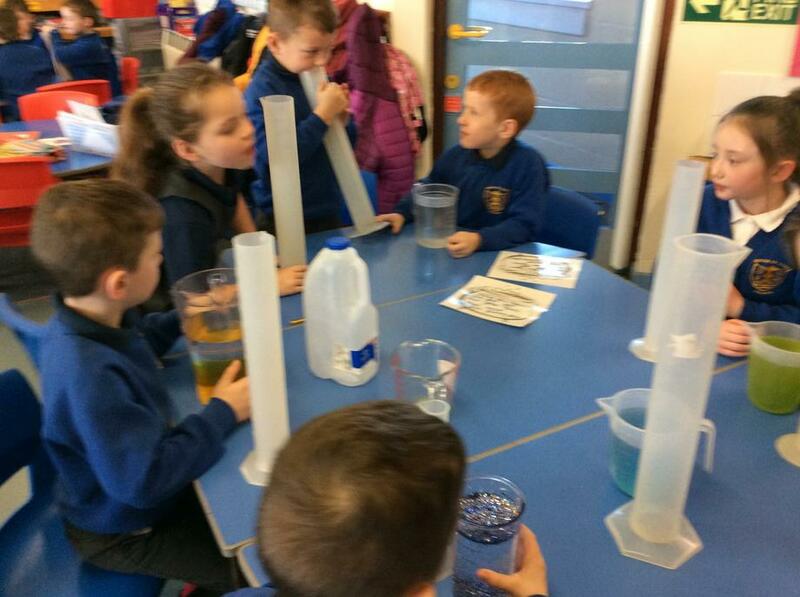 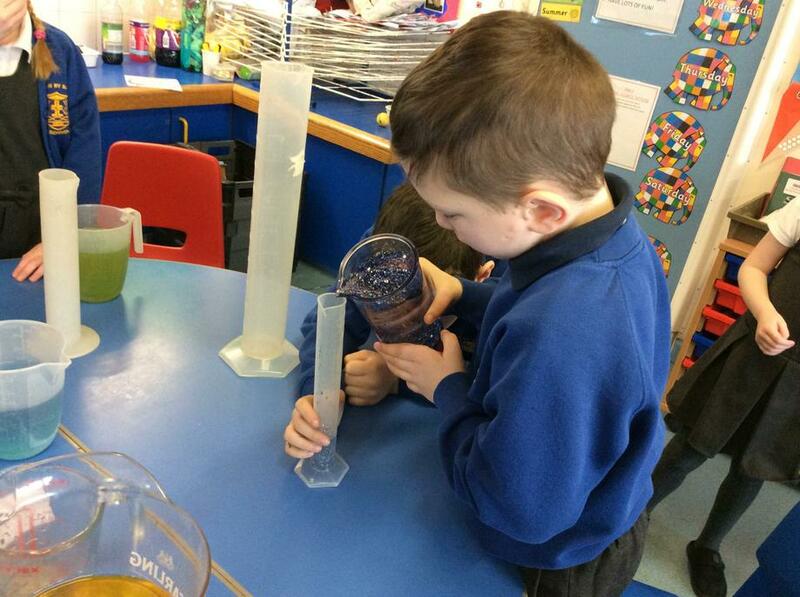 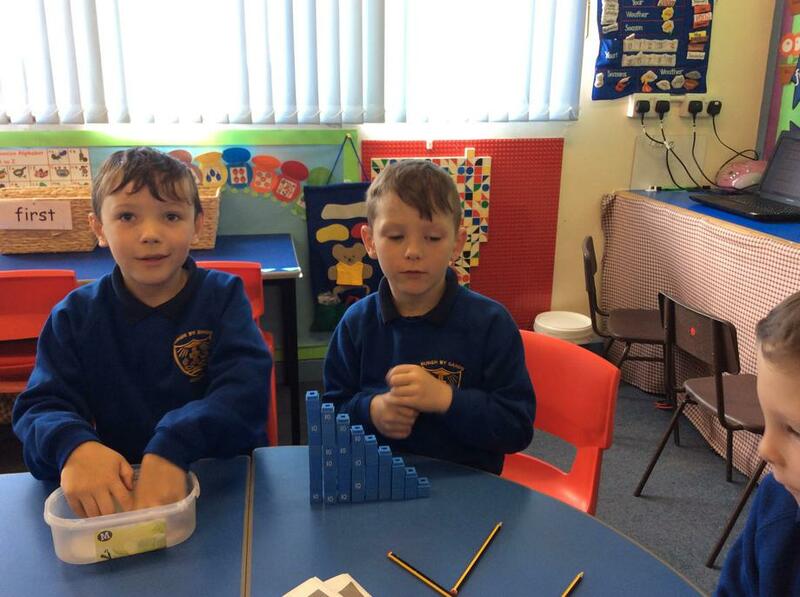 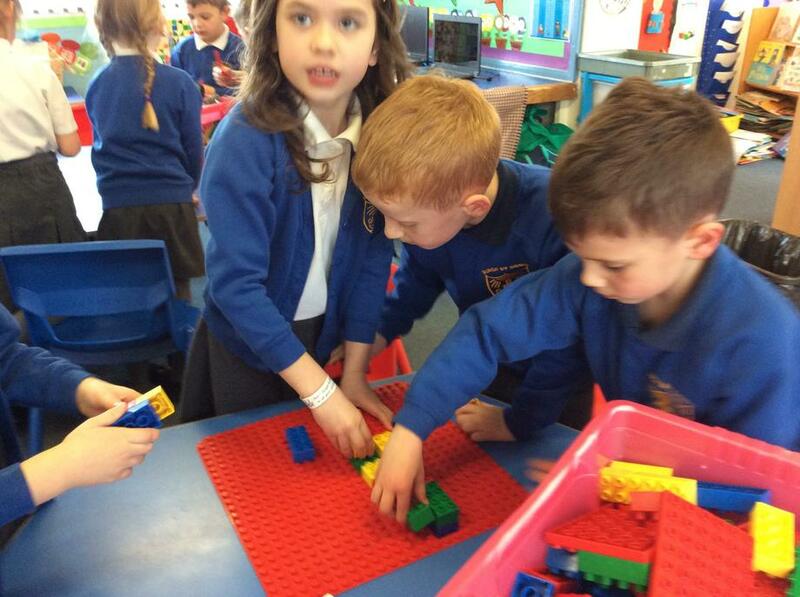 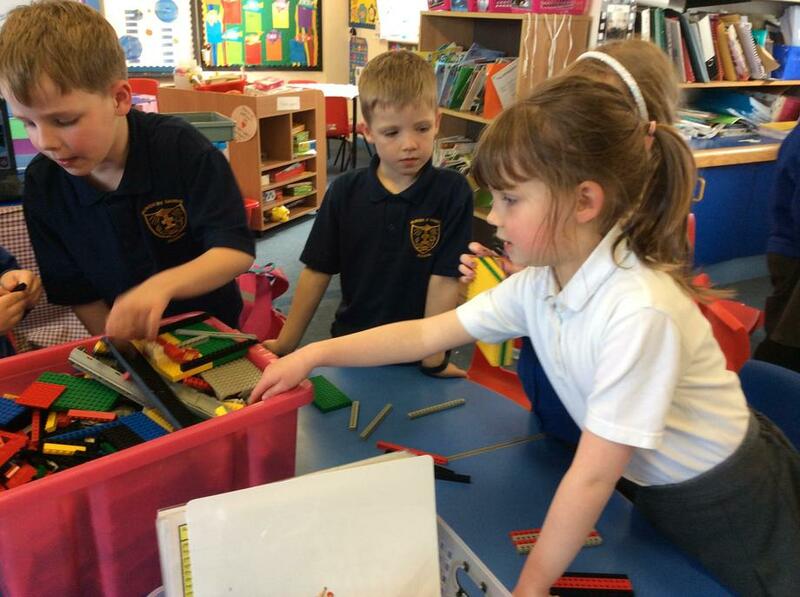 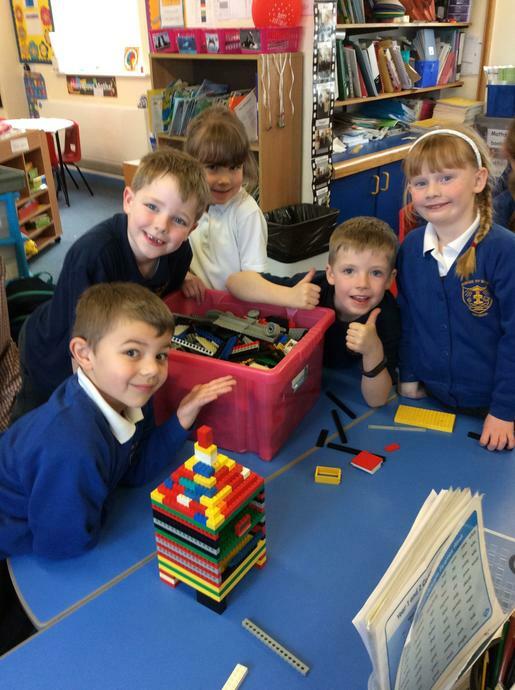 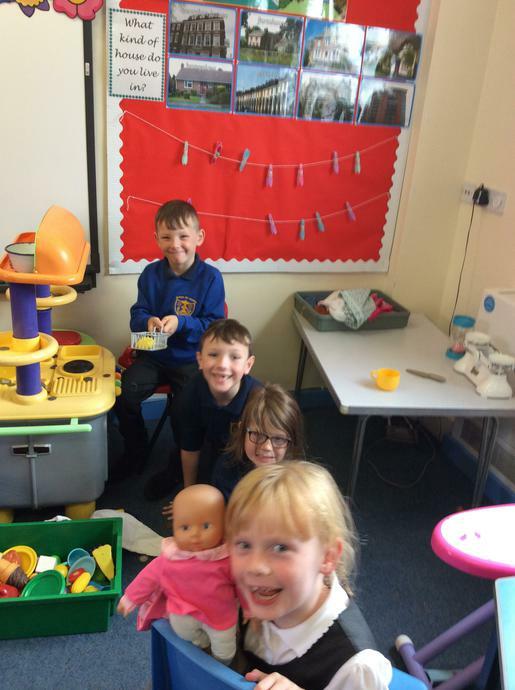 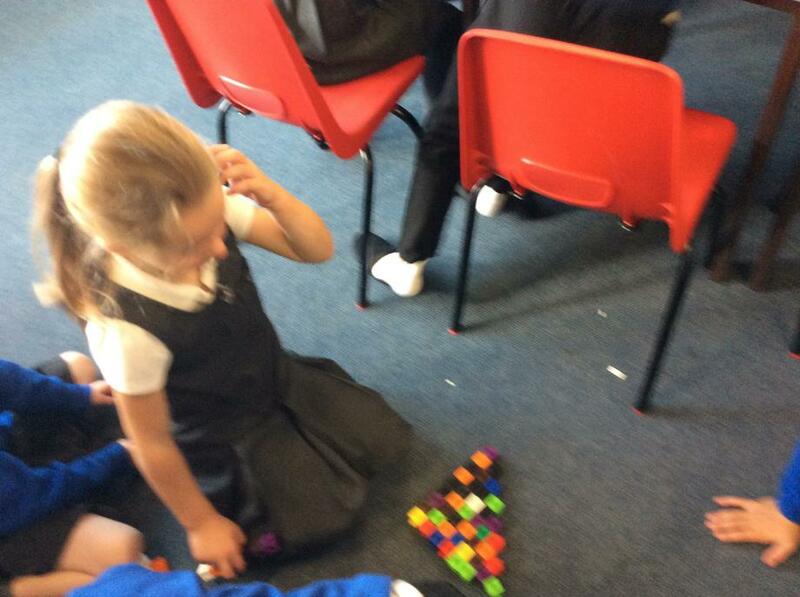 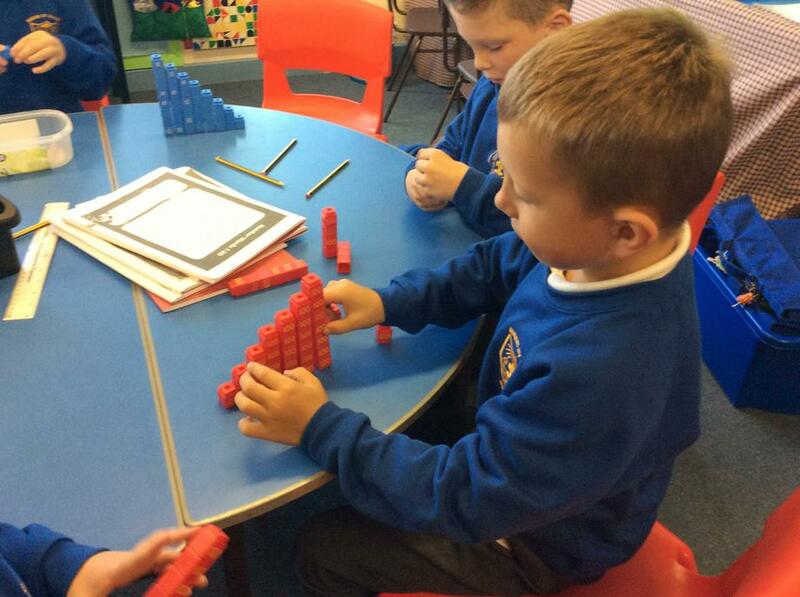 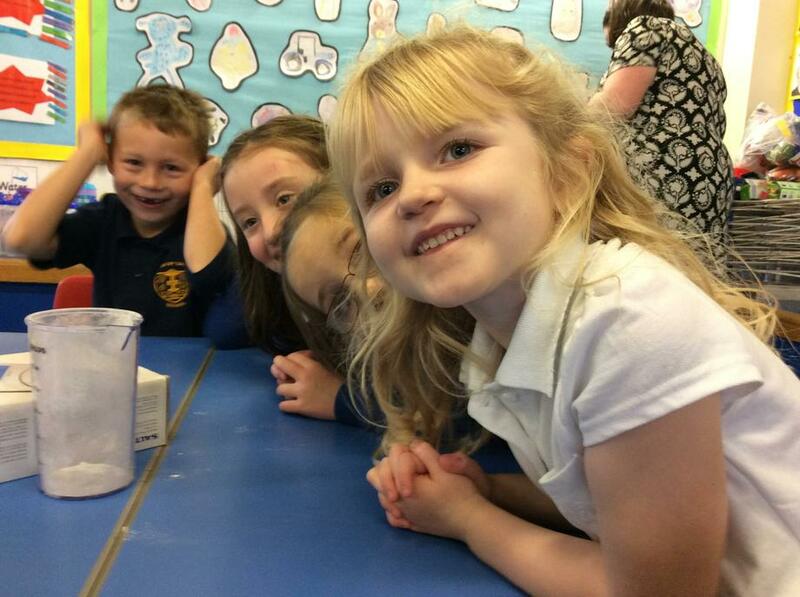 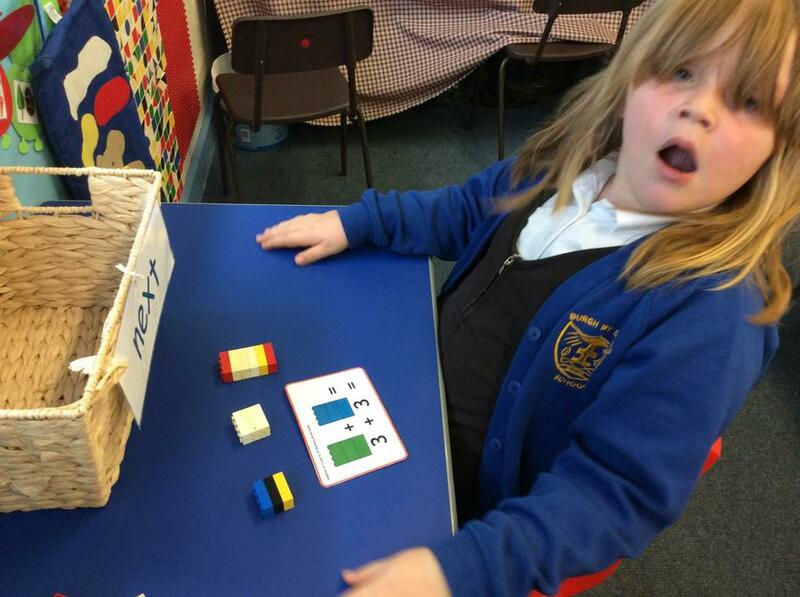 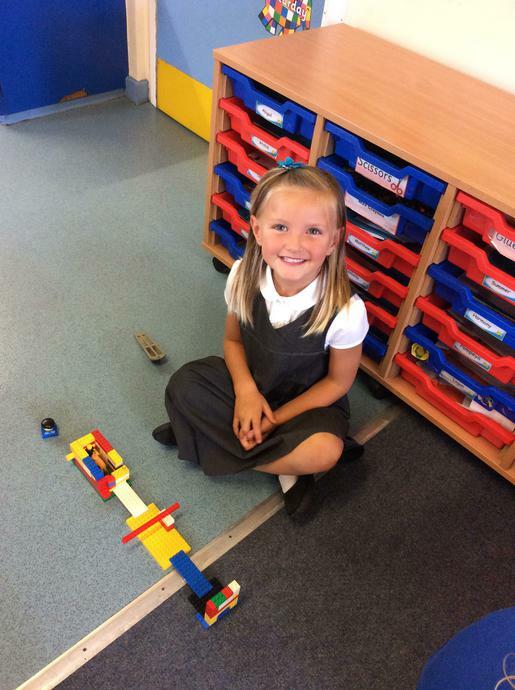 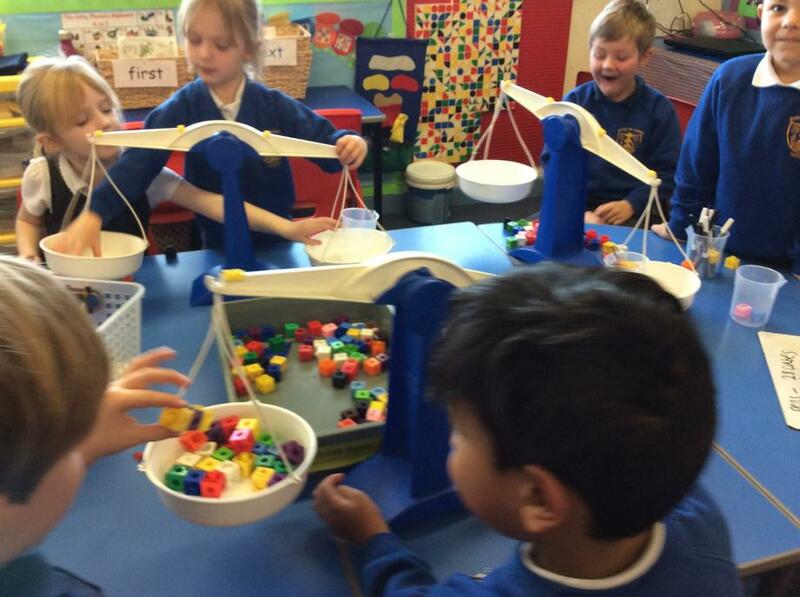 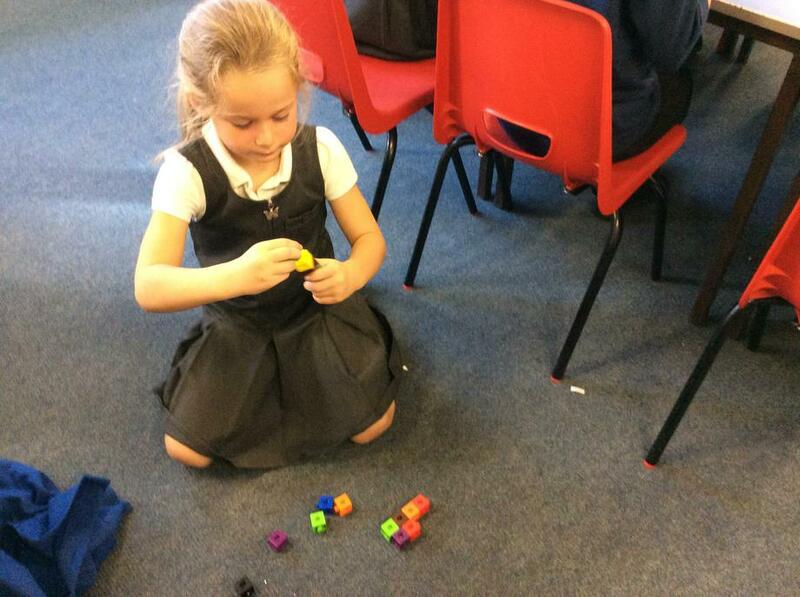 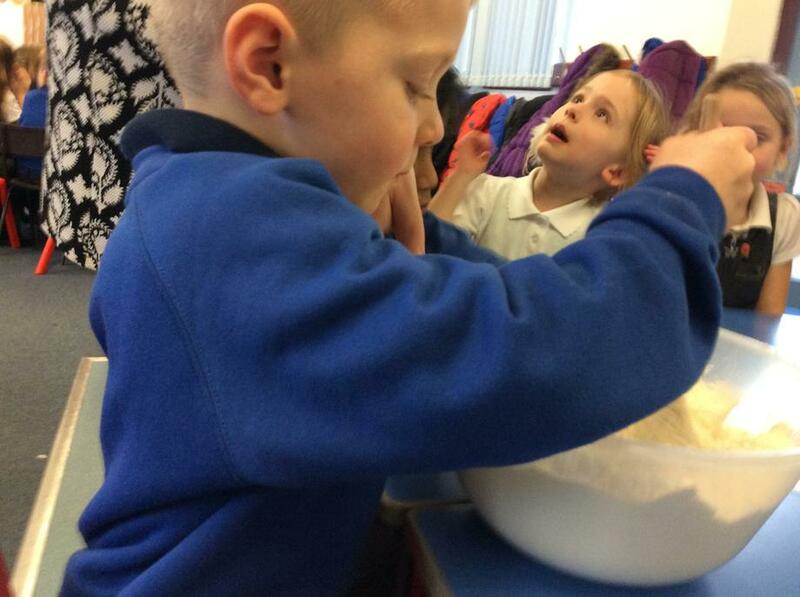 We have had great fun in maths this week.Year 1 children have been practising weighing. 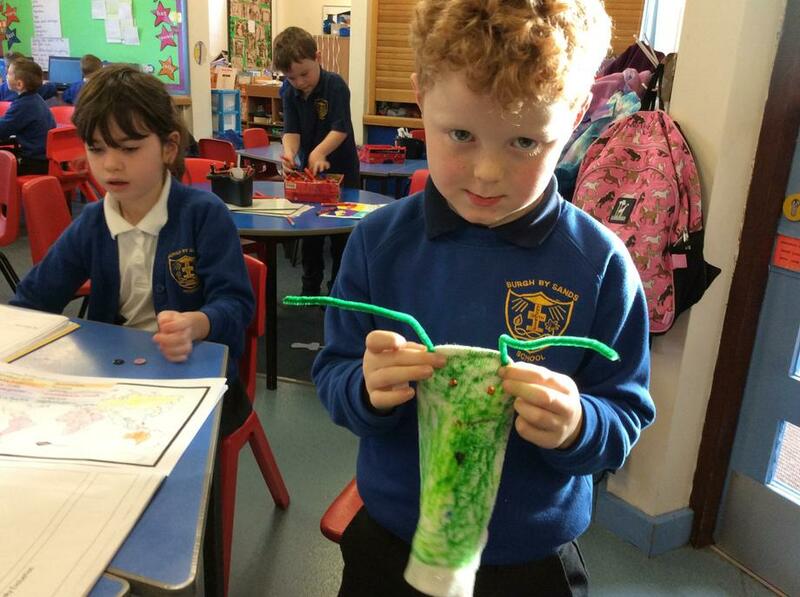 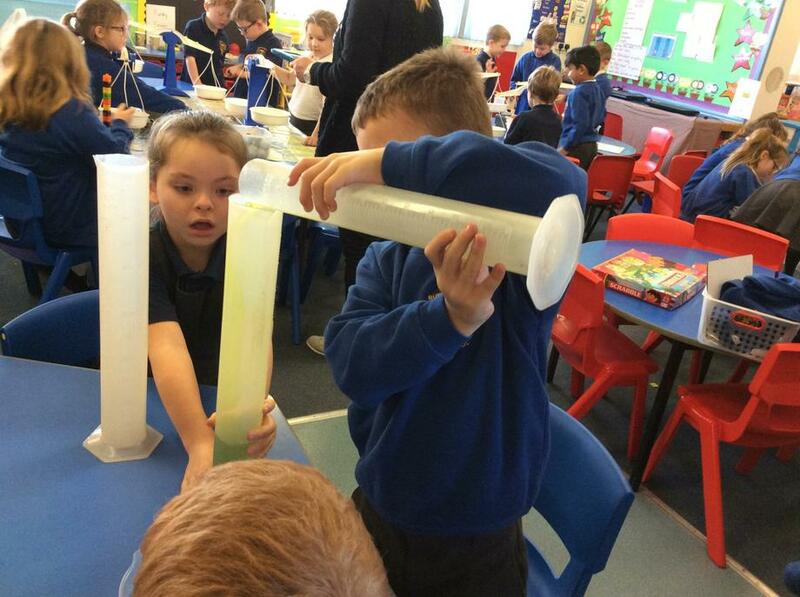 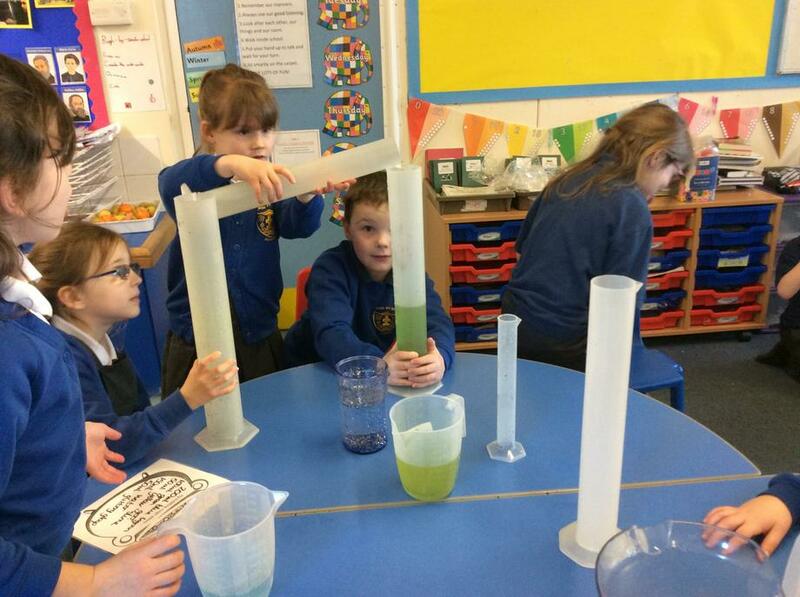 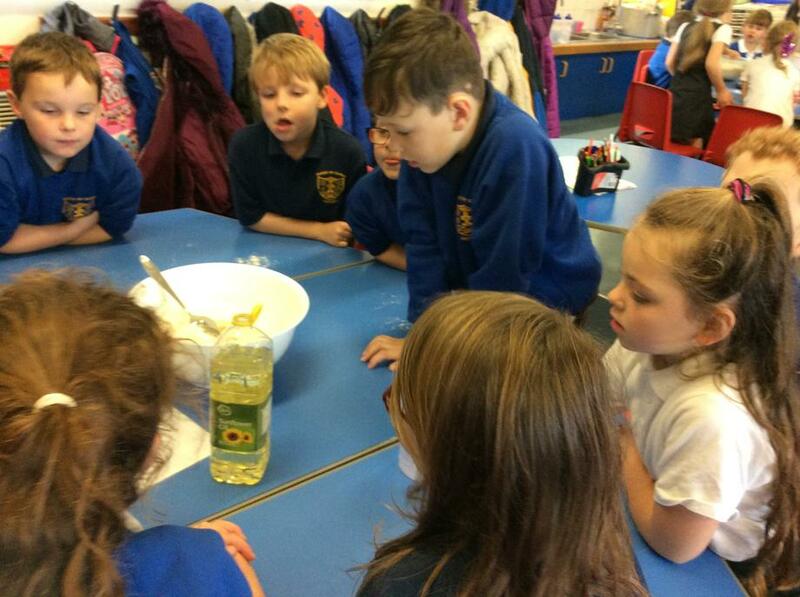 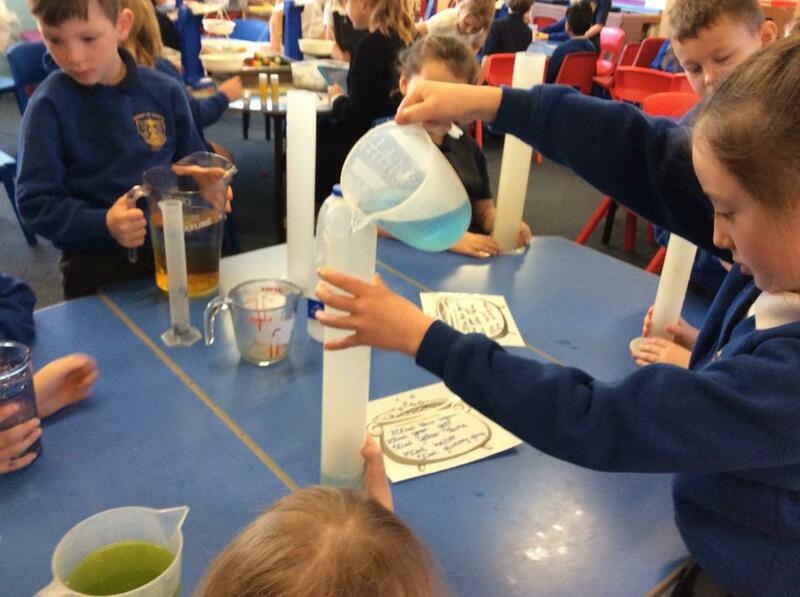 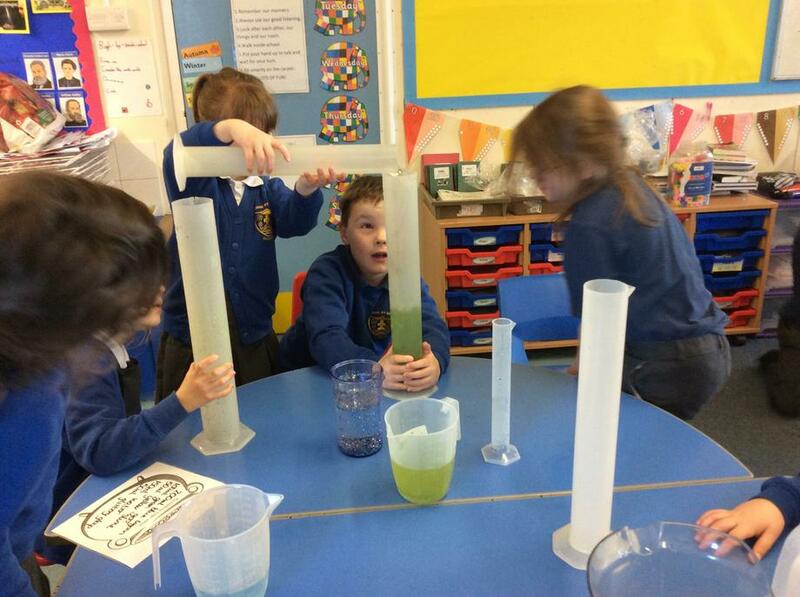 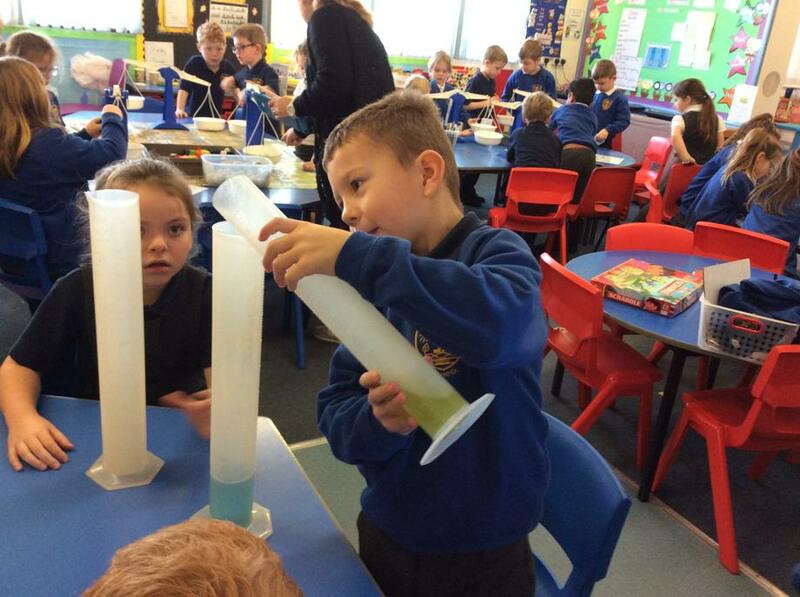 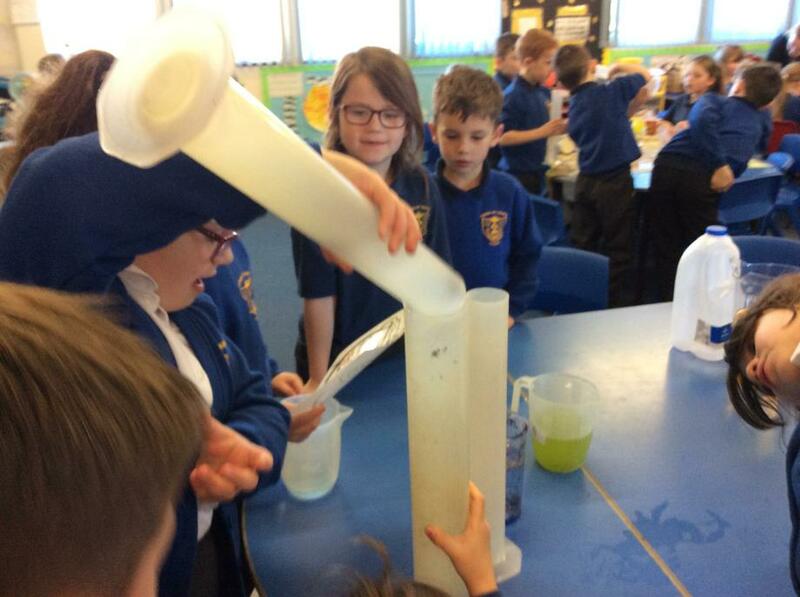 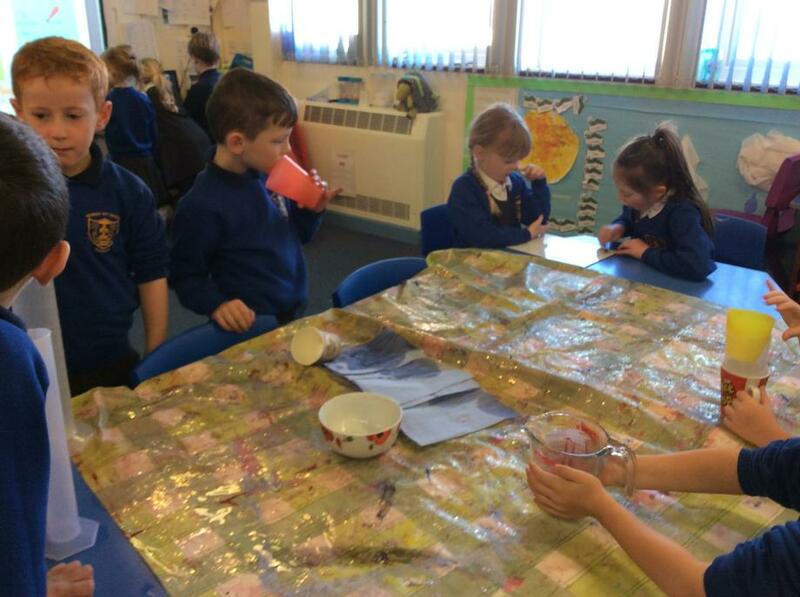 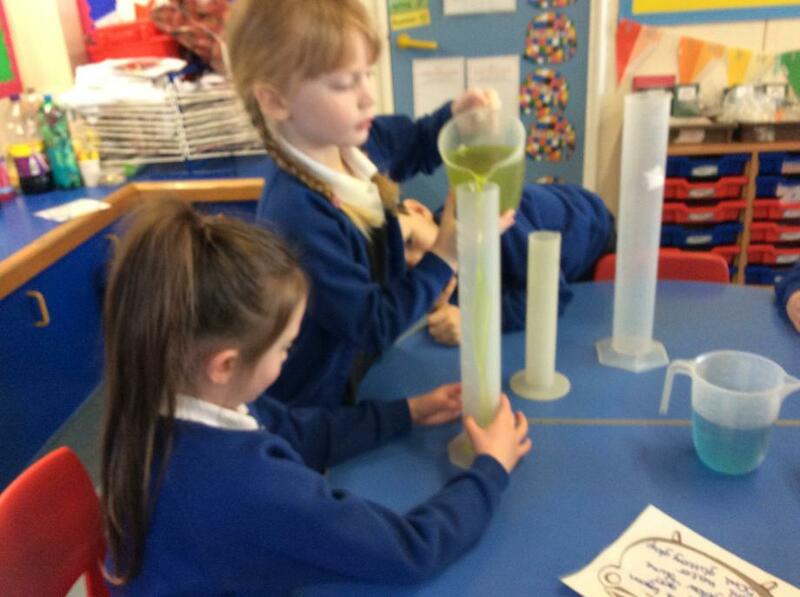 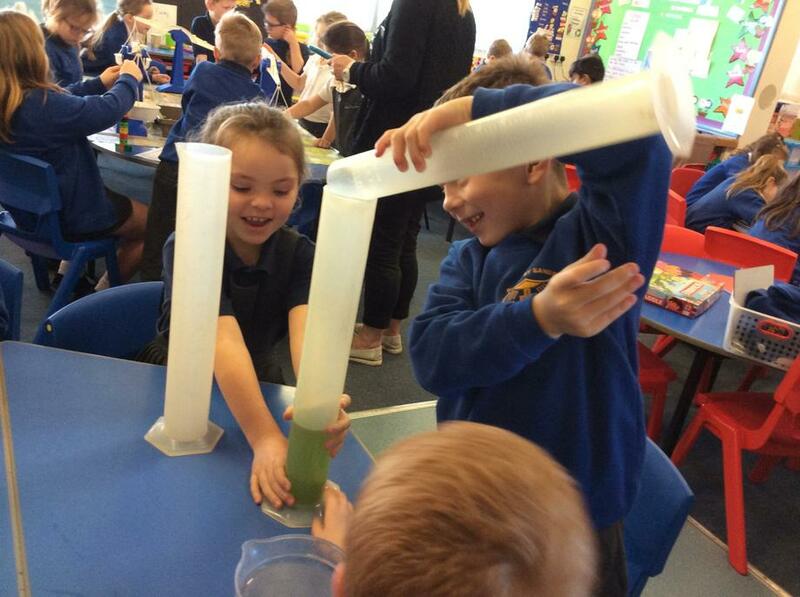 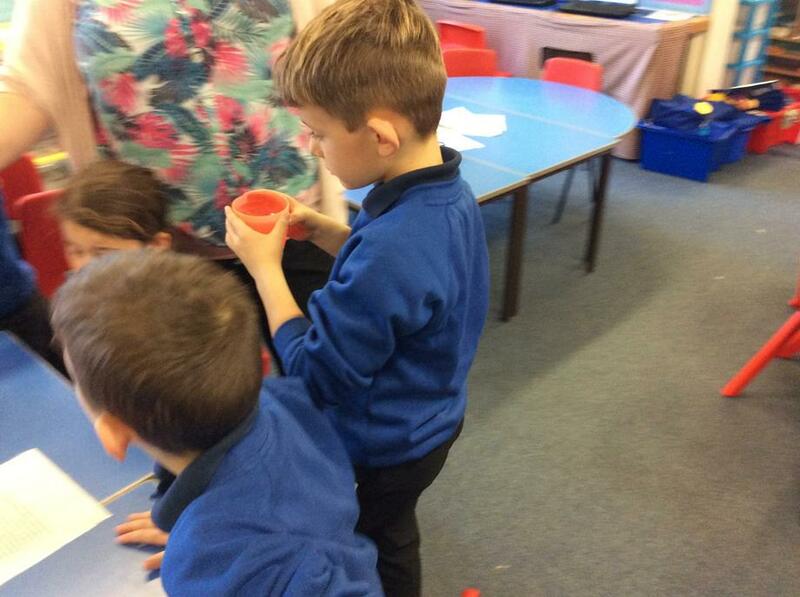 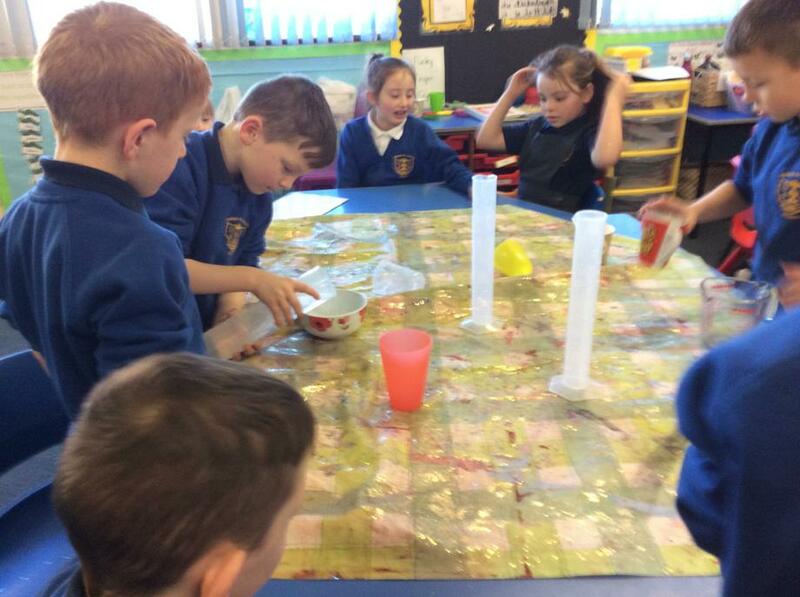 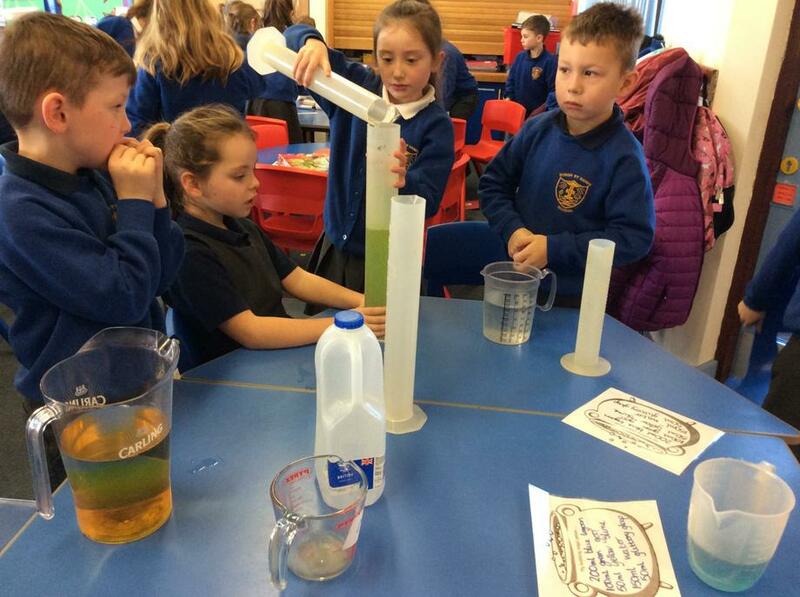 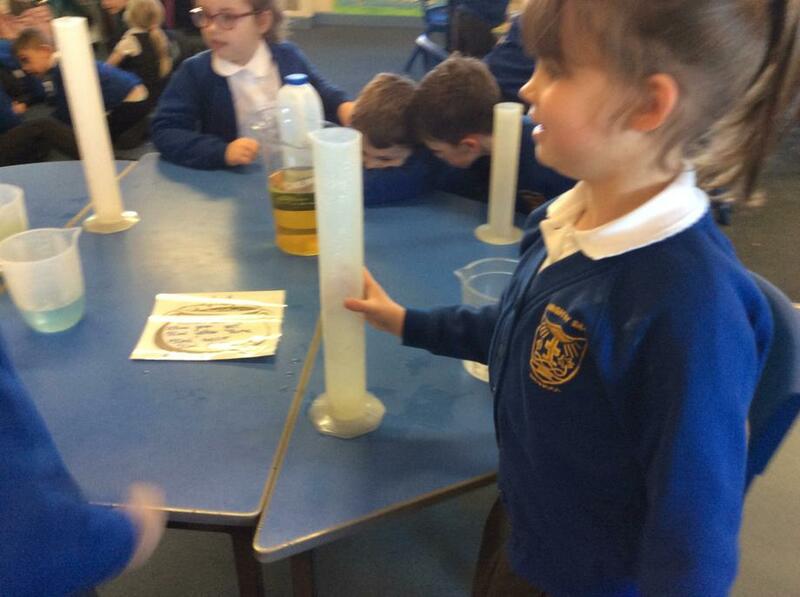 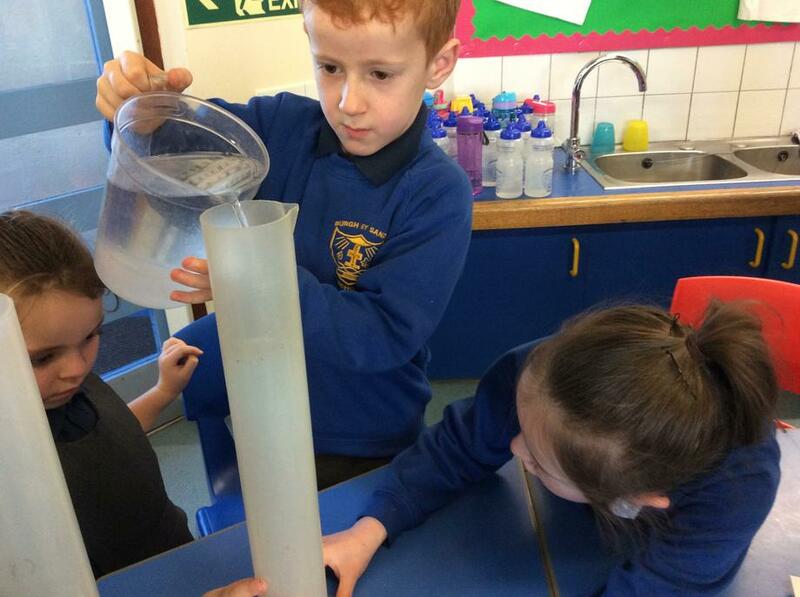 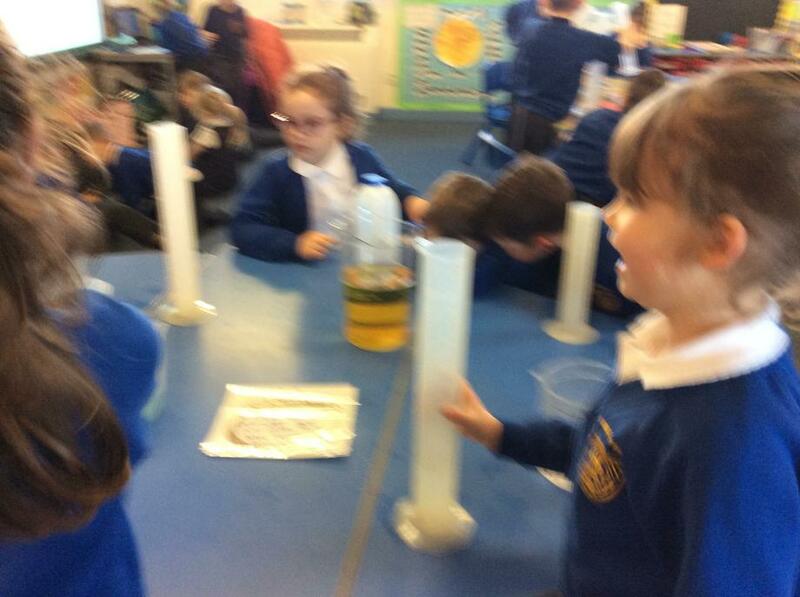 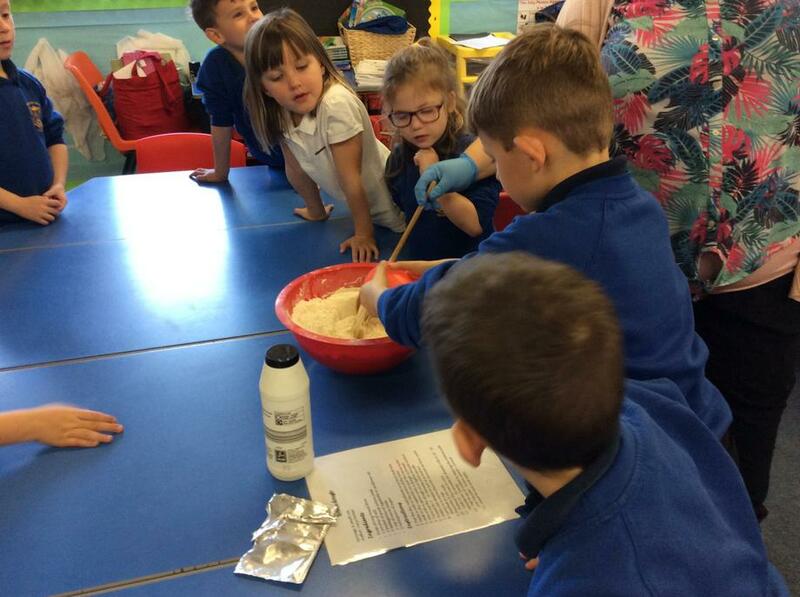 Year 2 children have been looking at capacity and made some magic potions to make the sun shine! 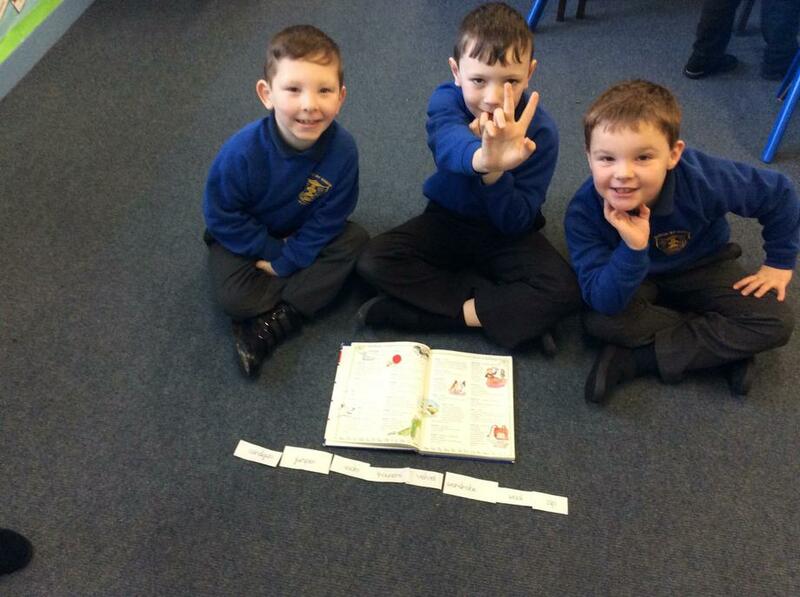 Our other group retelling the story. 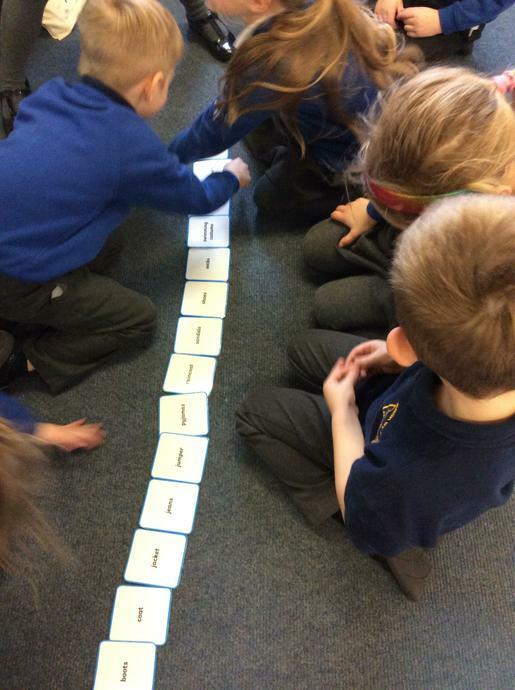 Today the year 1 children sequenced and retold the story of the enormous crocodile,after reading it in our guided reading sessions. 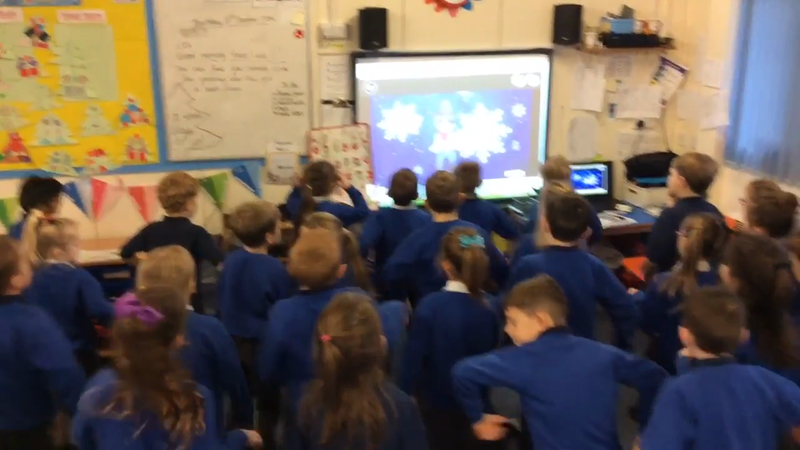 Go Noodle is our morning movement activity! 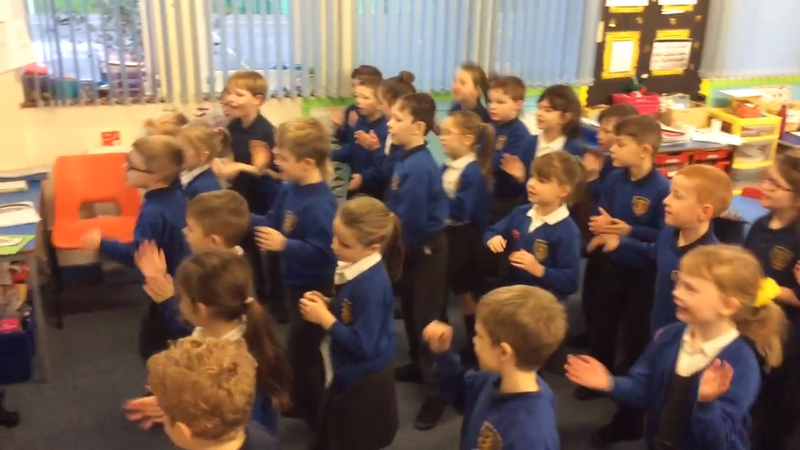 We love doing the songs and dances! 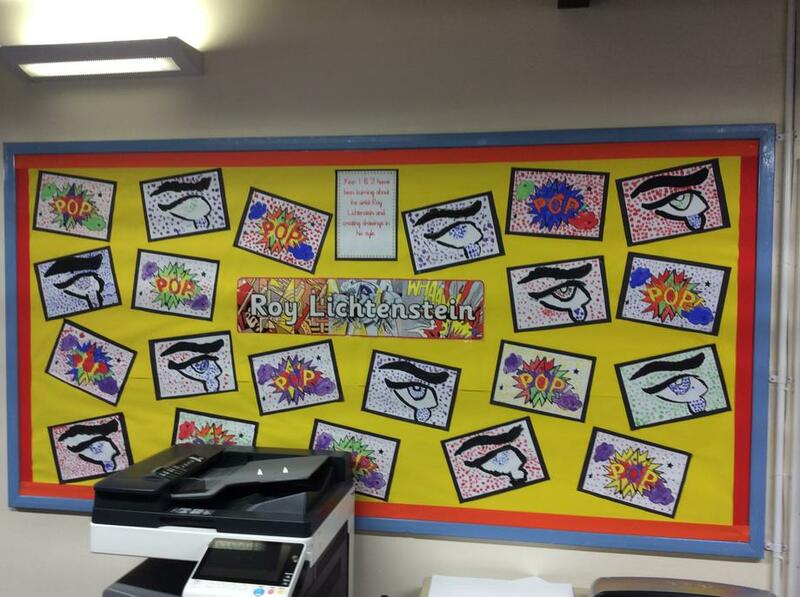 Our classroom is looking lovely with our new work on display. 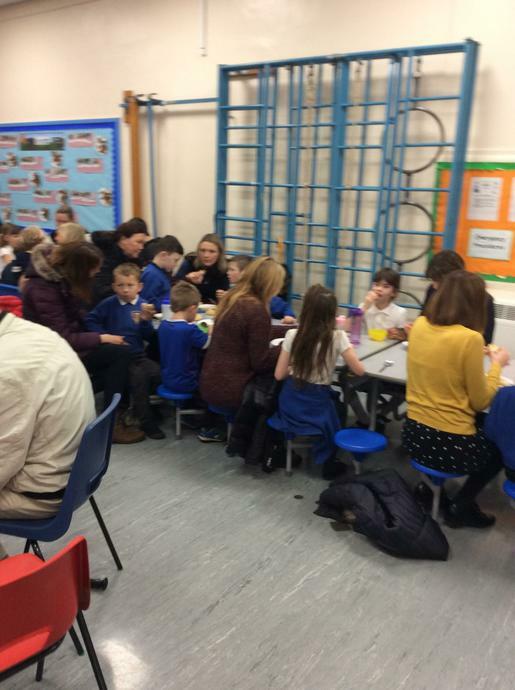 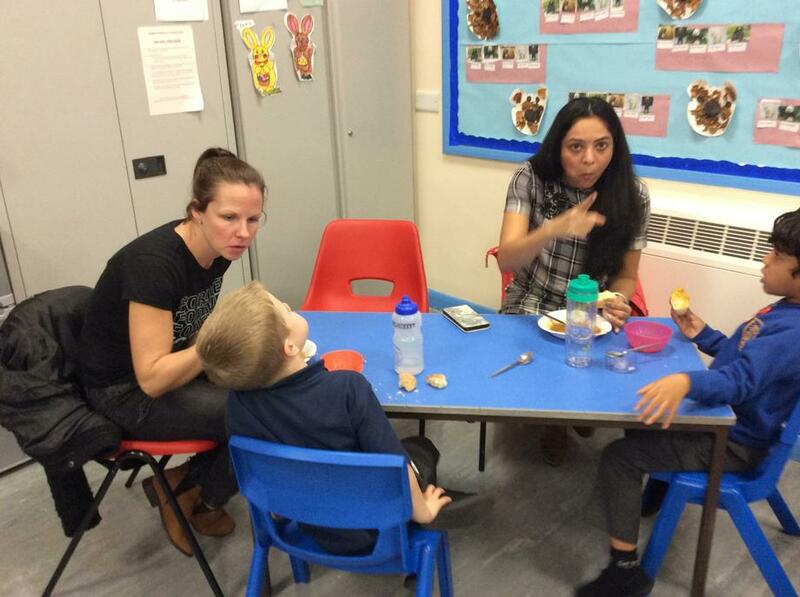 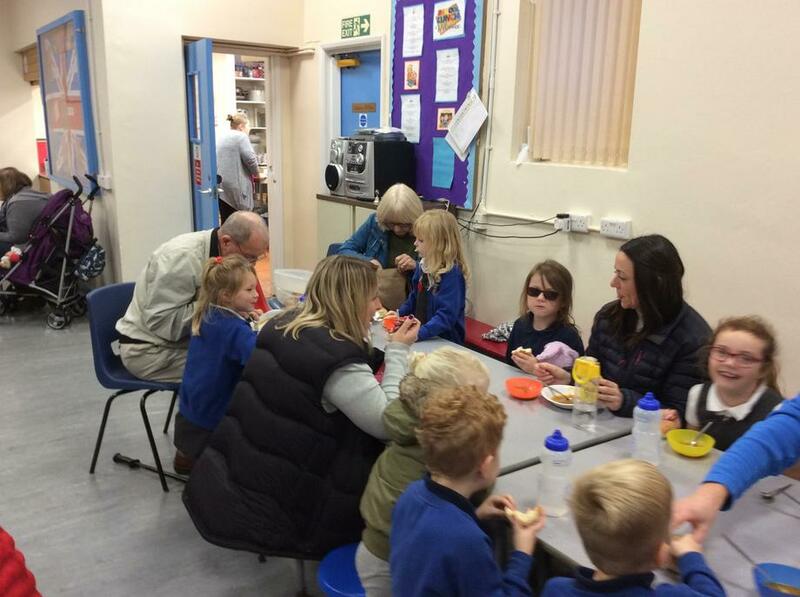 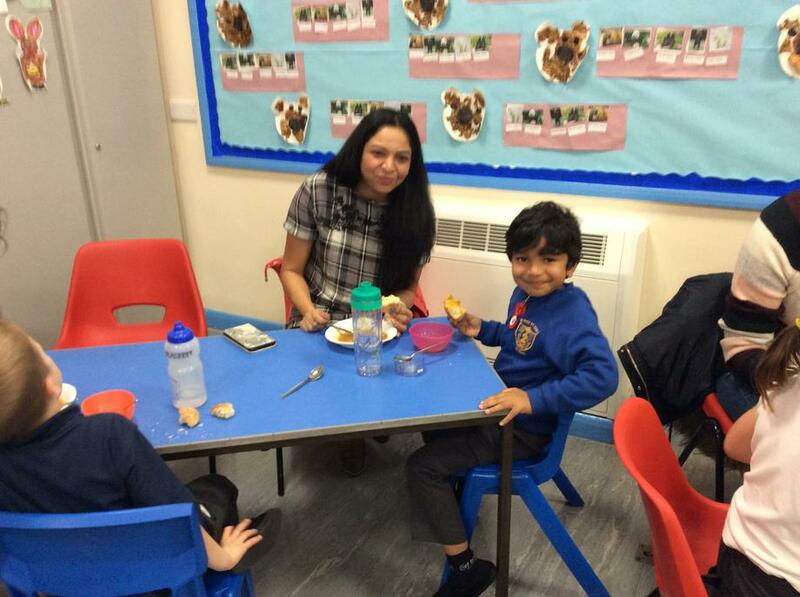 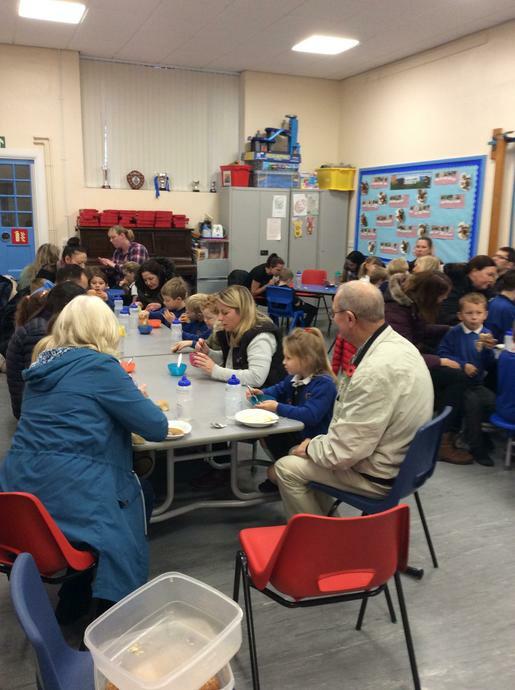 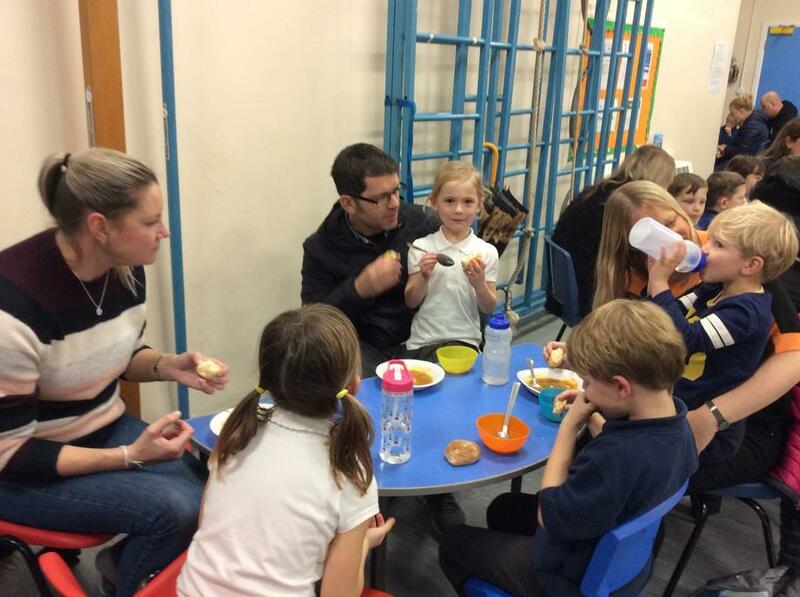 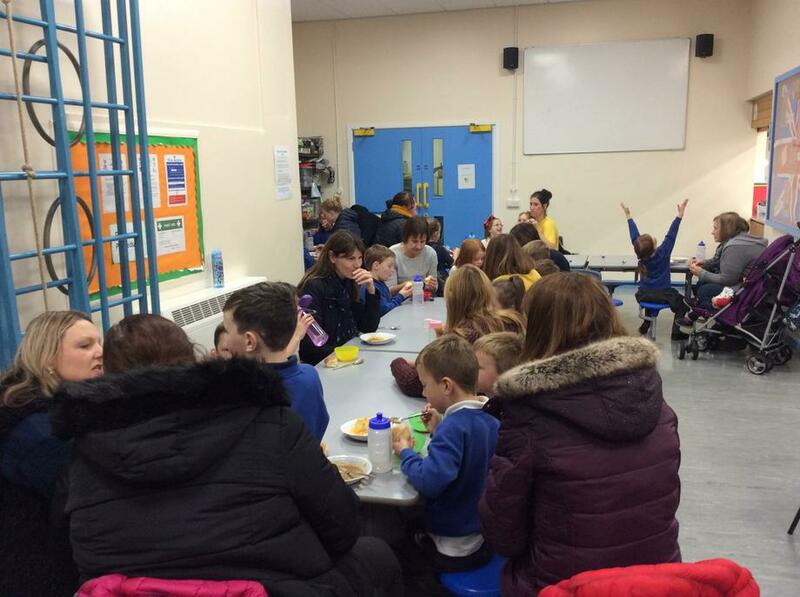 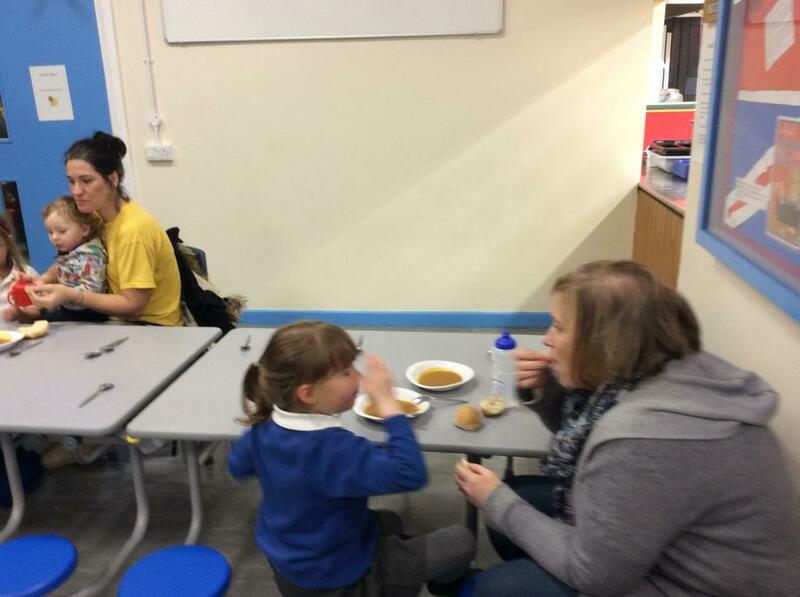 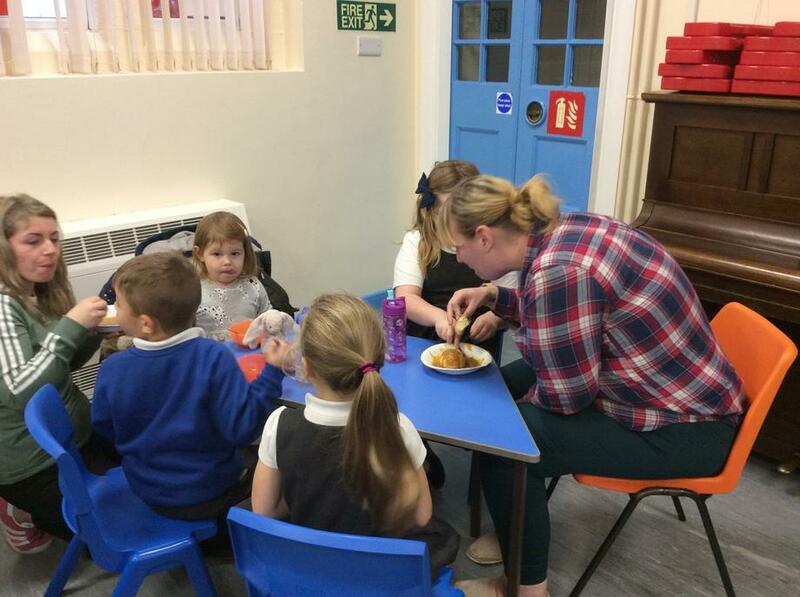 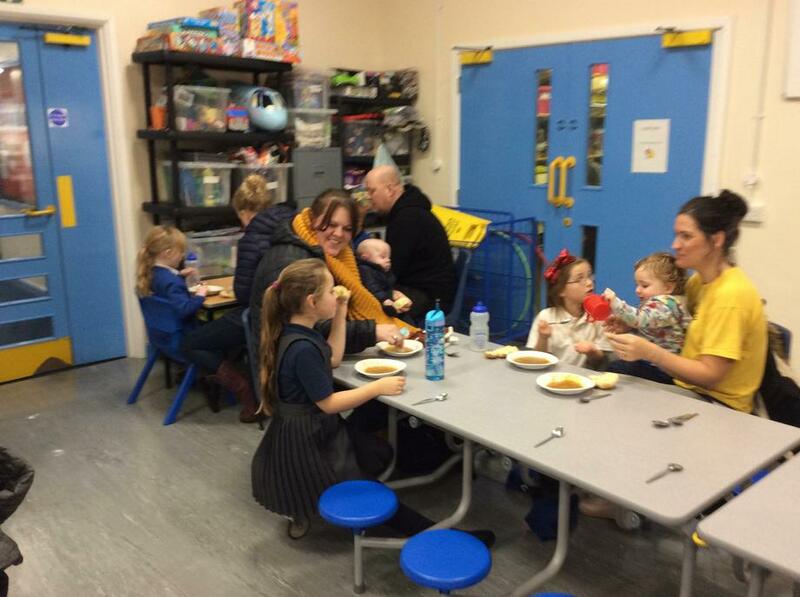 We invited our families into school to try our vegetable soup and bread.It was lovely to see everyone eating and chatting together. 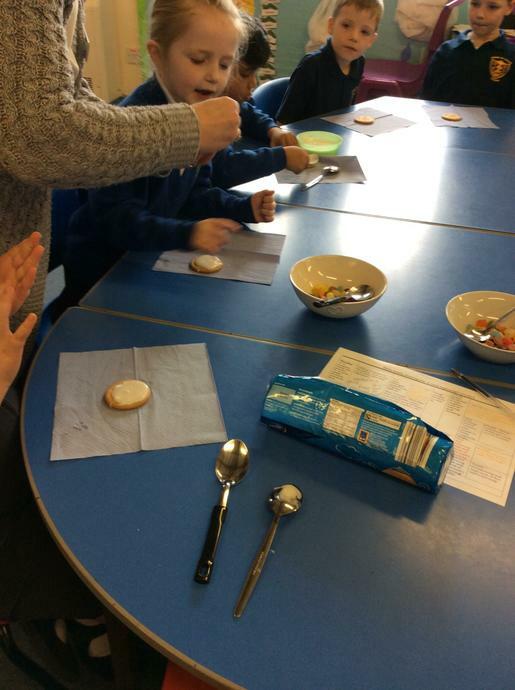 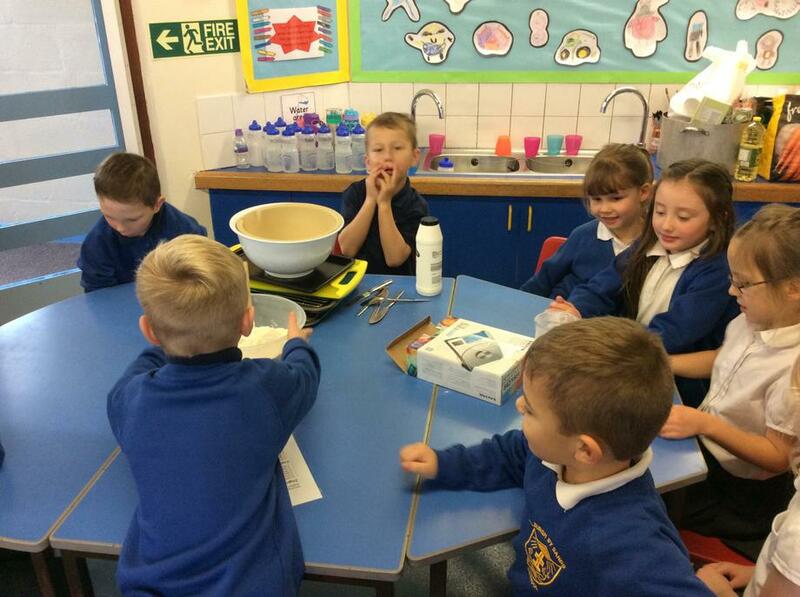 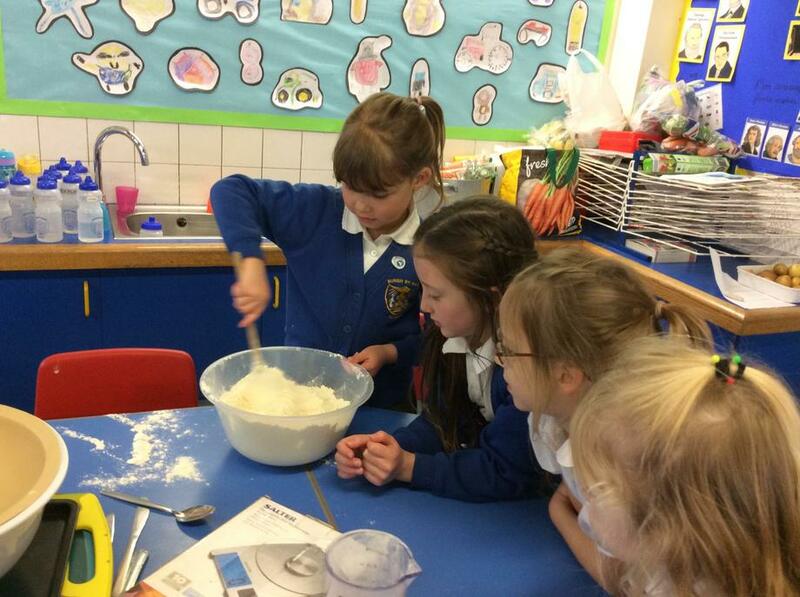 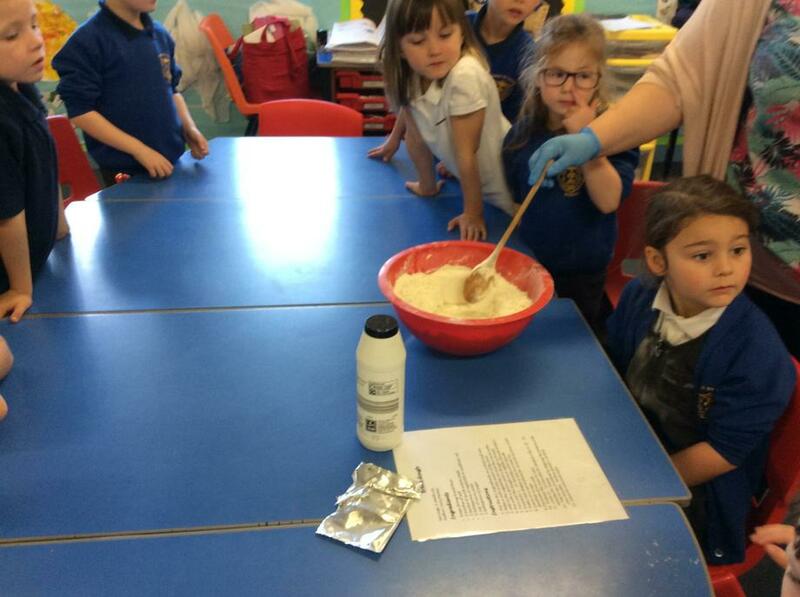 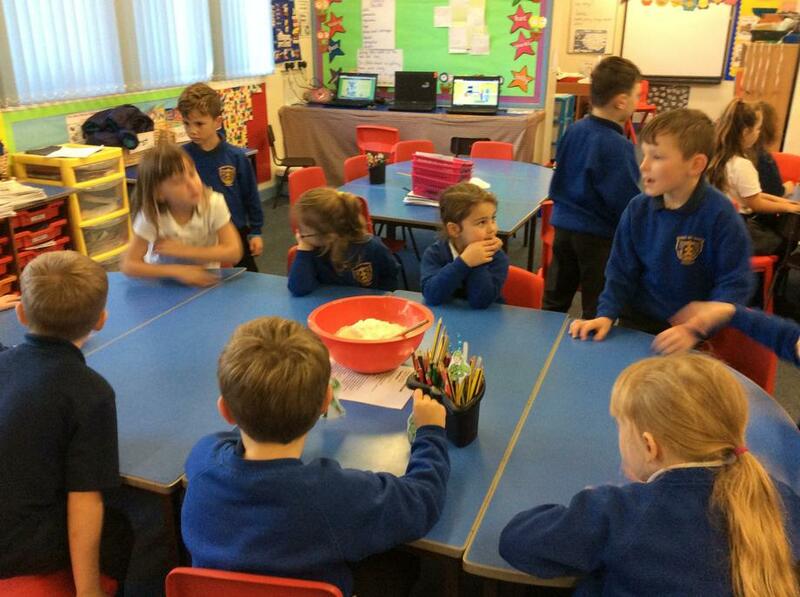 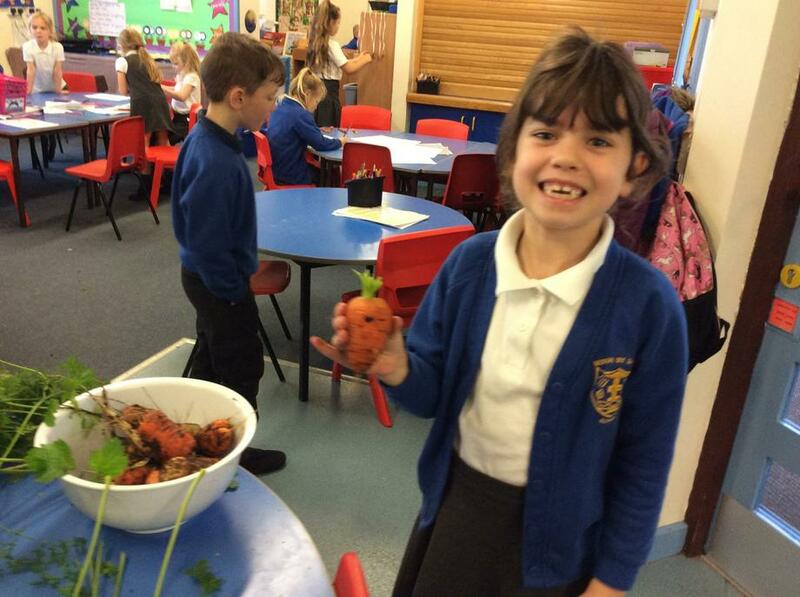 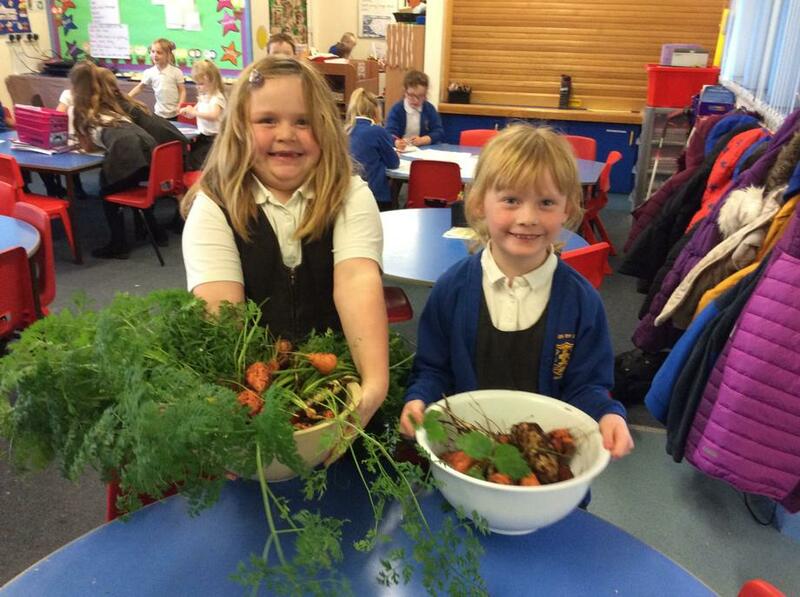 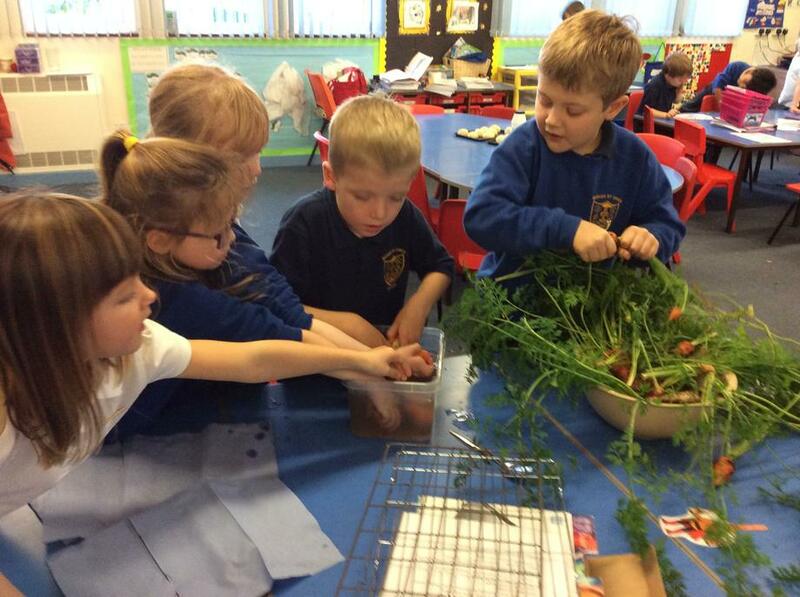 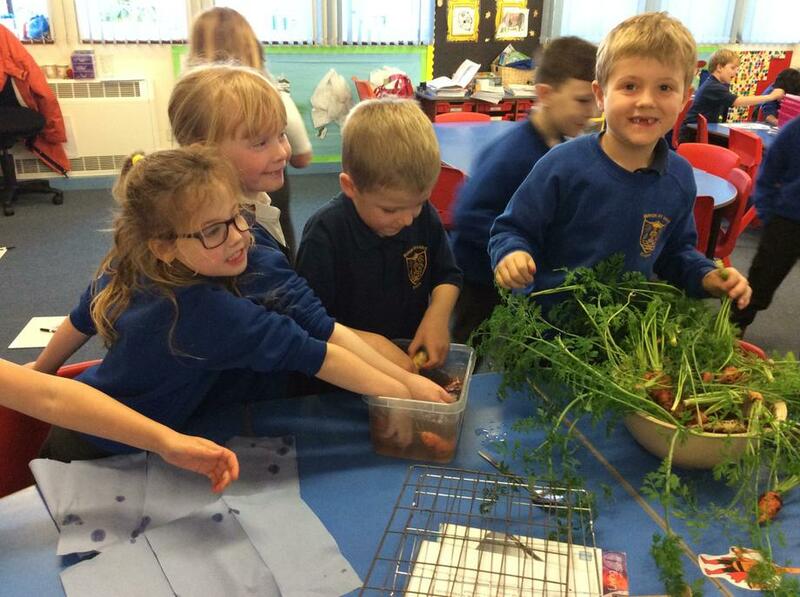 On Wednesday we had fun picking vegetables, making soup and making bread rolls ready for our tasting afternoon. 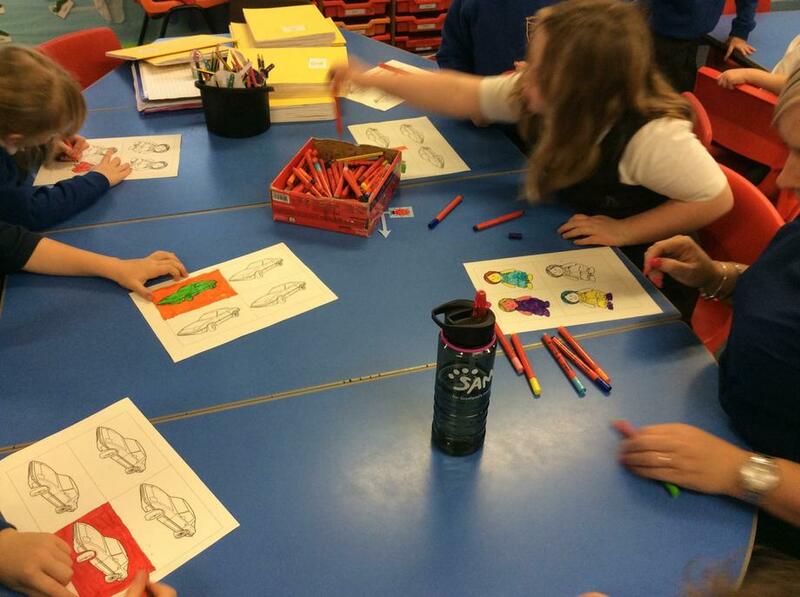 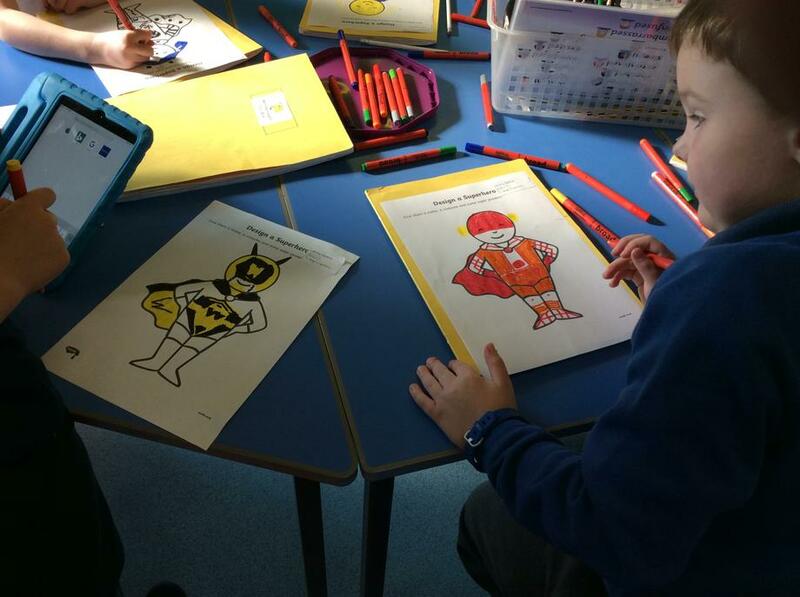 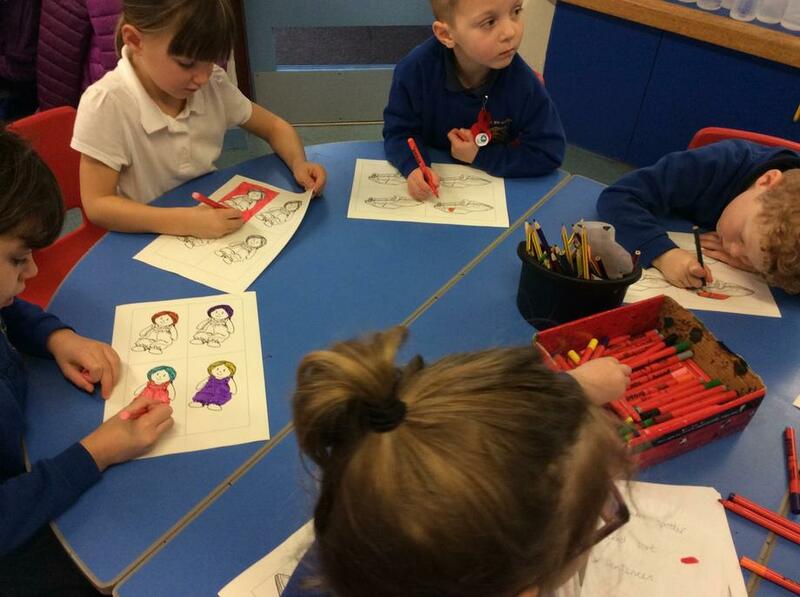 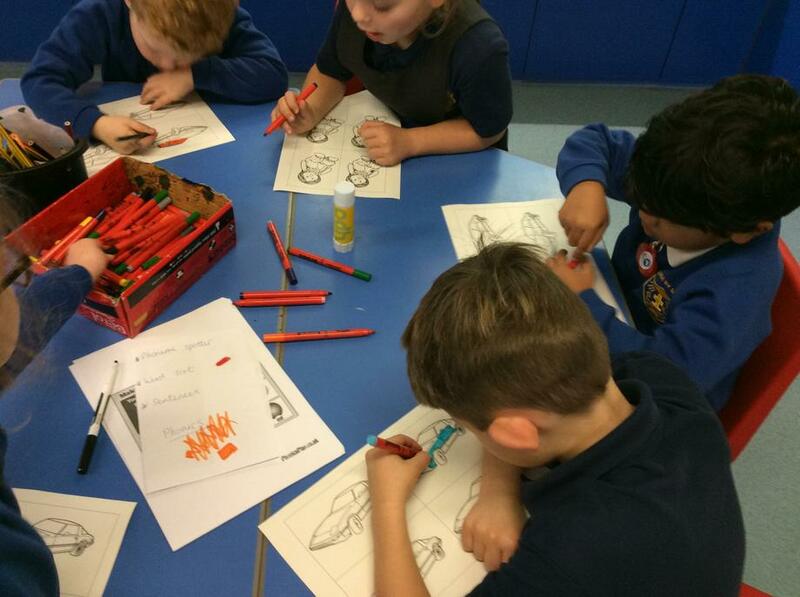 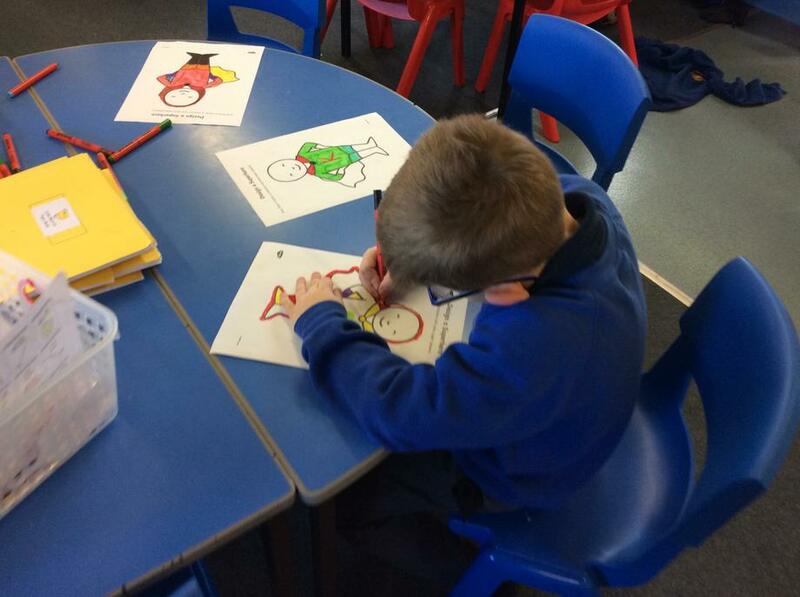 Today we have been drawing in the style of the artist Andy warhol. 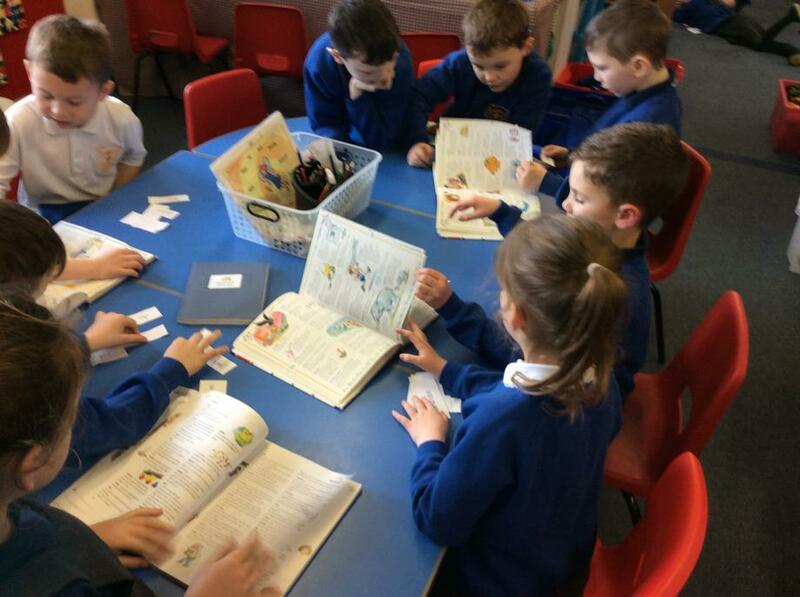 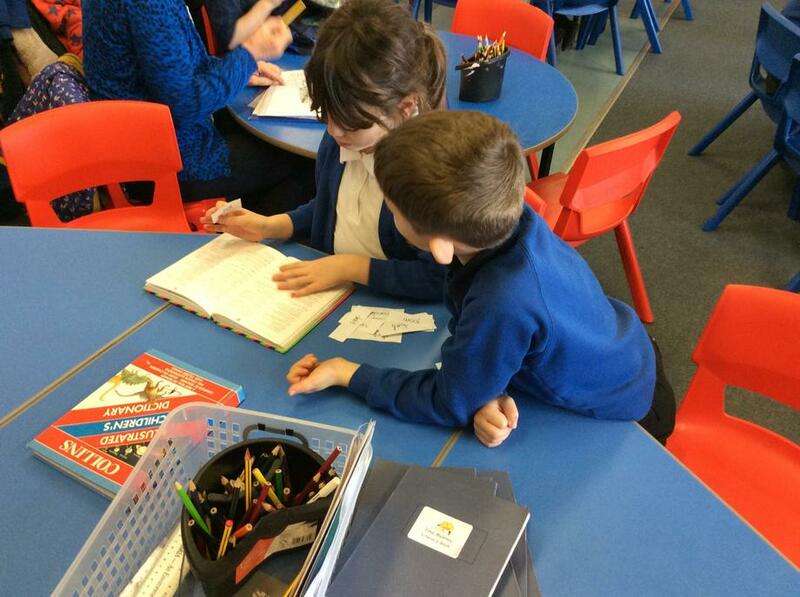 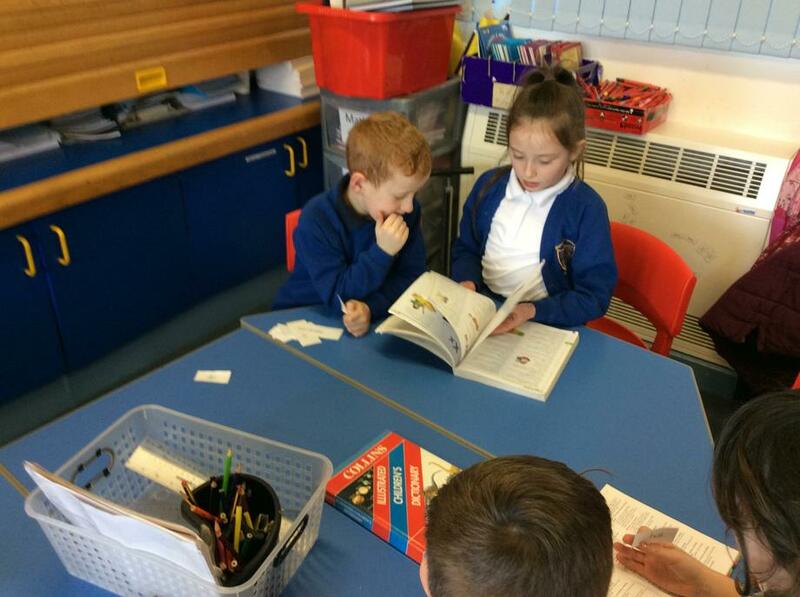 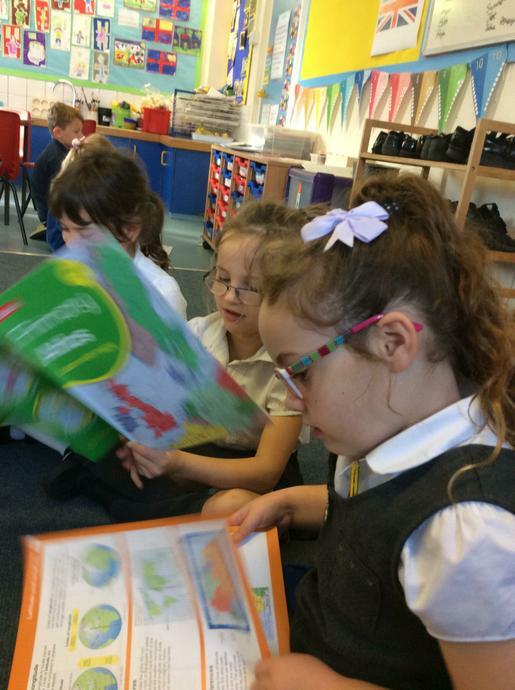 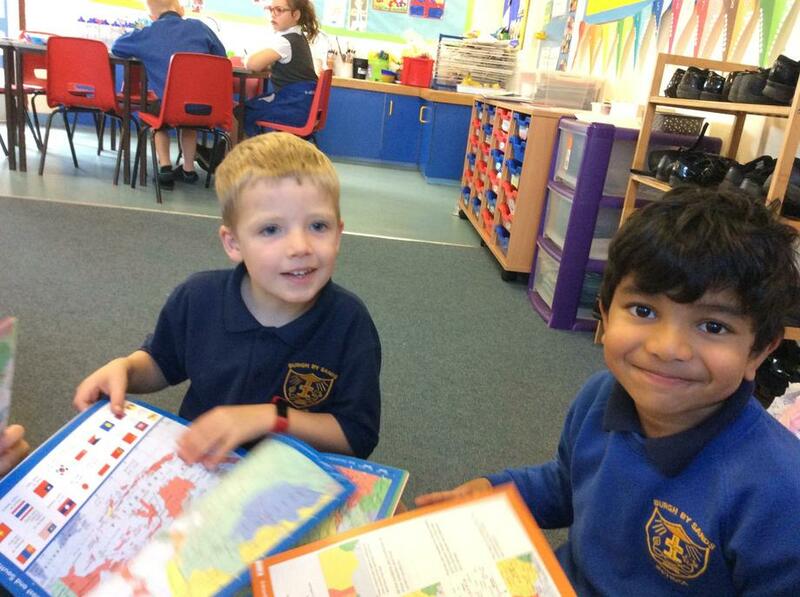 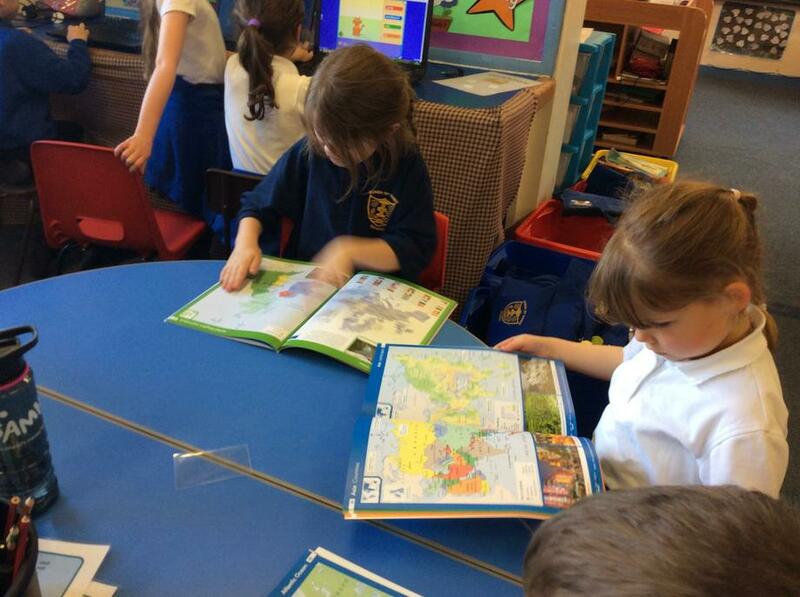 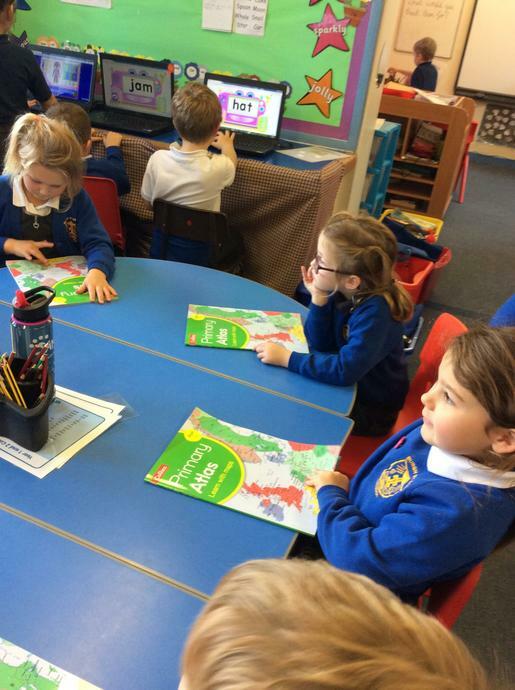 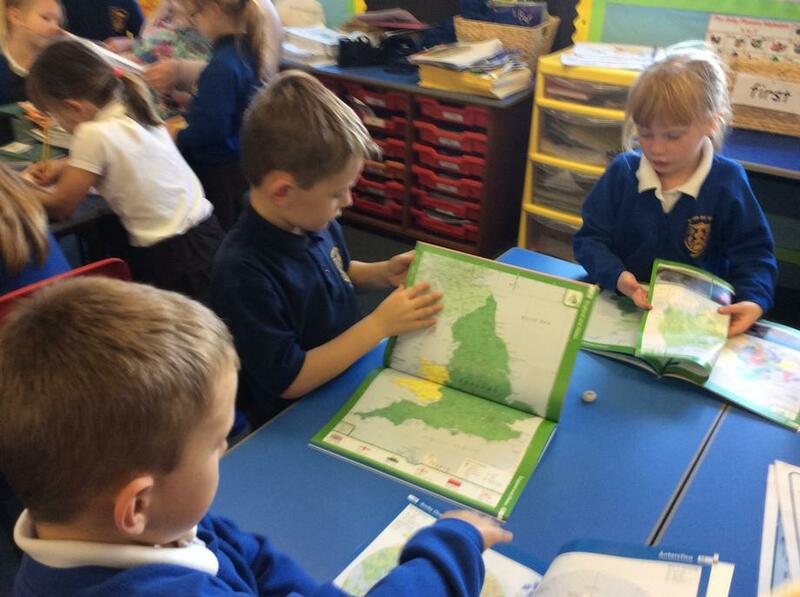 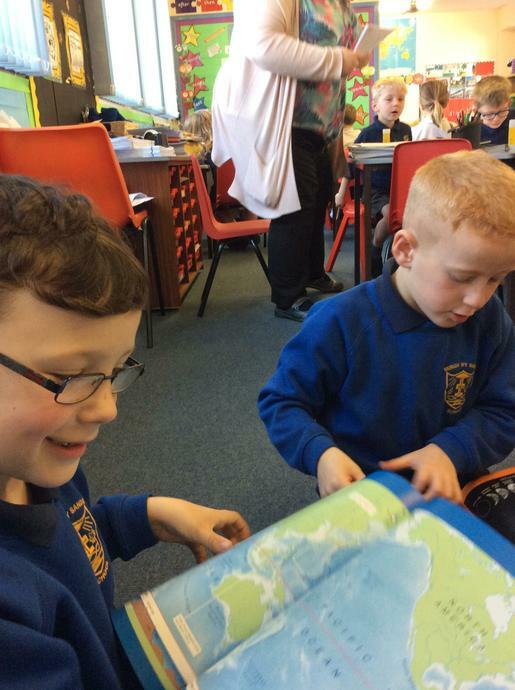 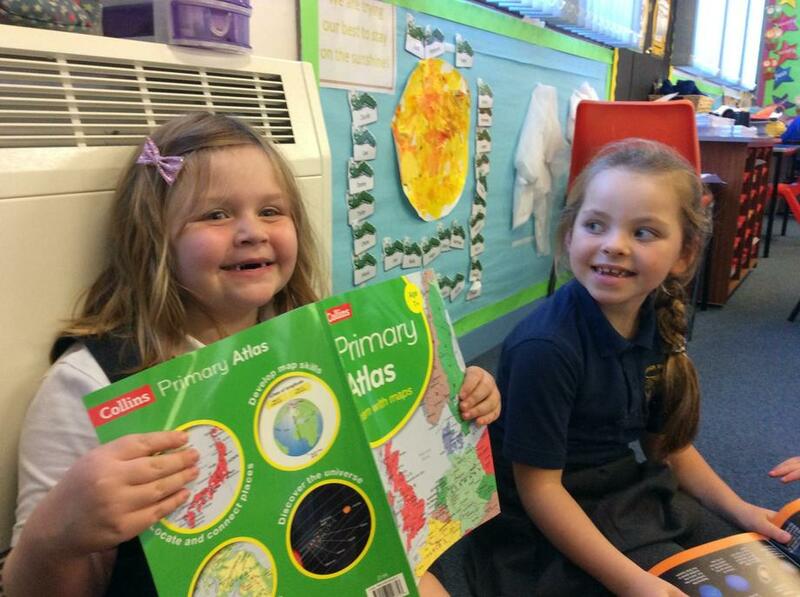 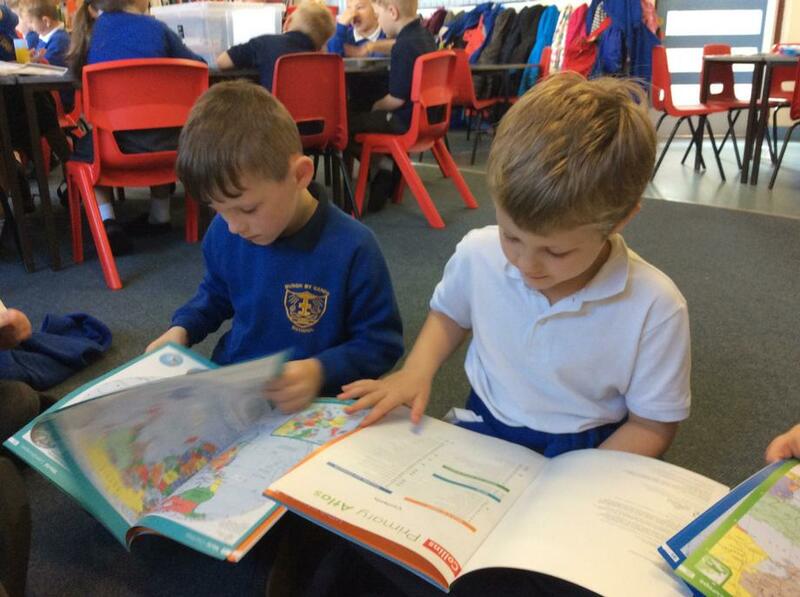 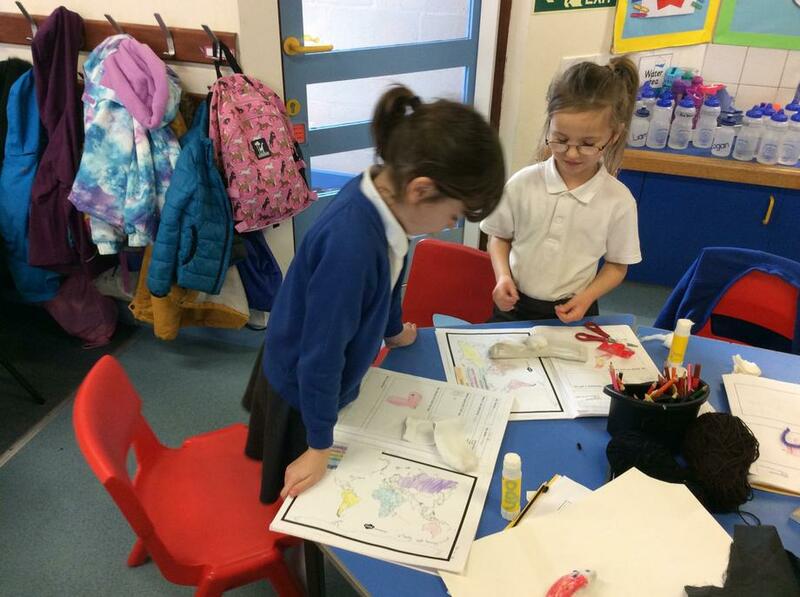 In our topic work we have been using our brand new atlases. 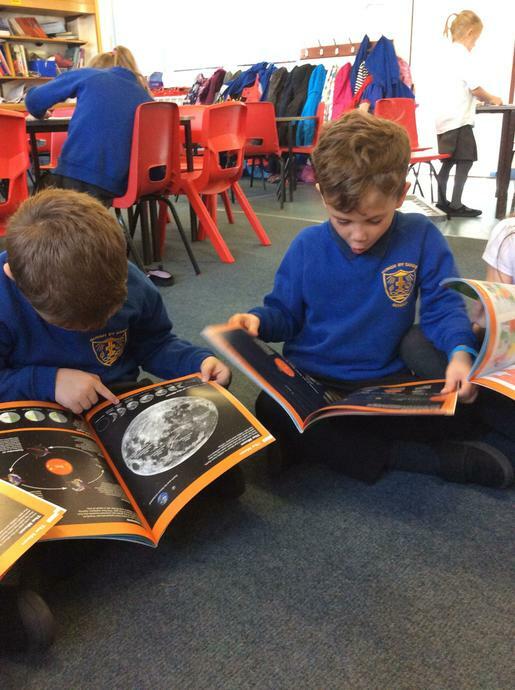 We were able to purchase these thanks to our Friends of Burgh book fair.Thanks Friends of Burgh! 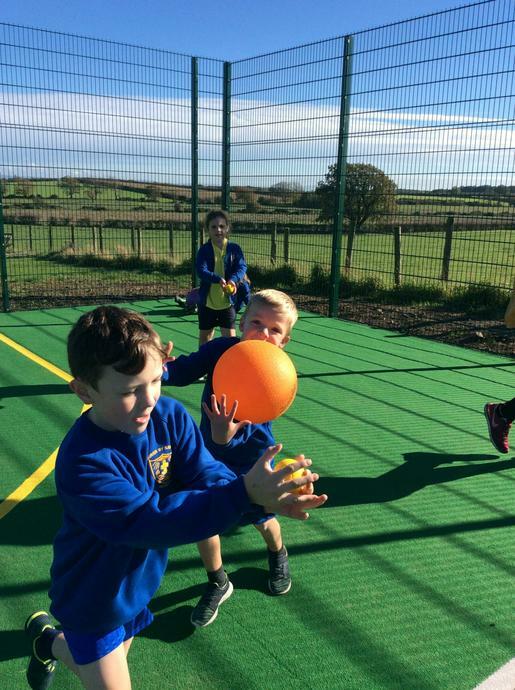 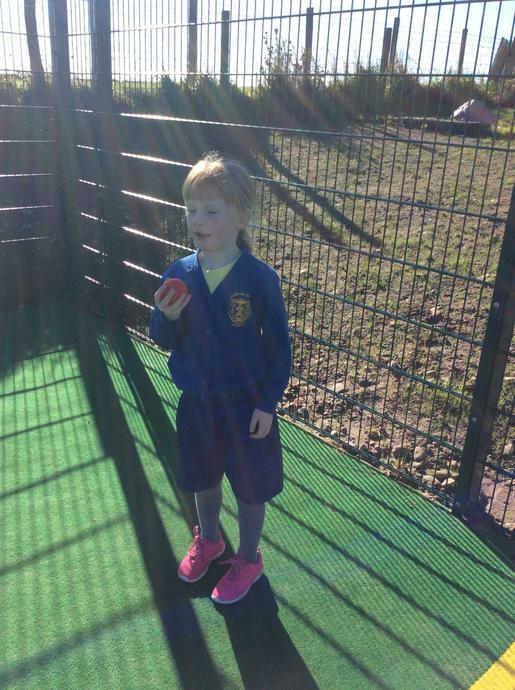 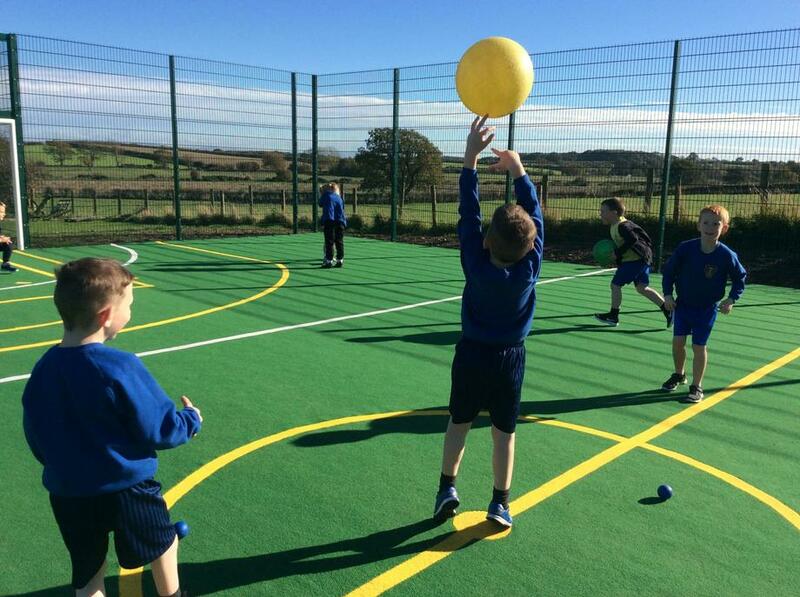 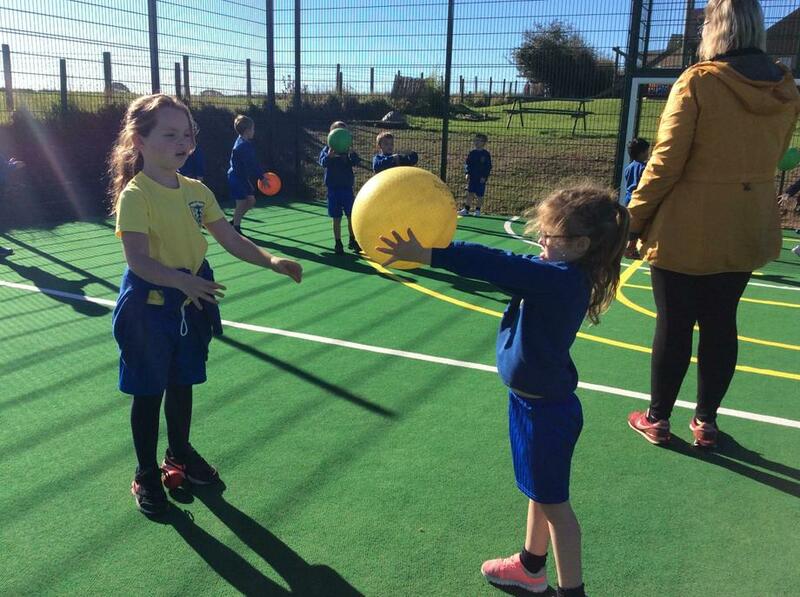 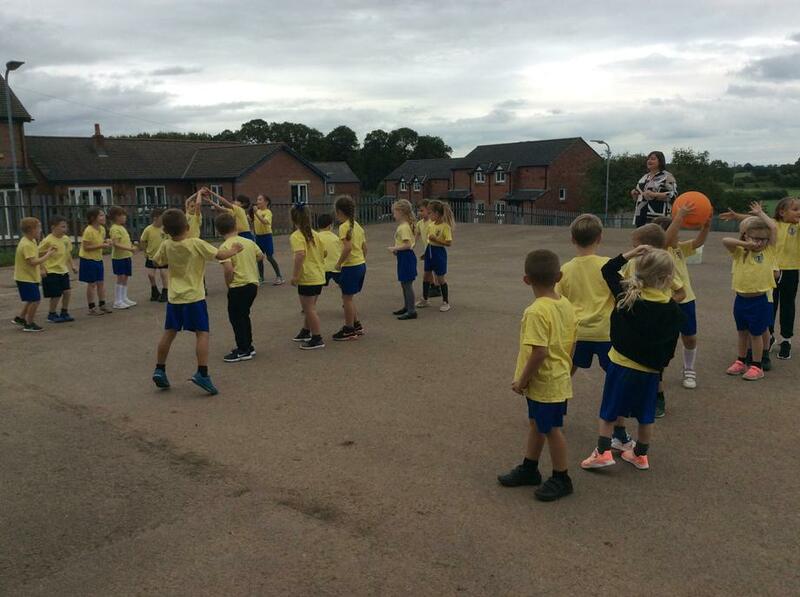 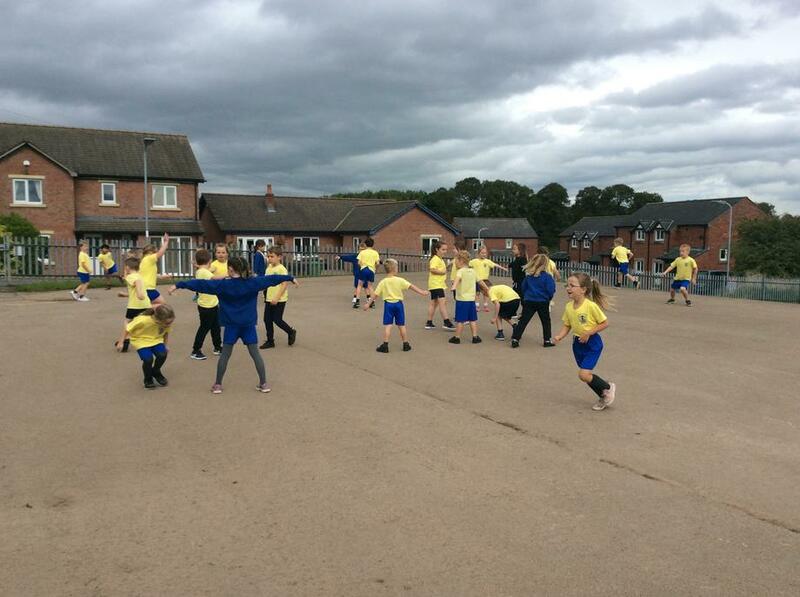 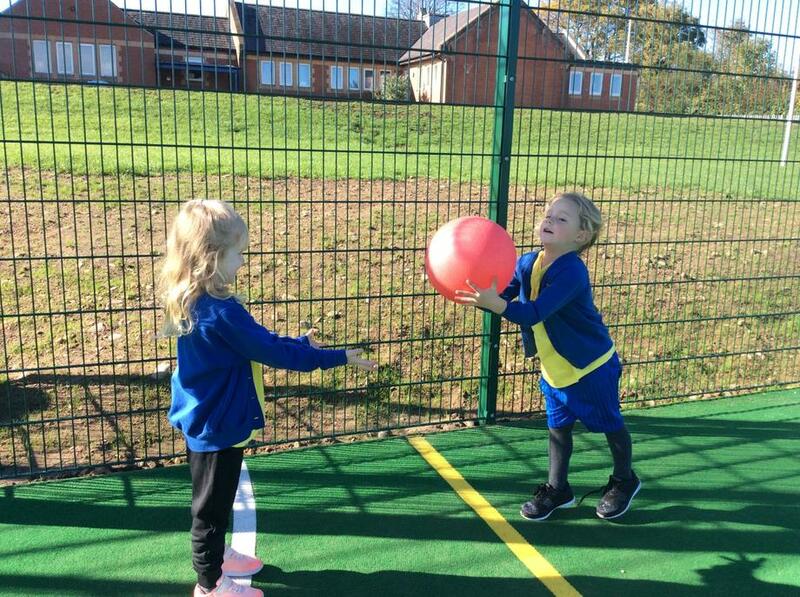 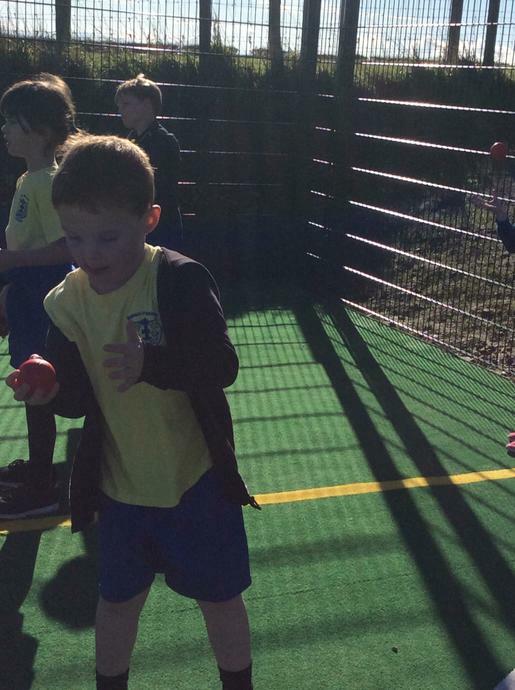 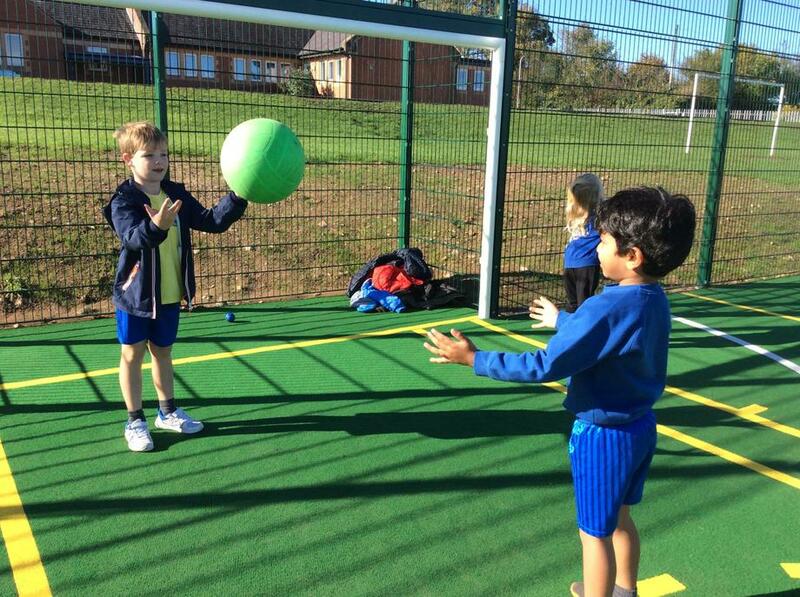 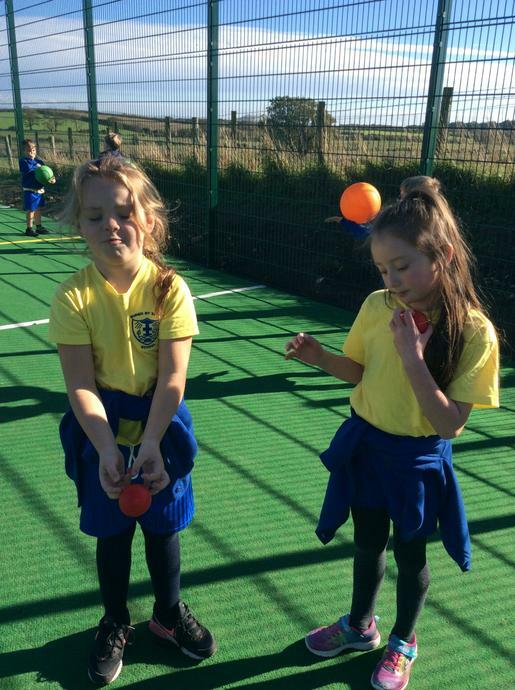 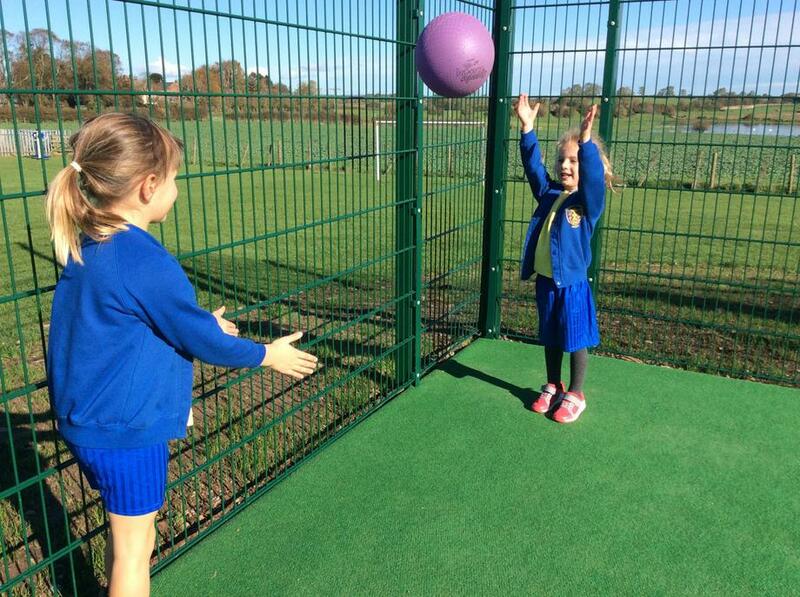 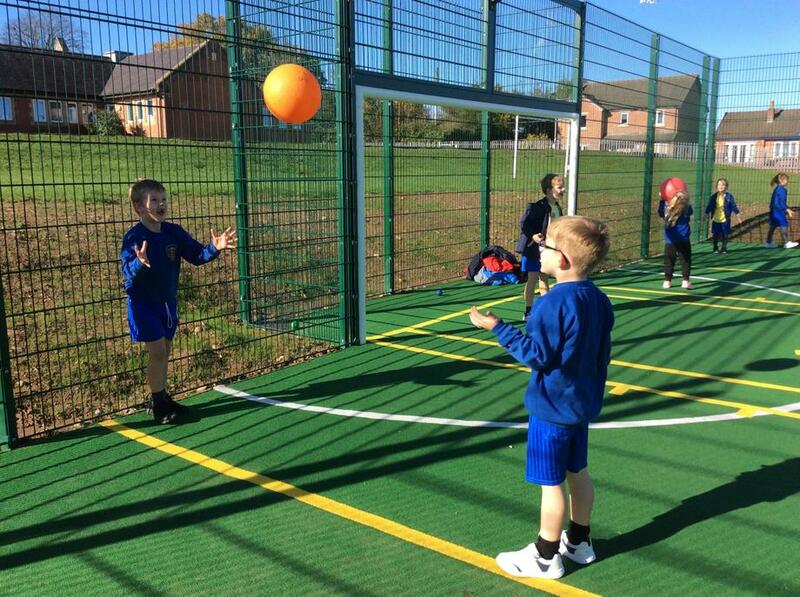 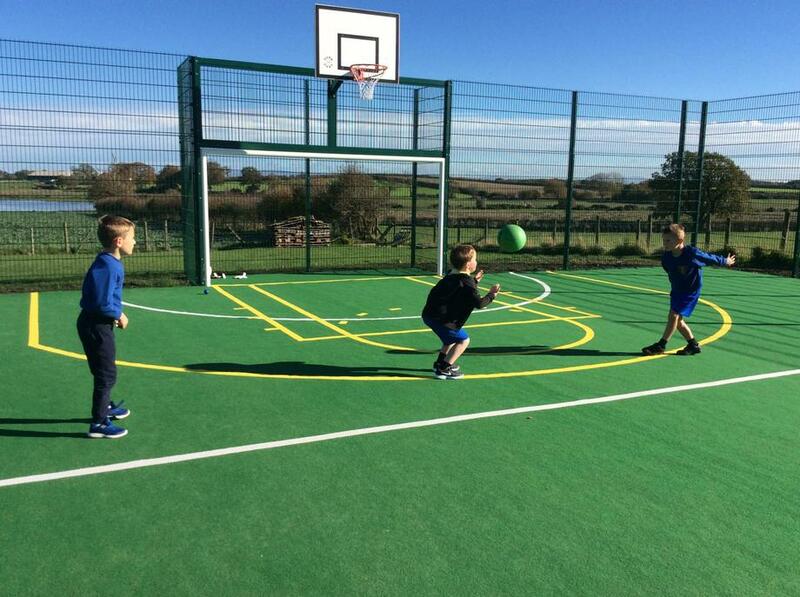 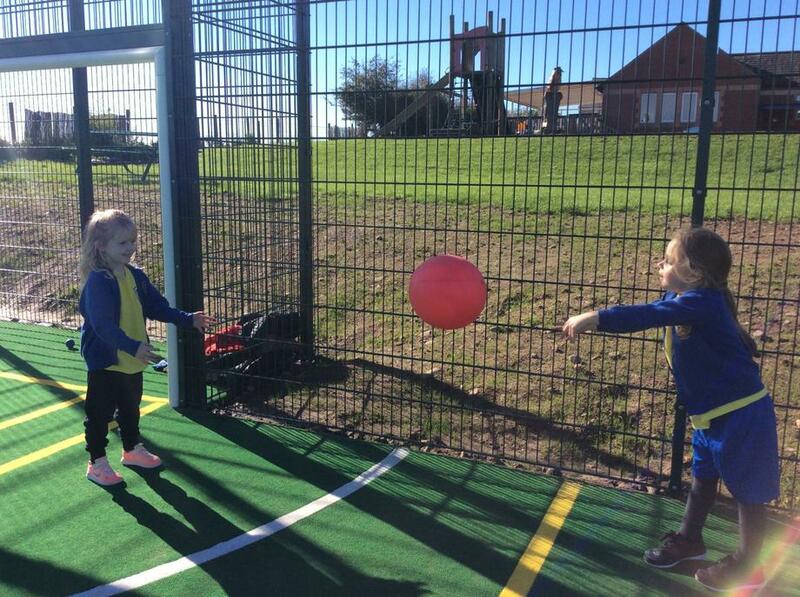 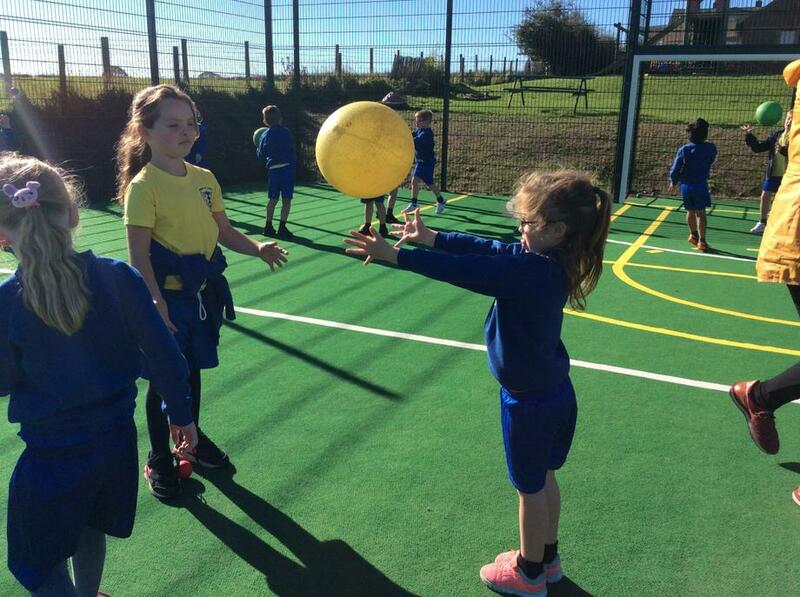 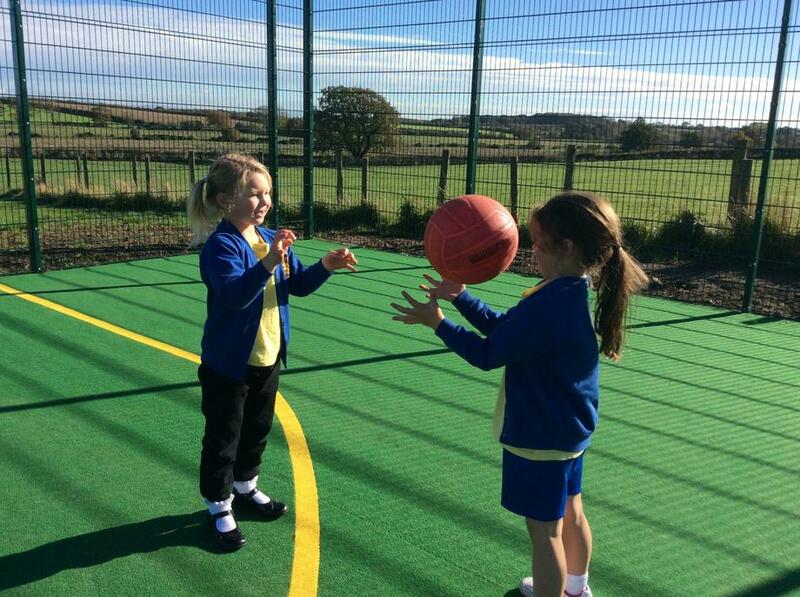 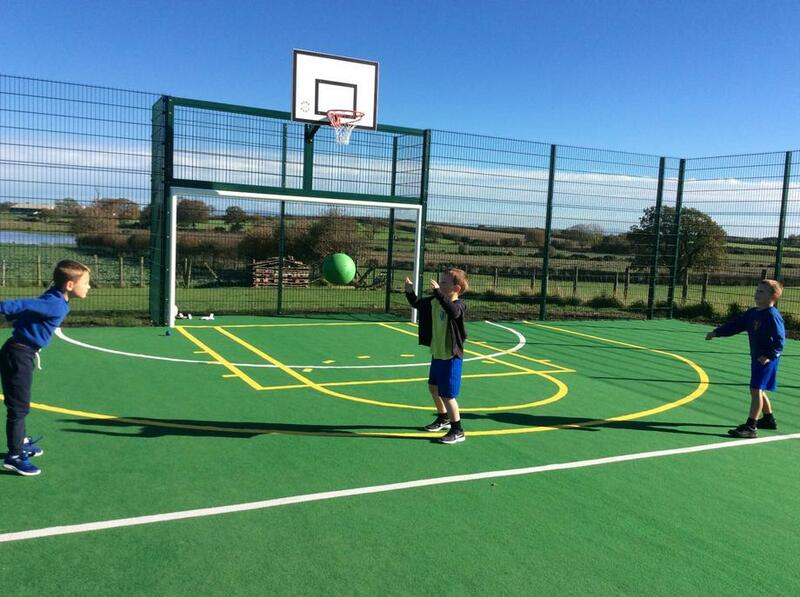 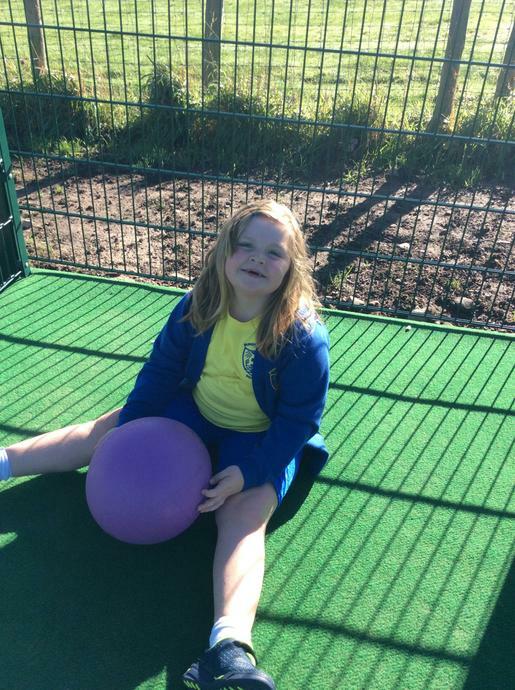 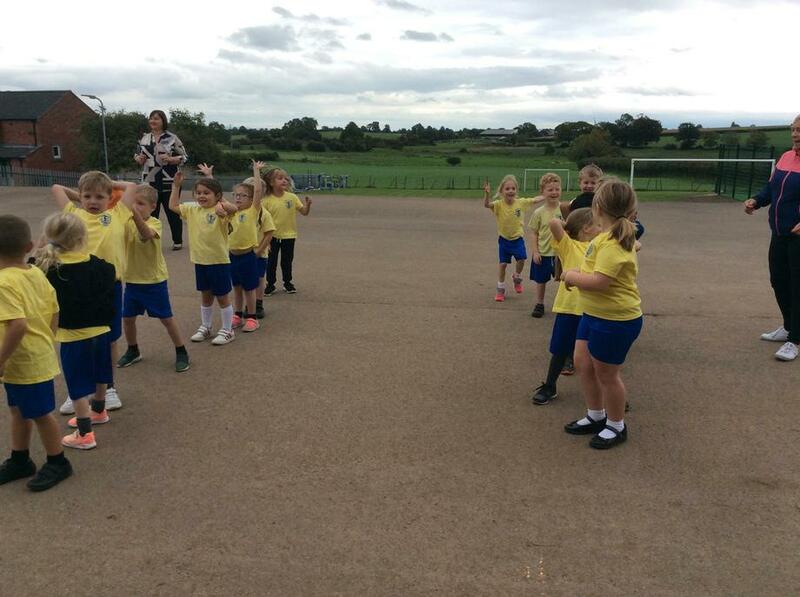 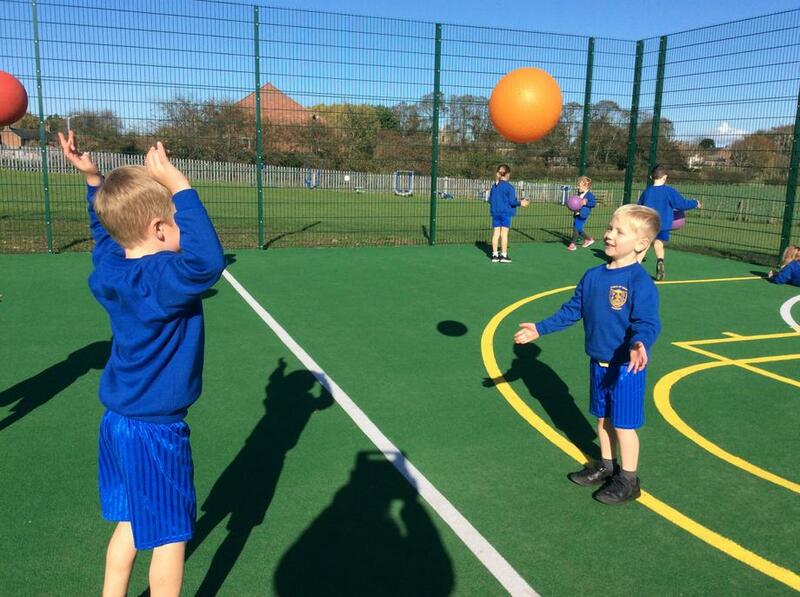 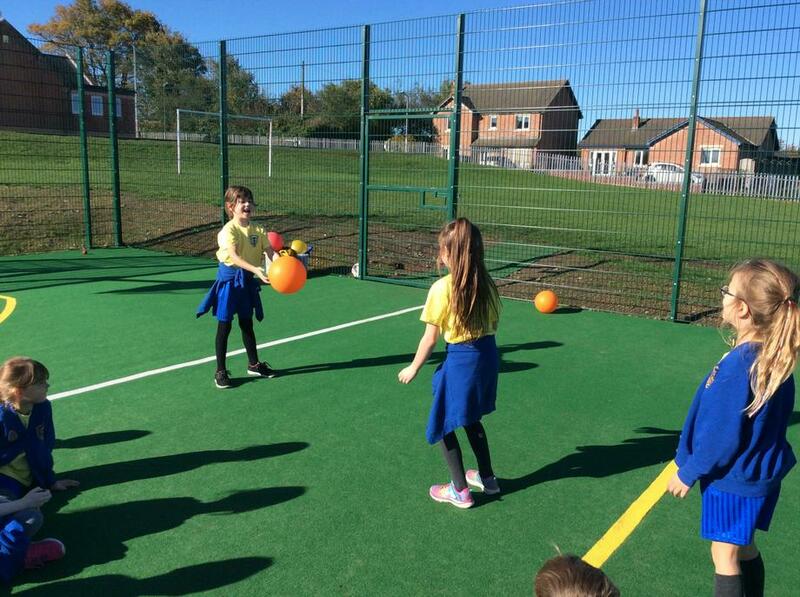 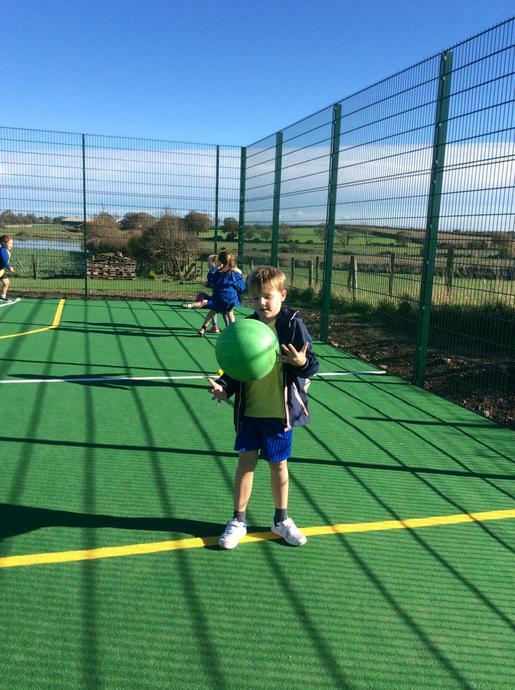 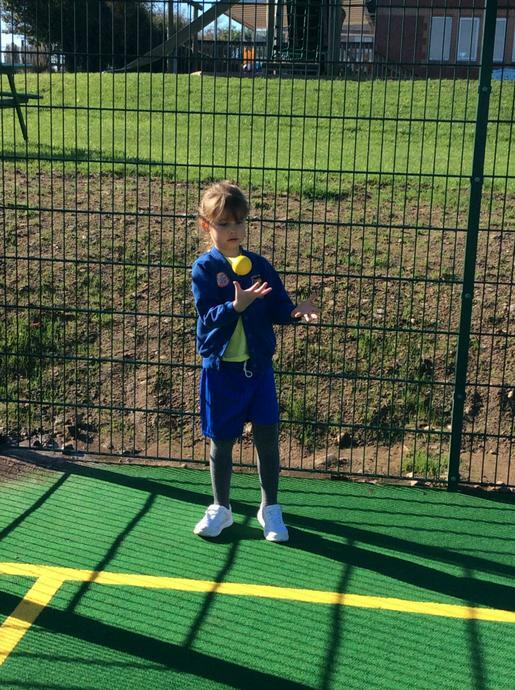 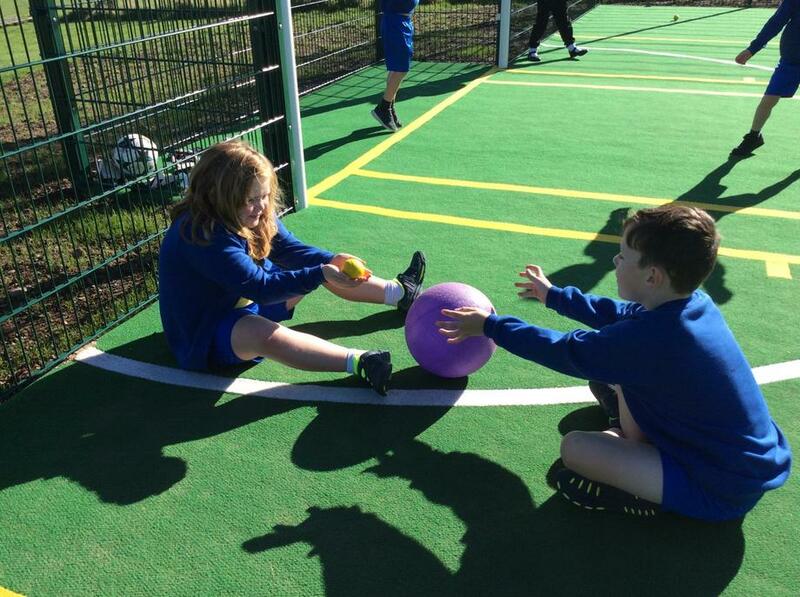 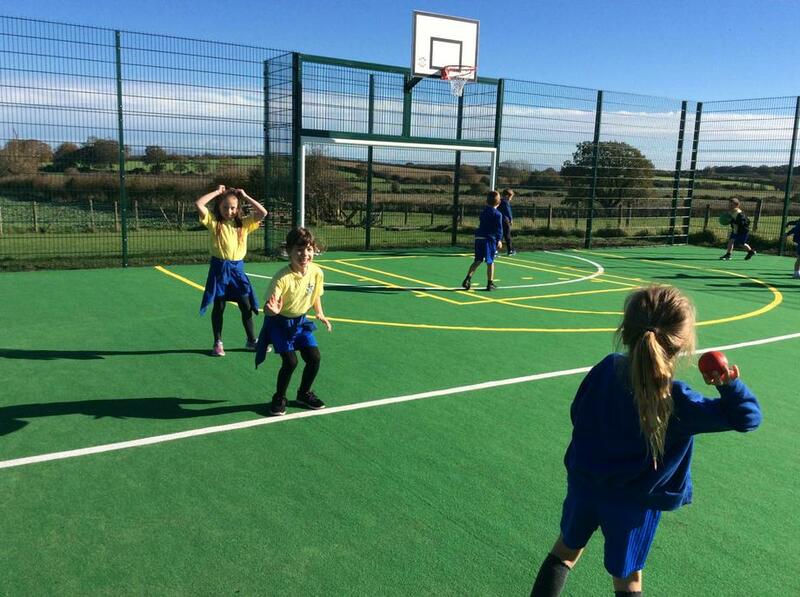 We enjoyed PE in the sunshine on the MUGA! 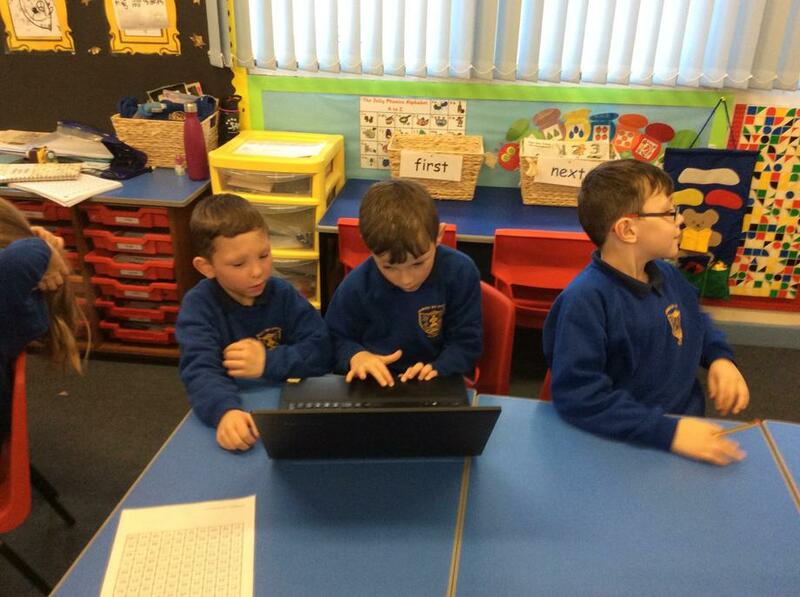 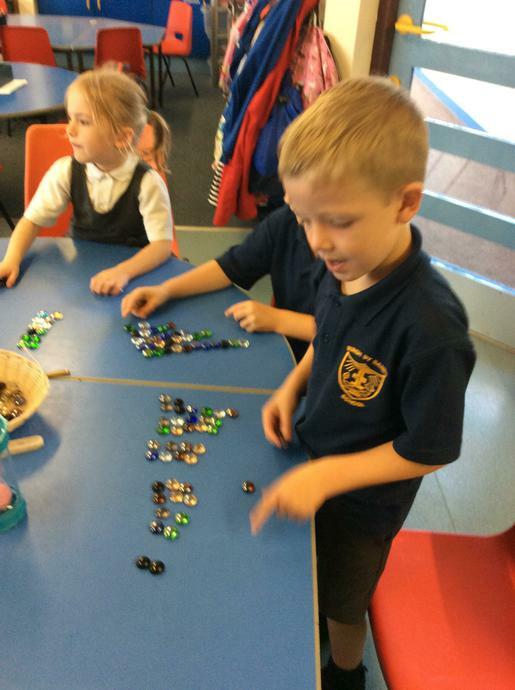 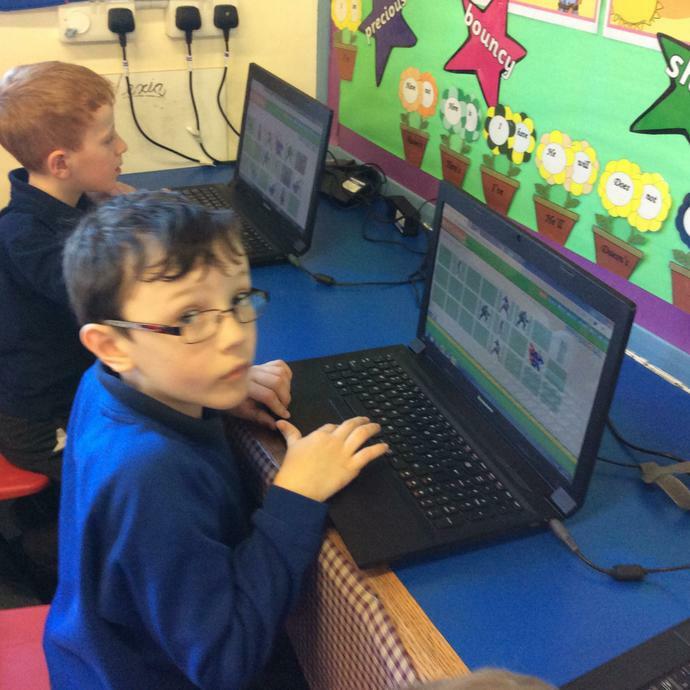 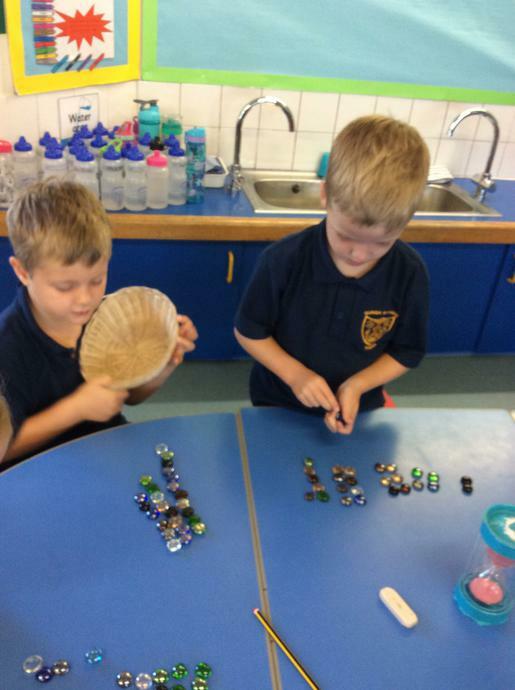 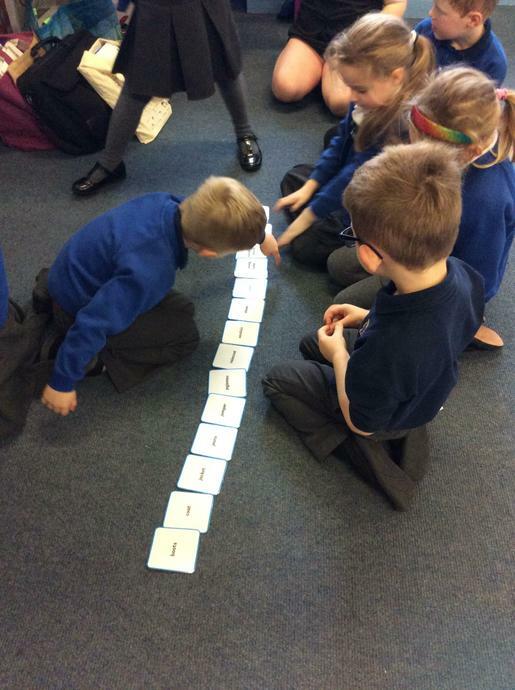 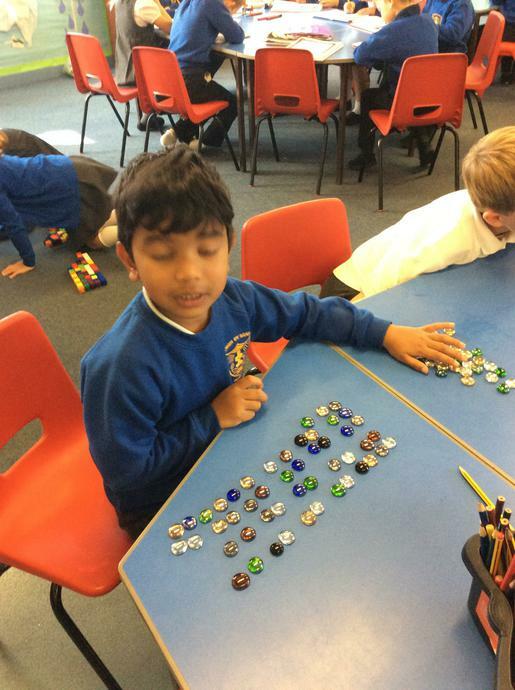 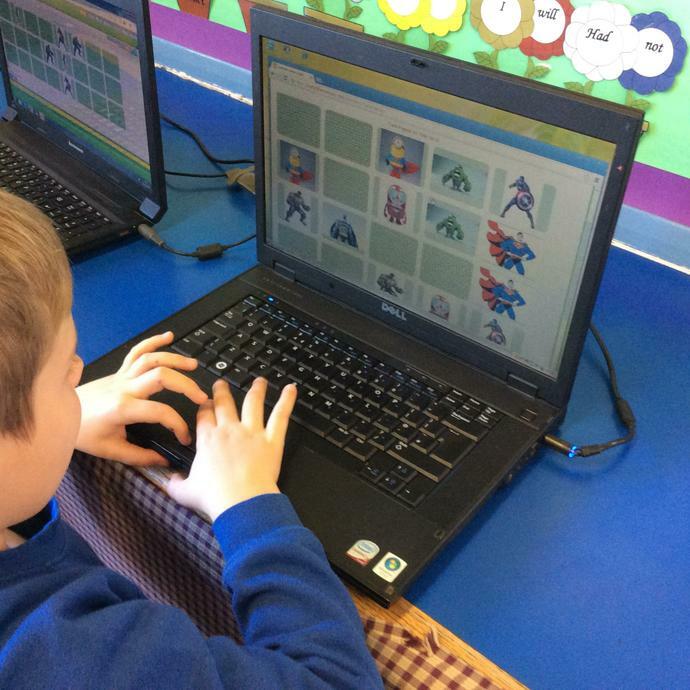 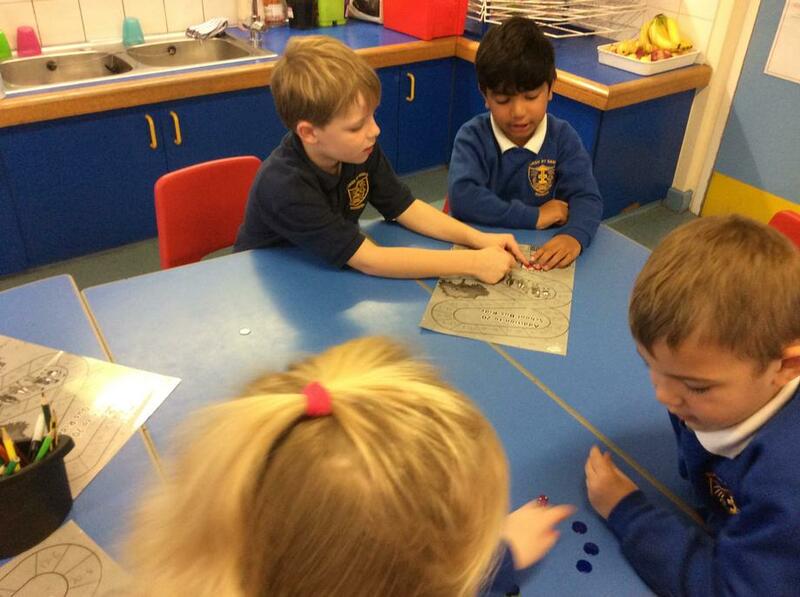 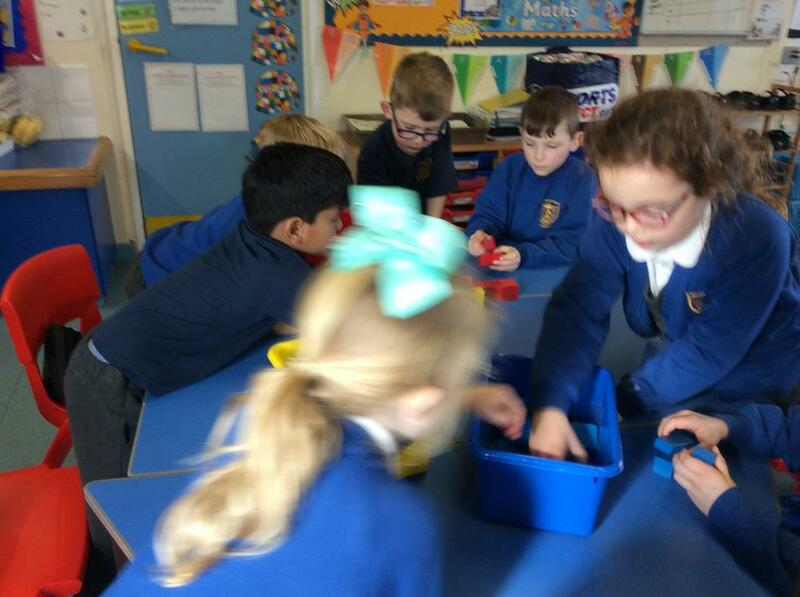 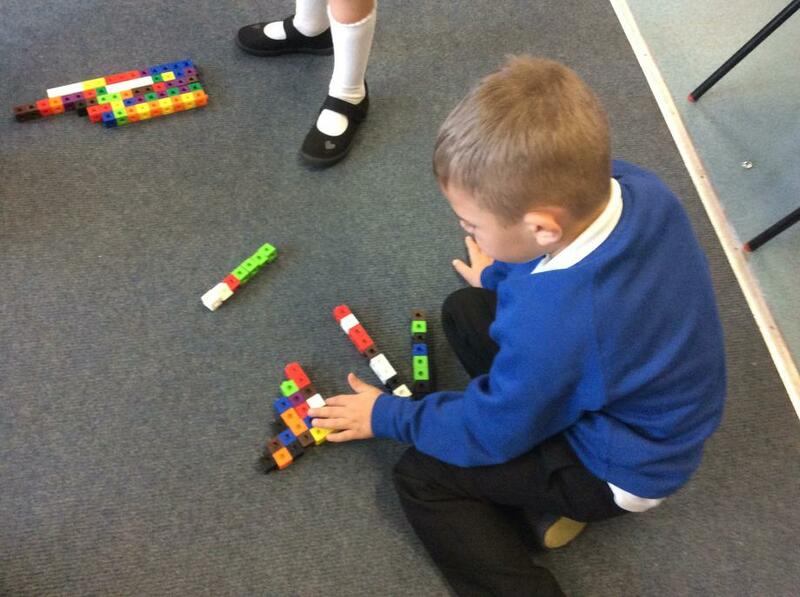 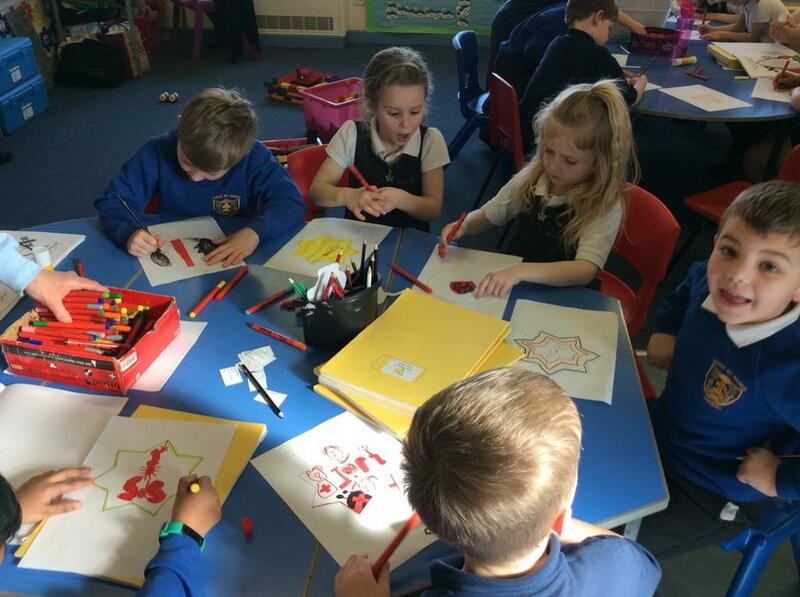 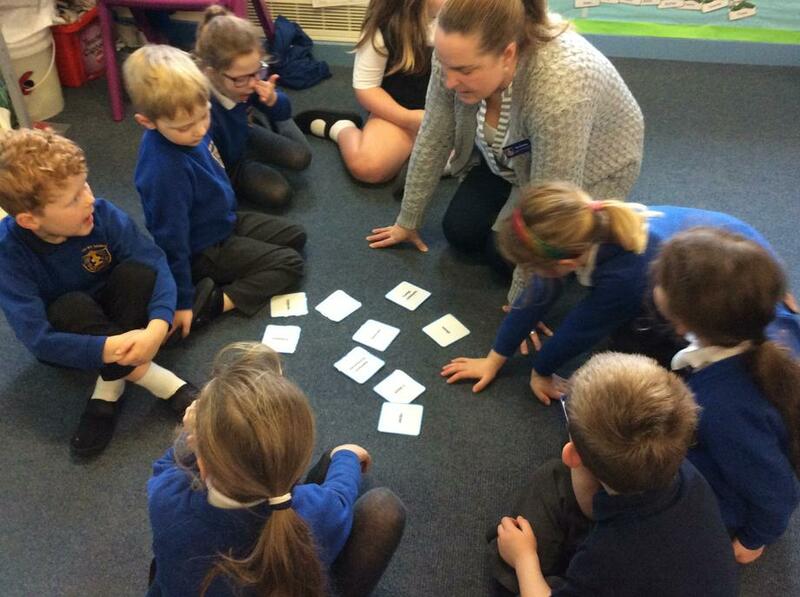 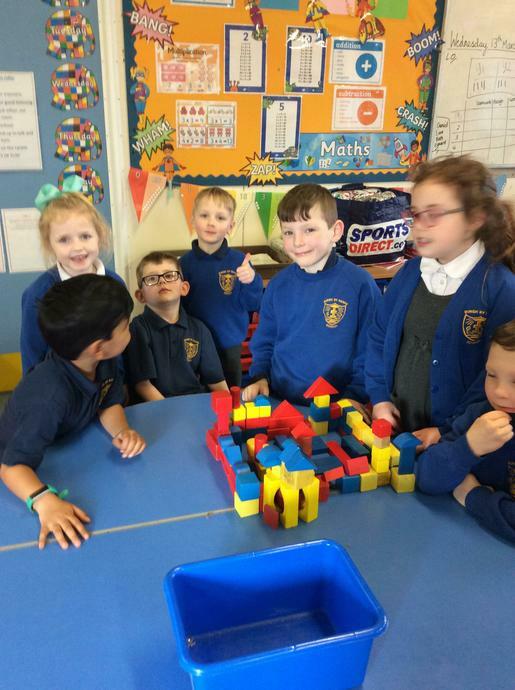 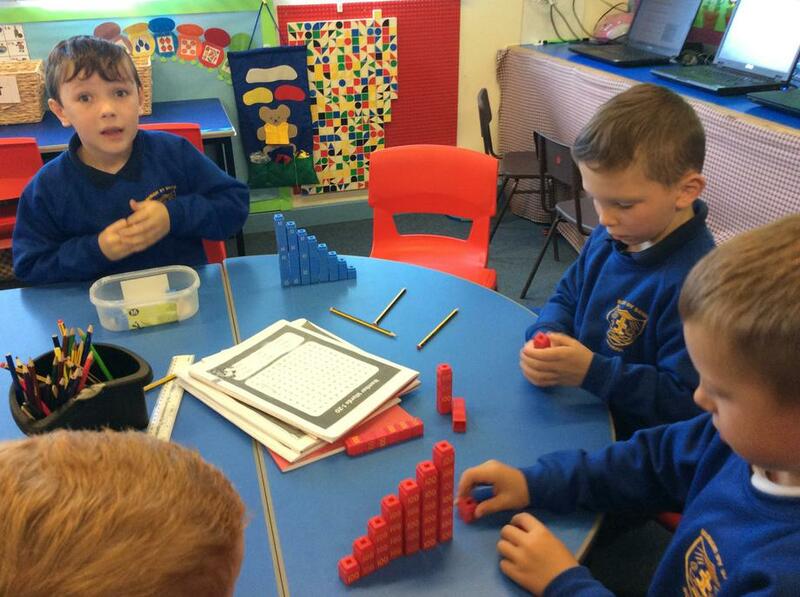 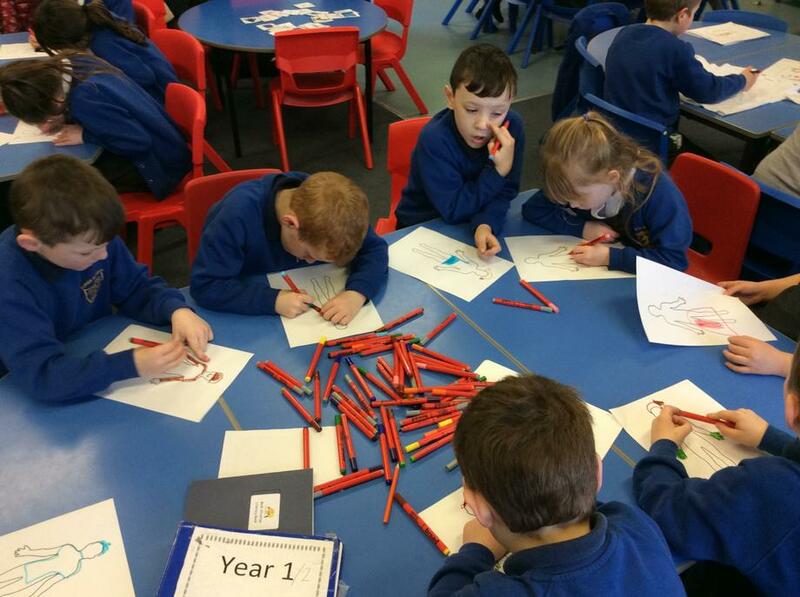 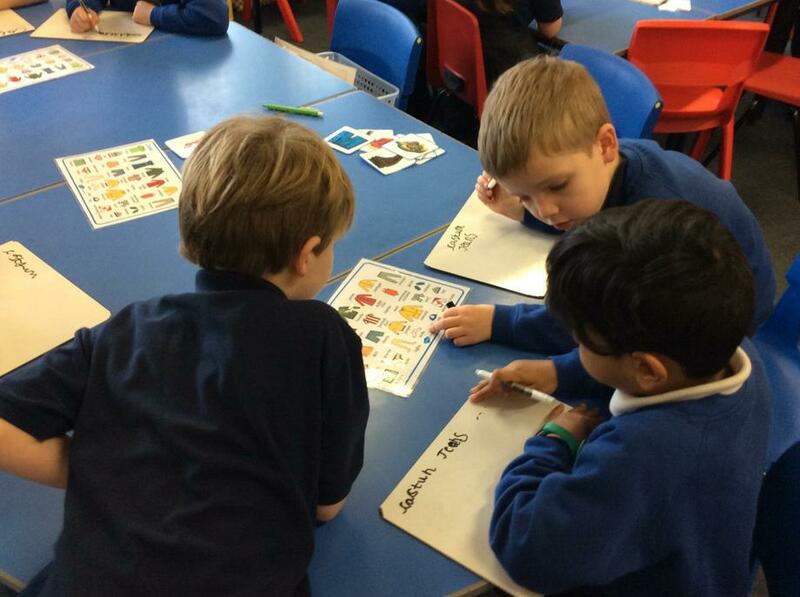 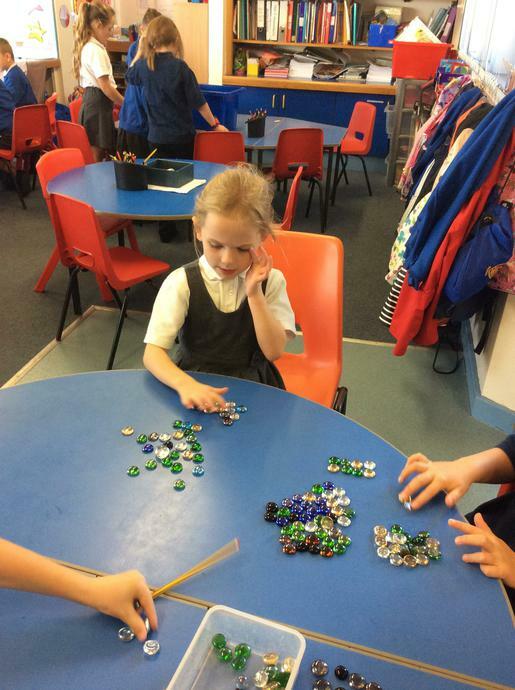 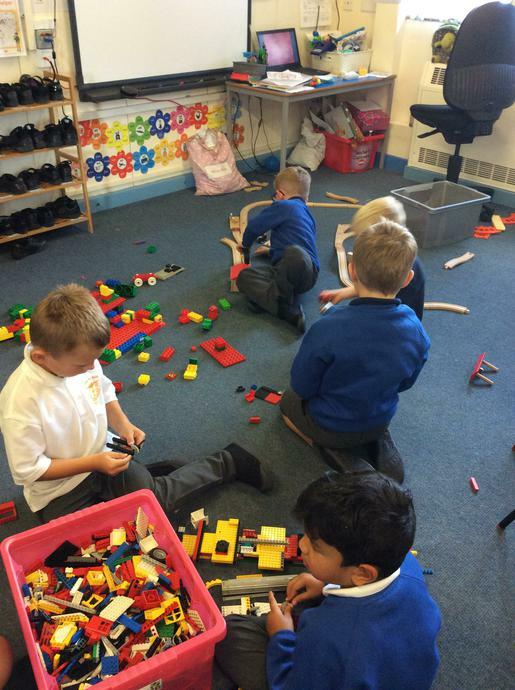 We have been very busy in maths today.We have been looking at adding numbers and how to partition numbers into tens and ones.We used practical activities,group games and computer programs to apply our skills. 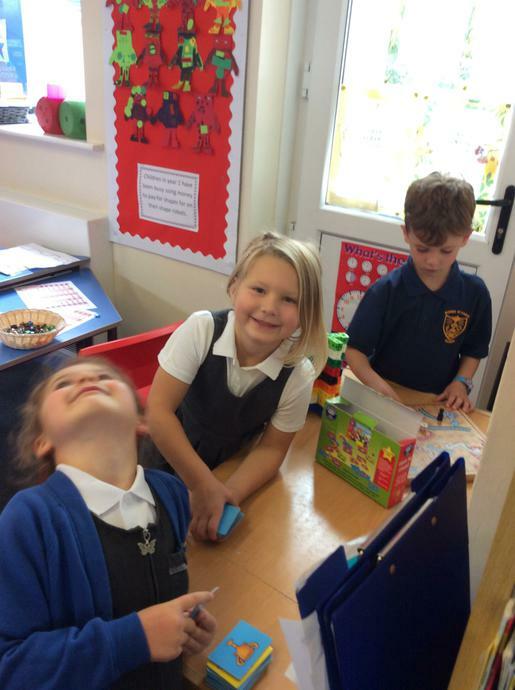 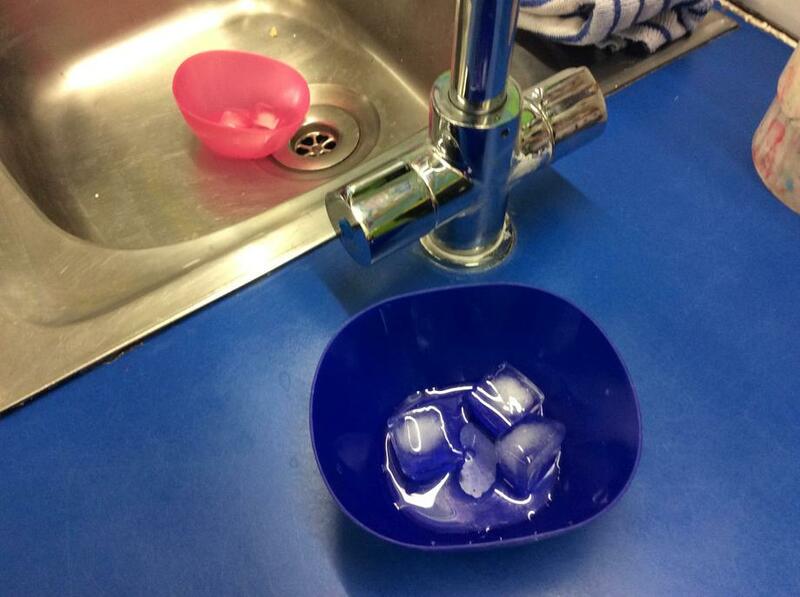 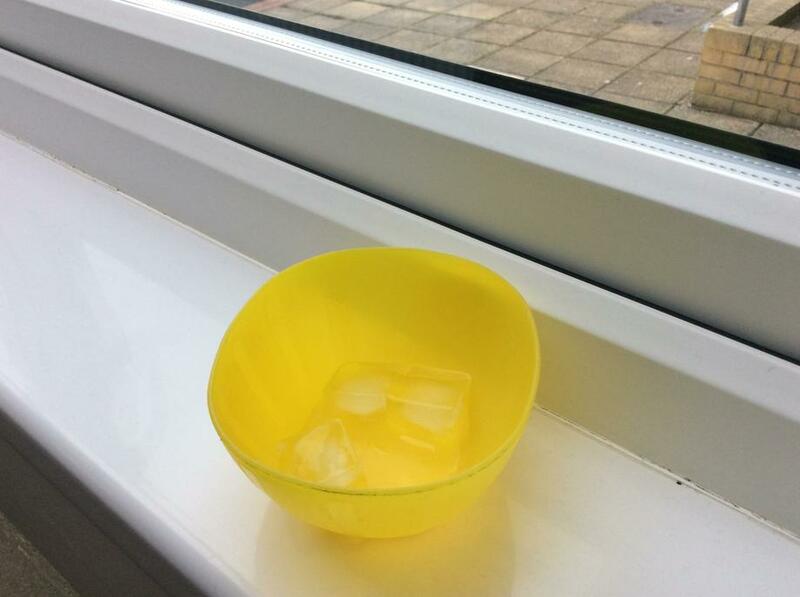 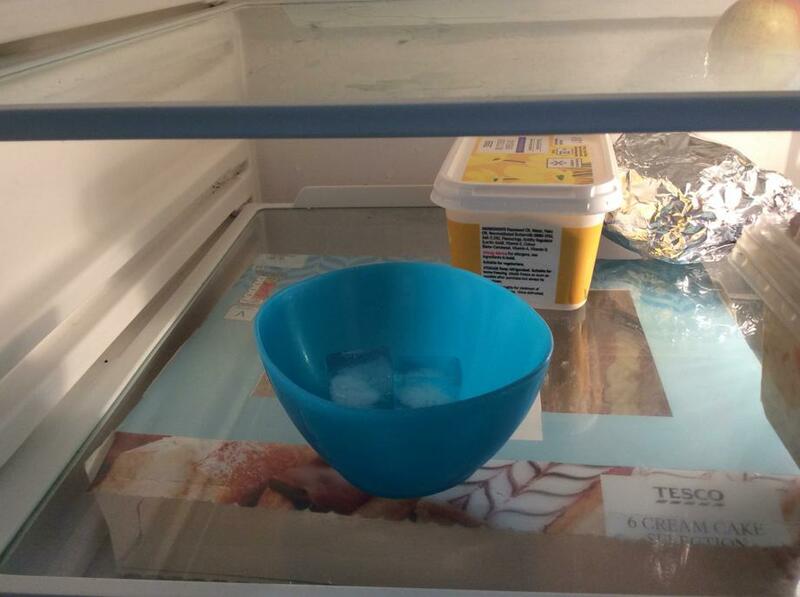 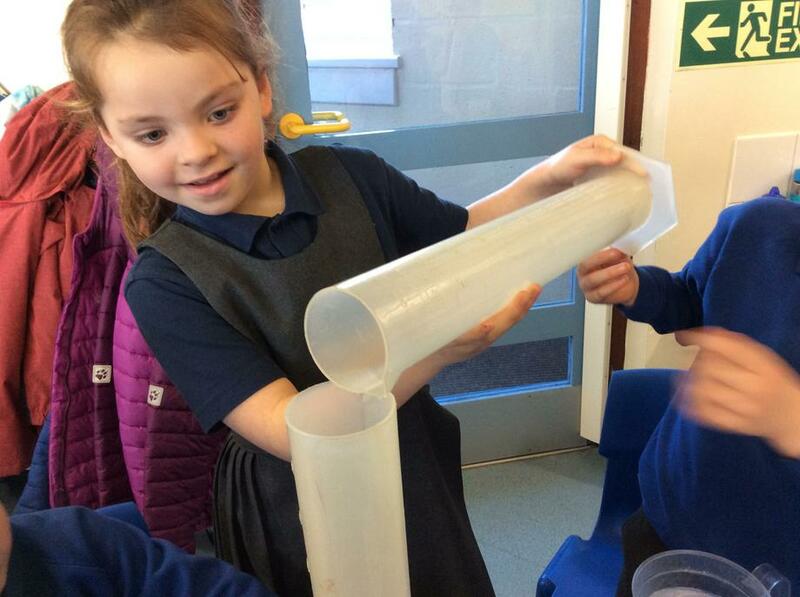 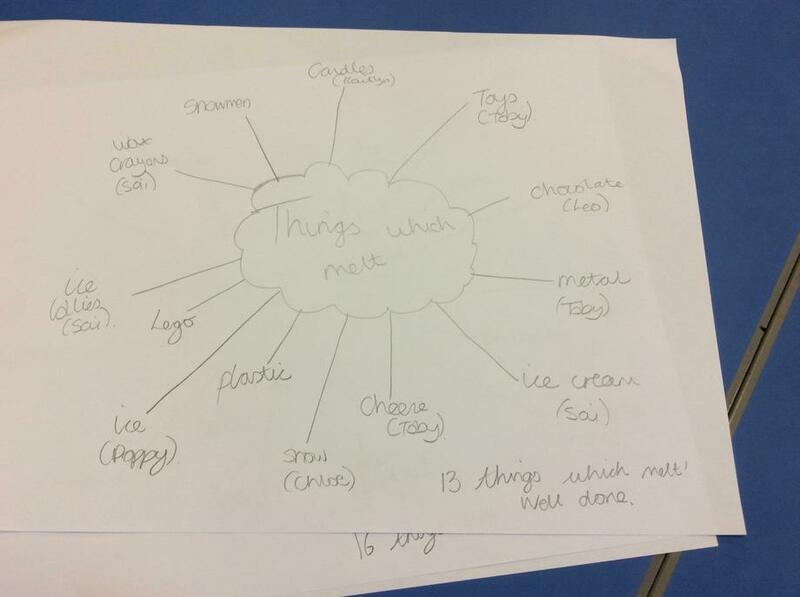 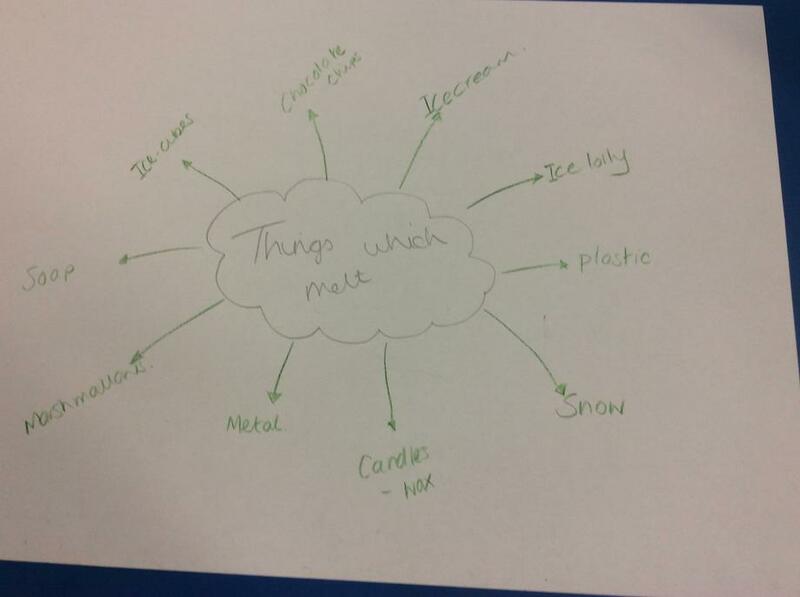 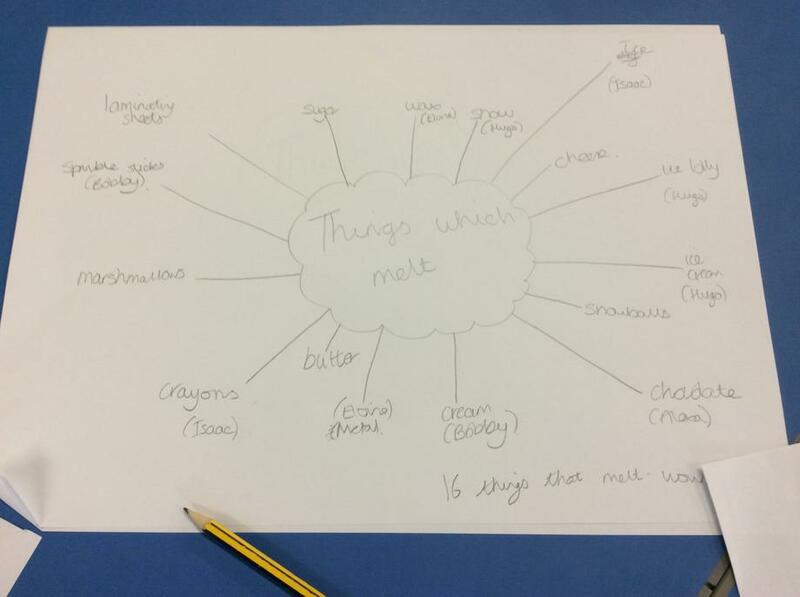 In Science today we have been thinking about things that melt because Izzy the ice cube and her family came to visit.They wanted to know where to sit so they could last the longest. 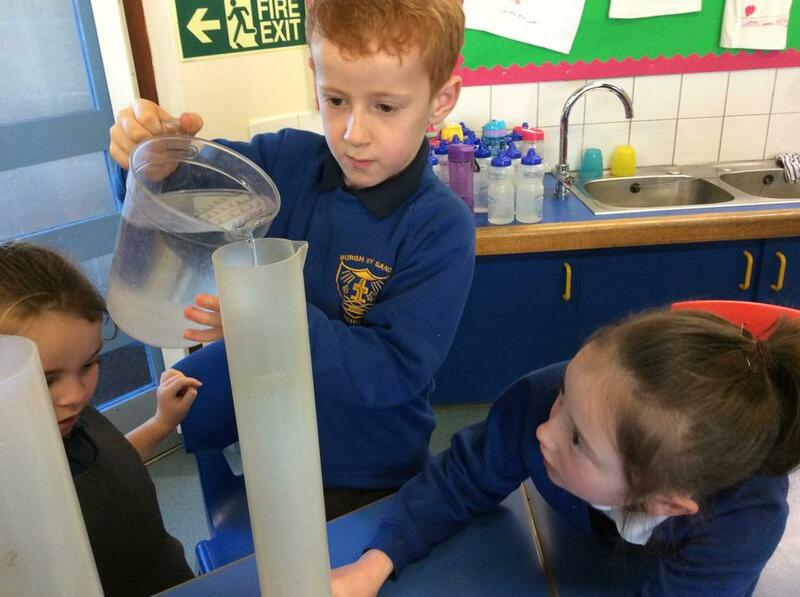 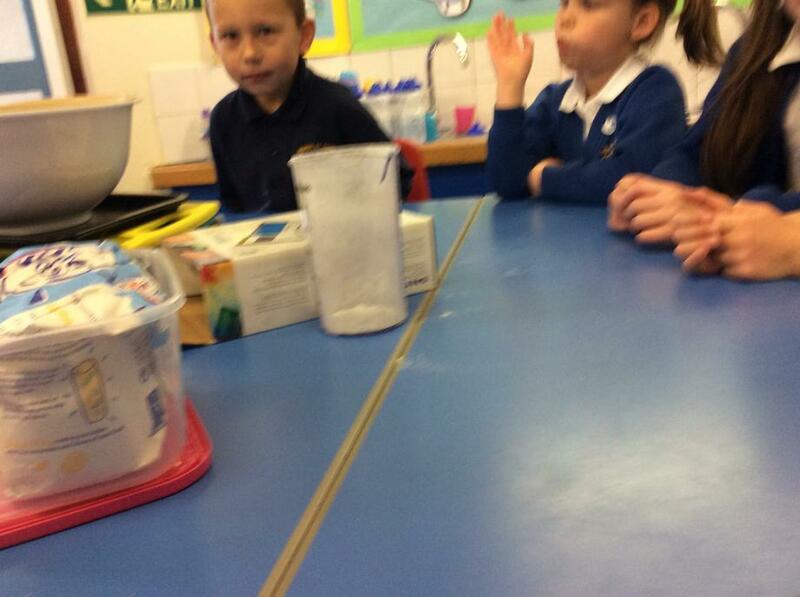 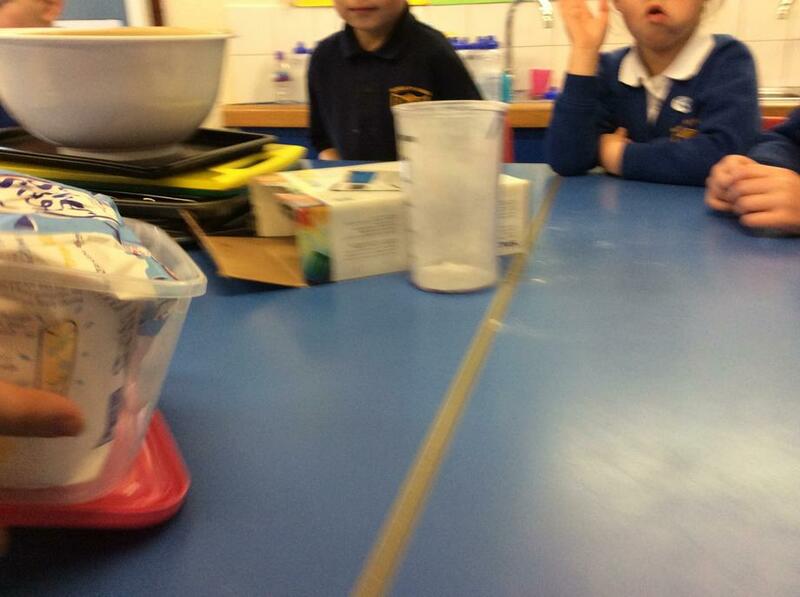 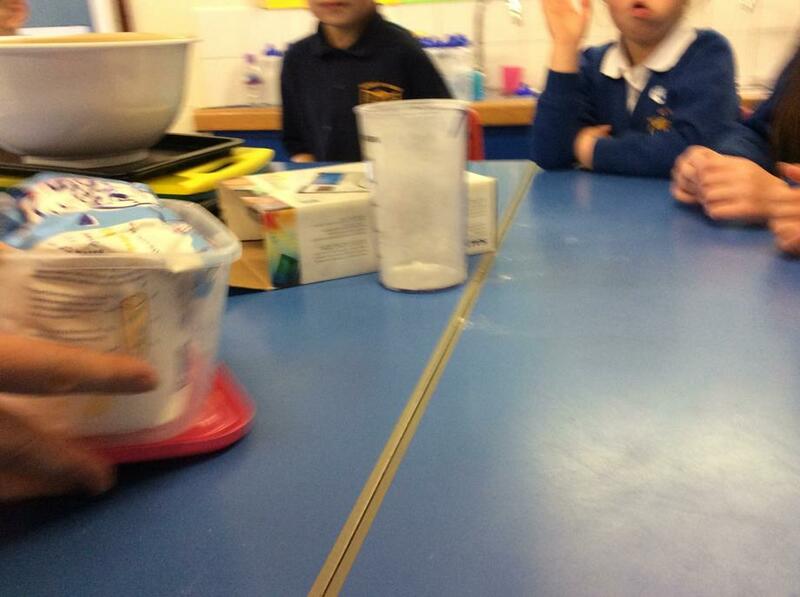 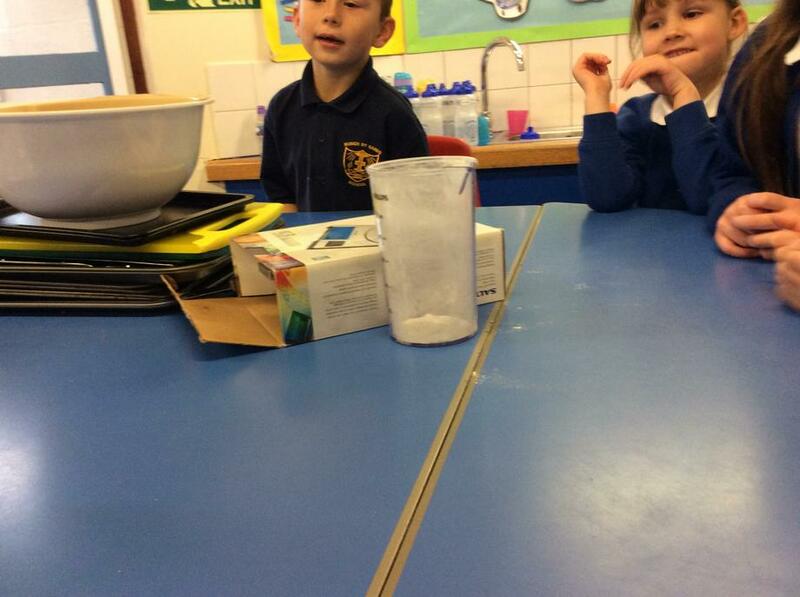 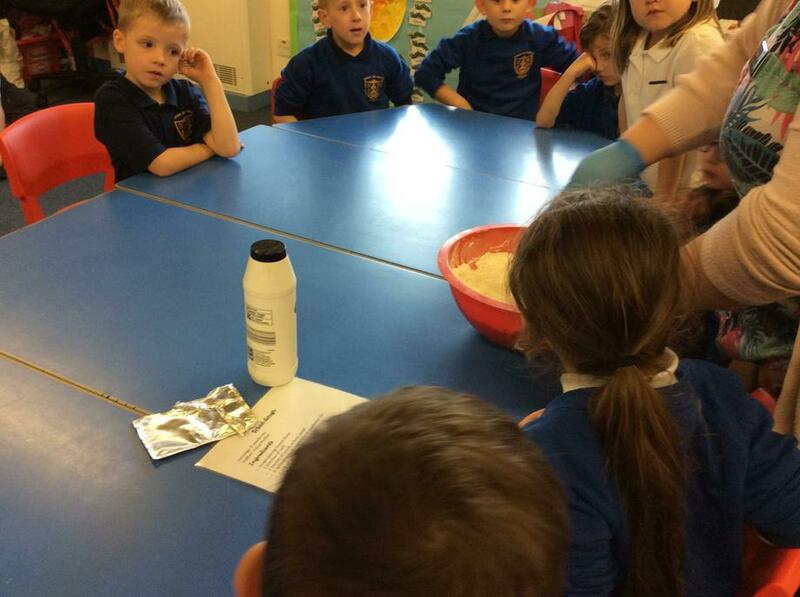 Year 2 children made predictions and recorded results.Year 1 children talked about things which can melt and change. 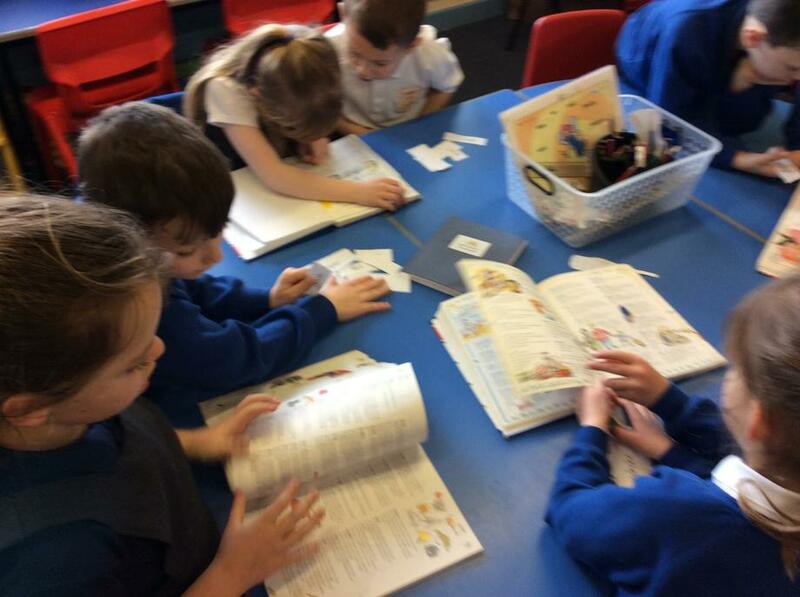 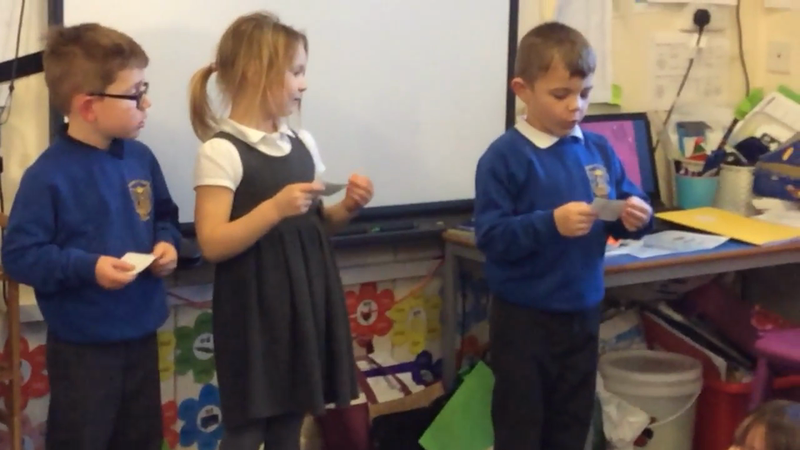 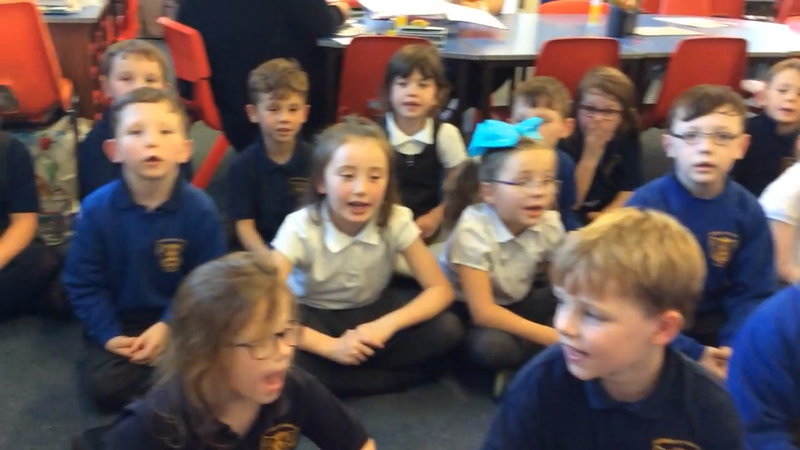 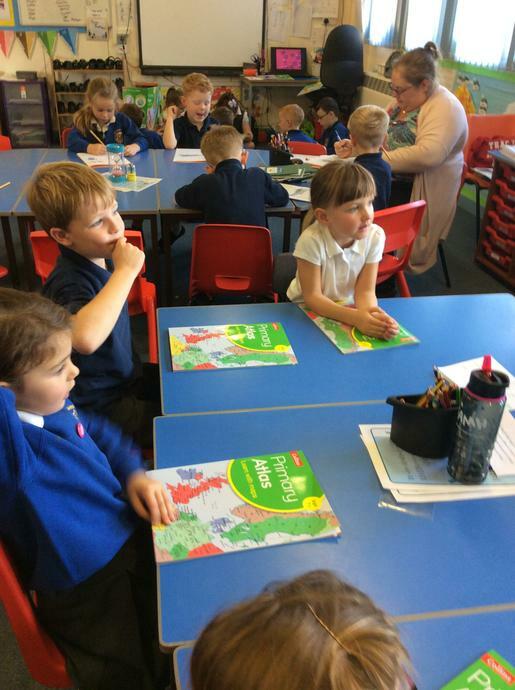 Today in topic time we have been comparing England and France.We have been trying to talk in French and have learnt a song in French and English. 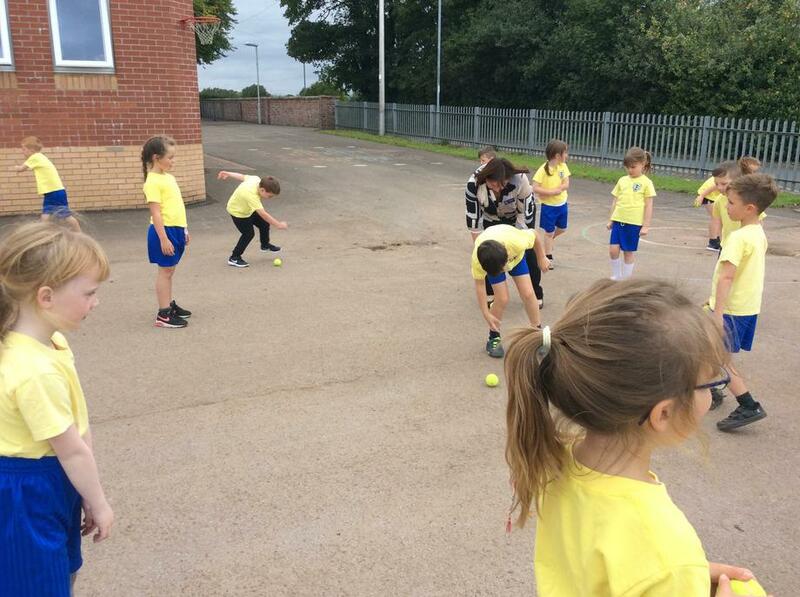 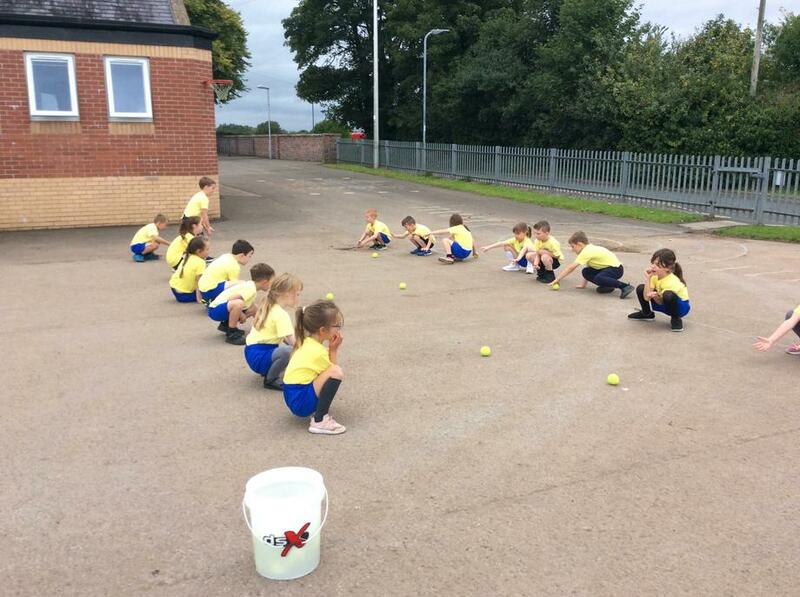 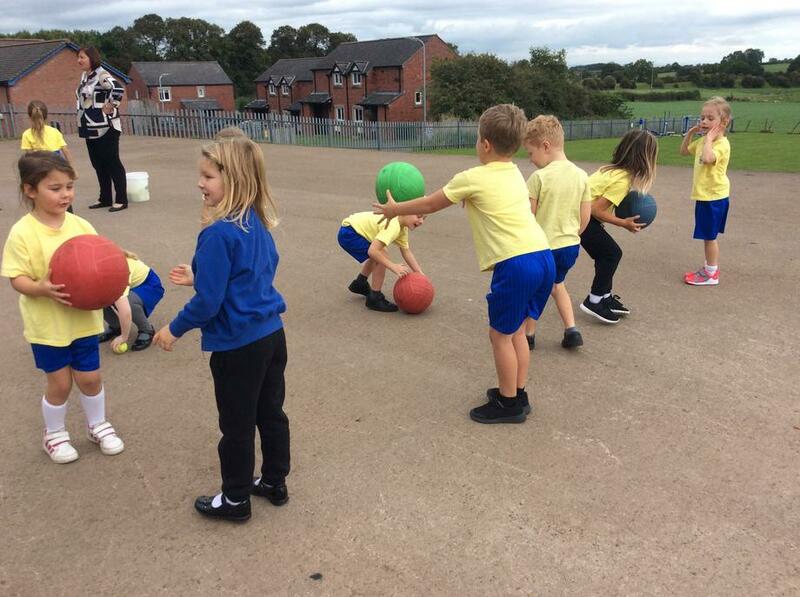 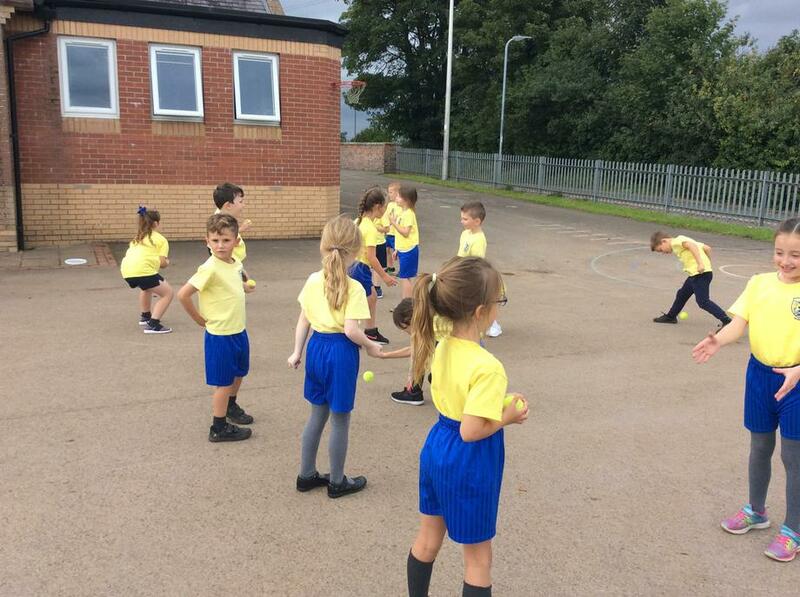 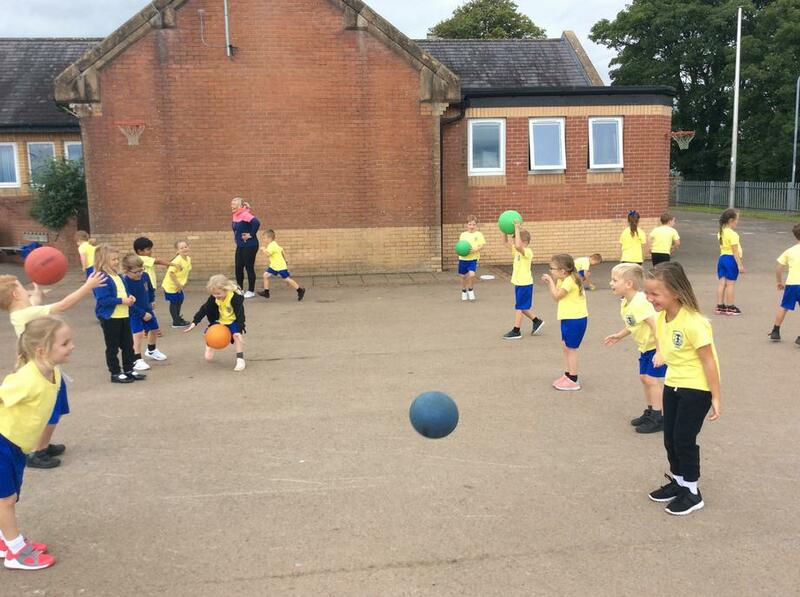 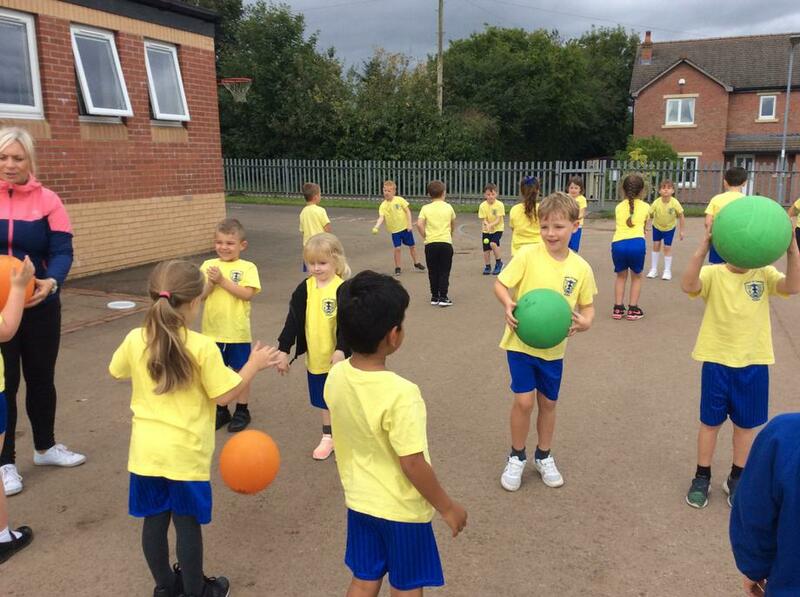 We have been learning ball skills in our PE sessions. 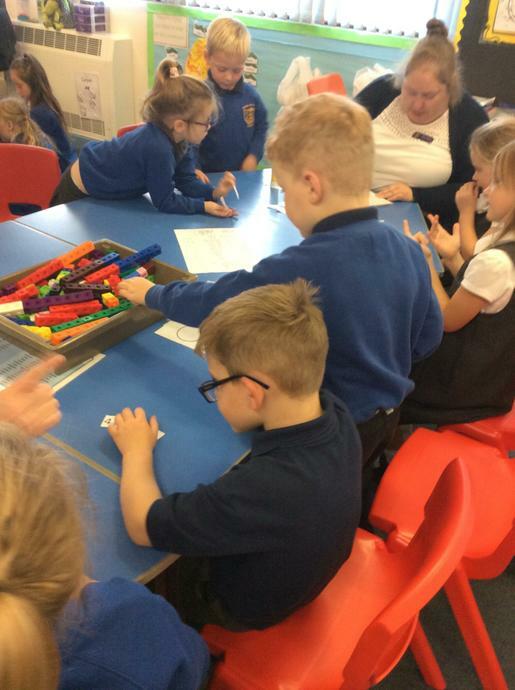 We have been making number patterns with maths apparatus today to help us learn to find the difference between numbers. 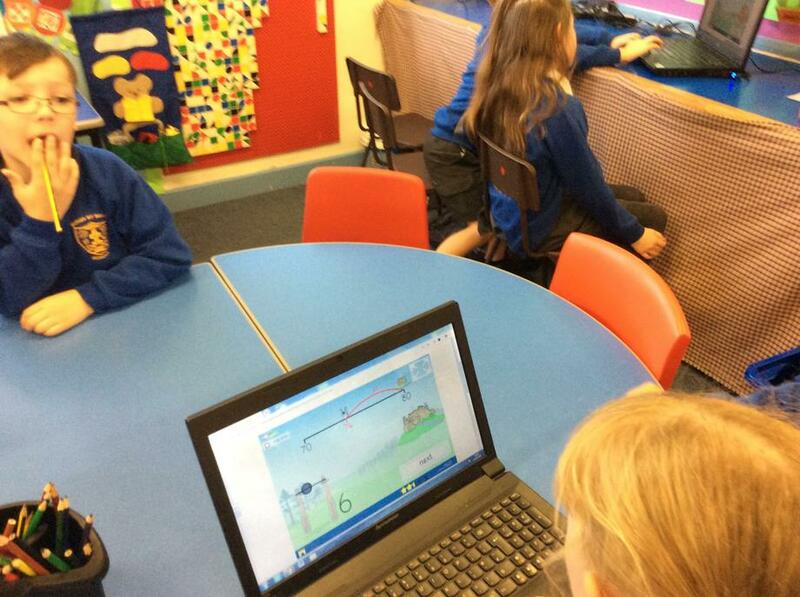 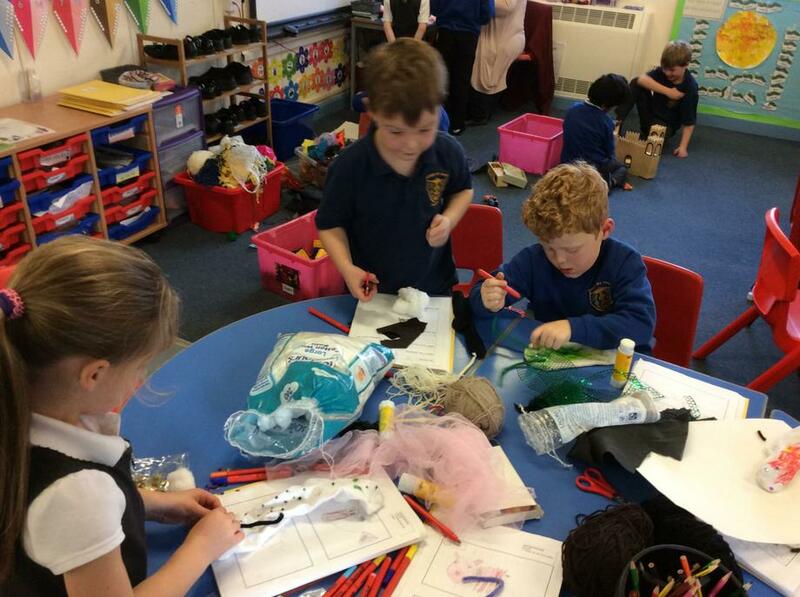 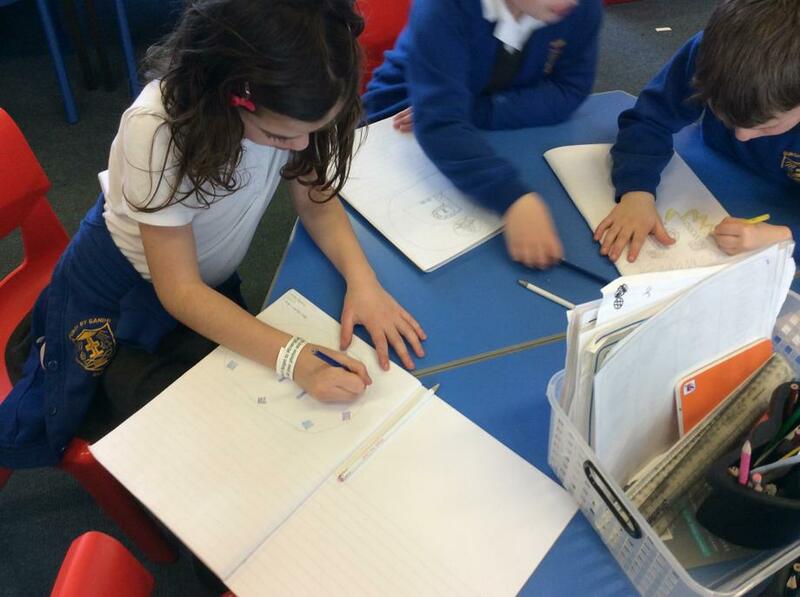 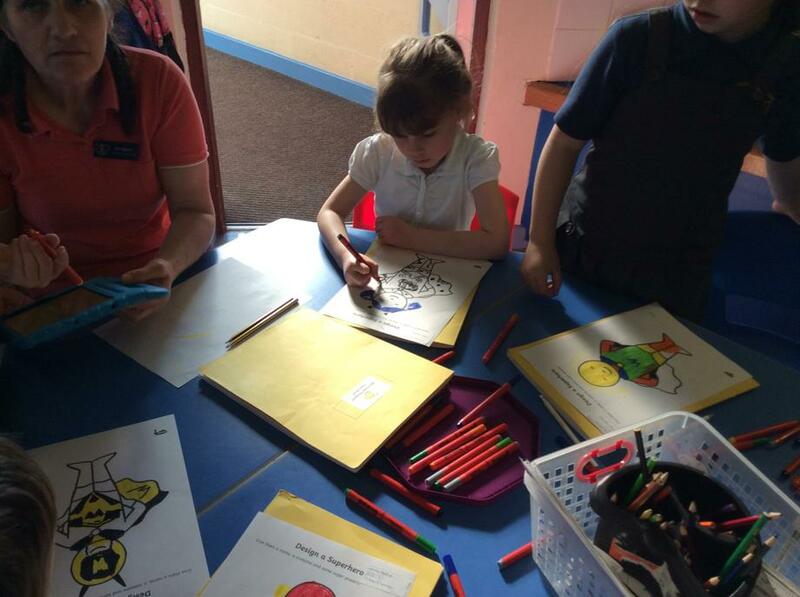 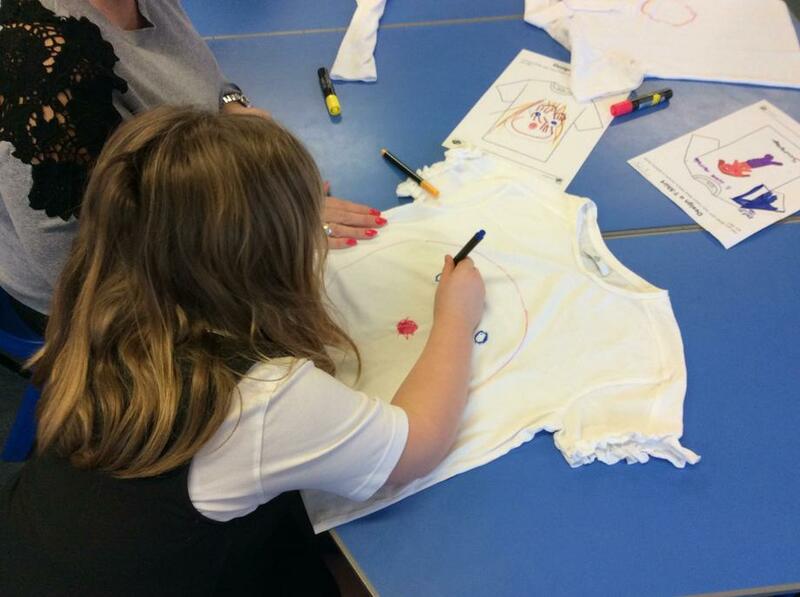 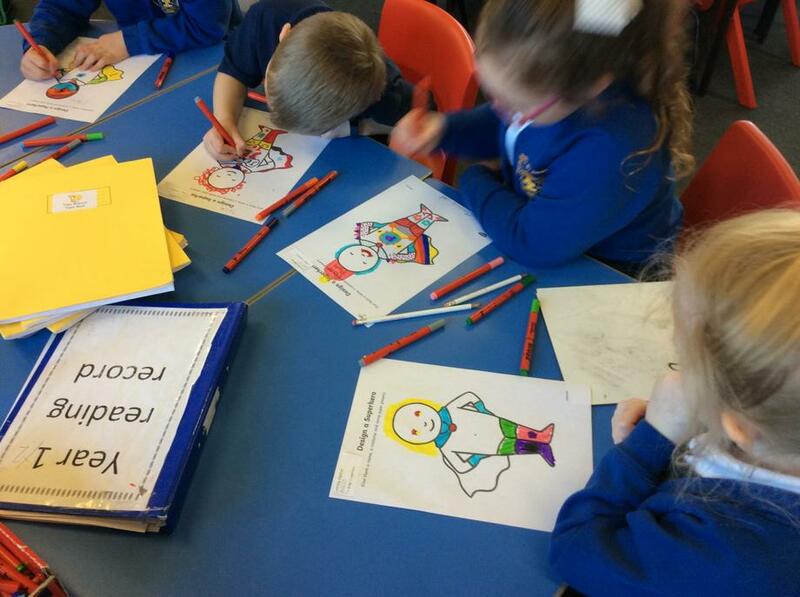 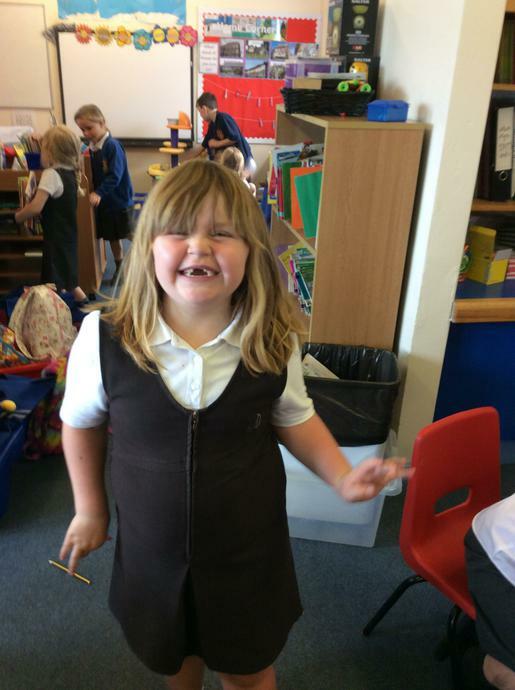 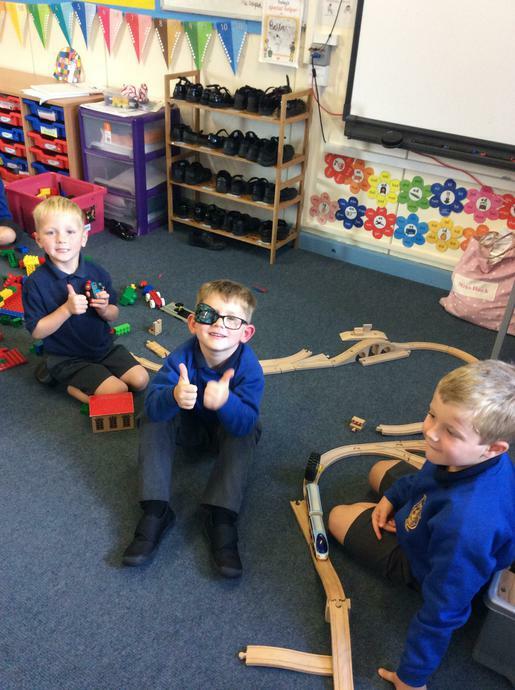 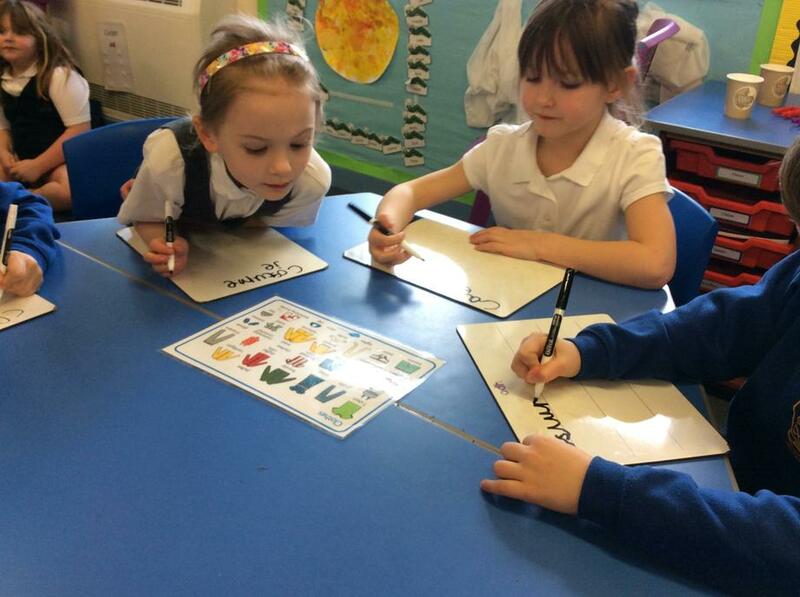 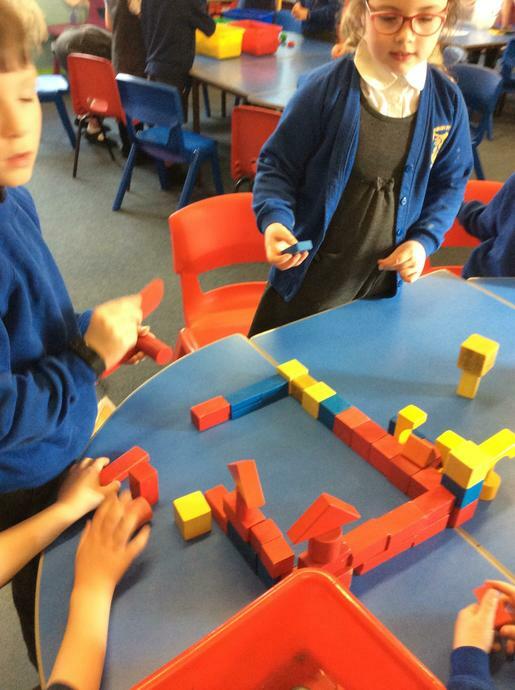 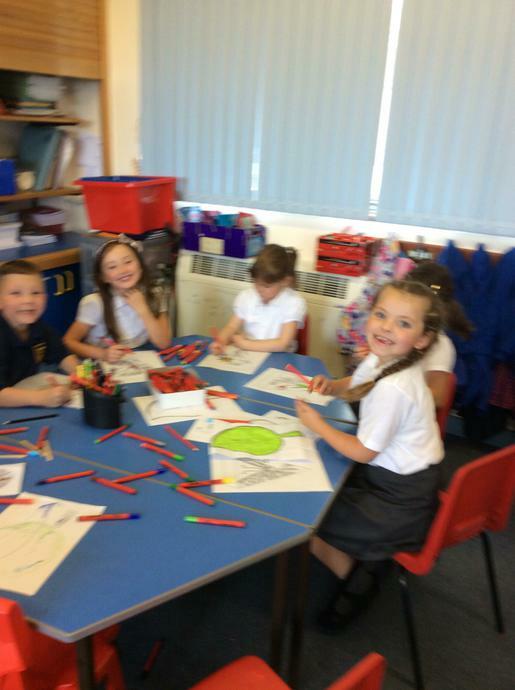 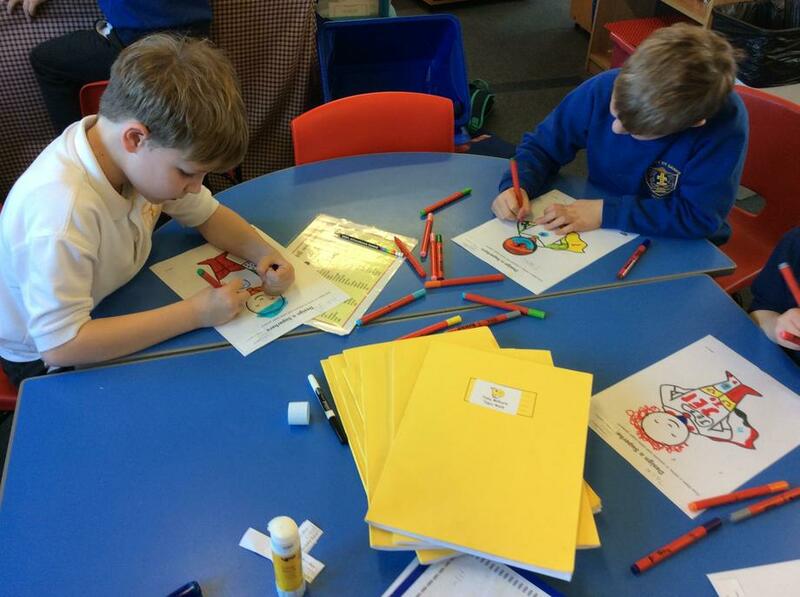 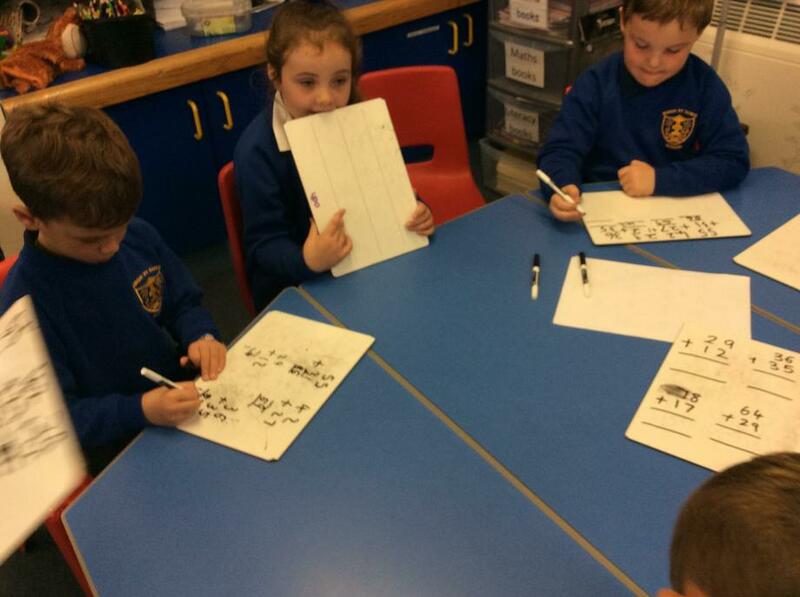 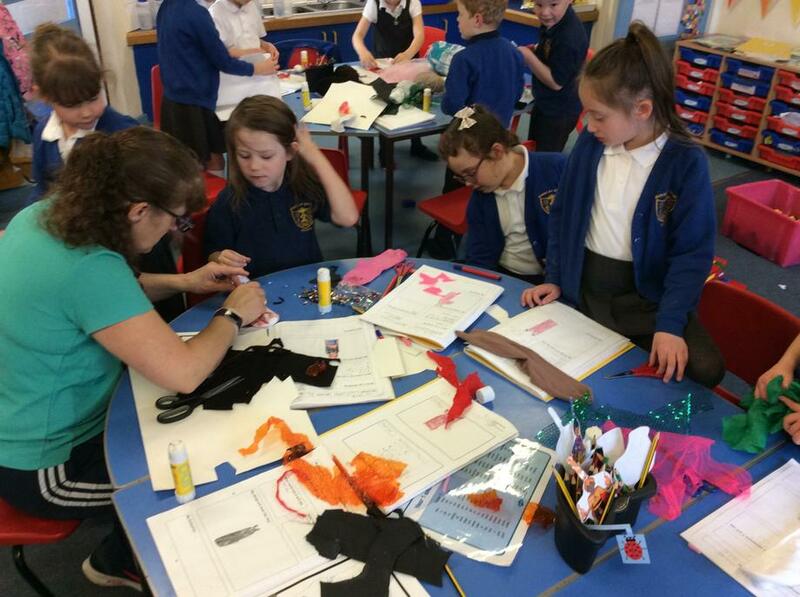 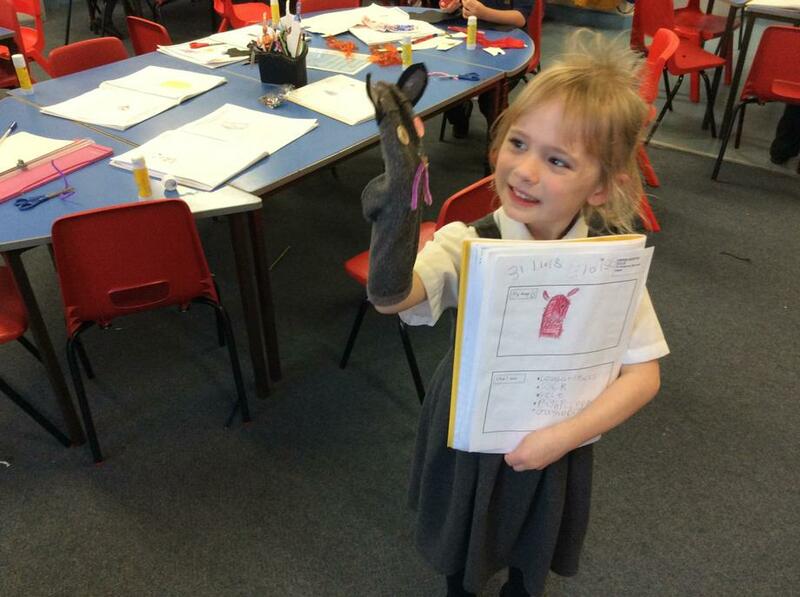 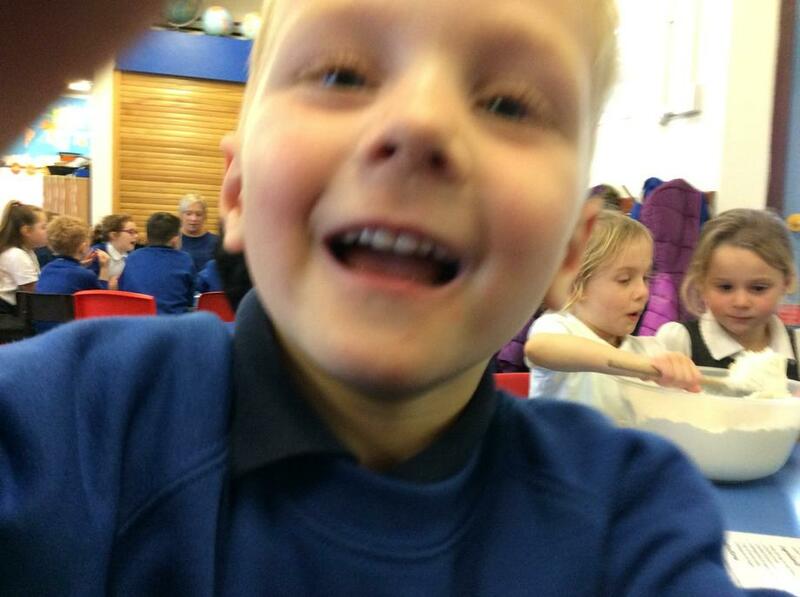 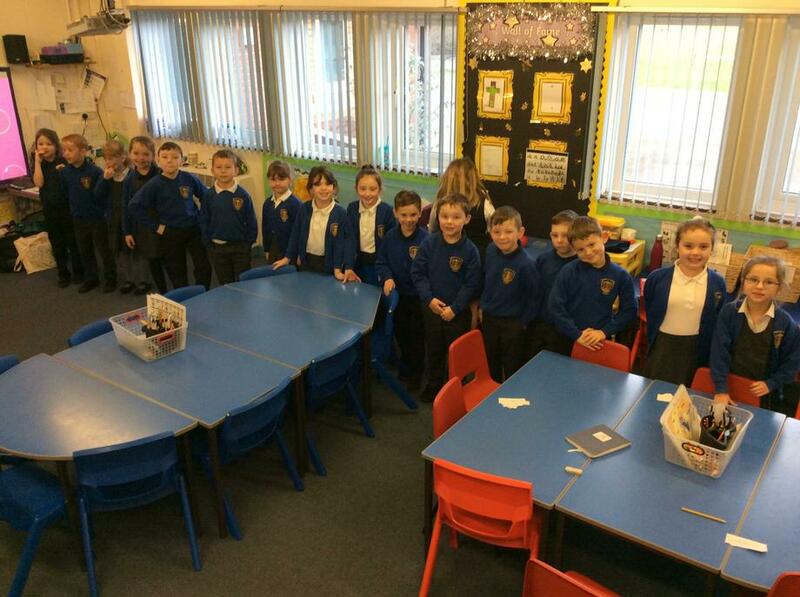 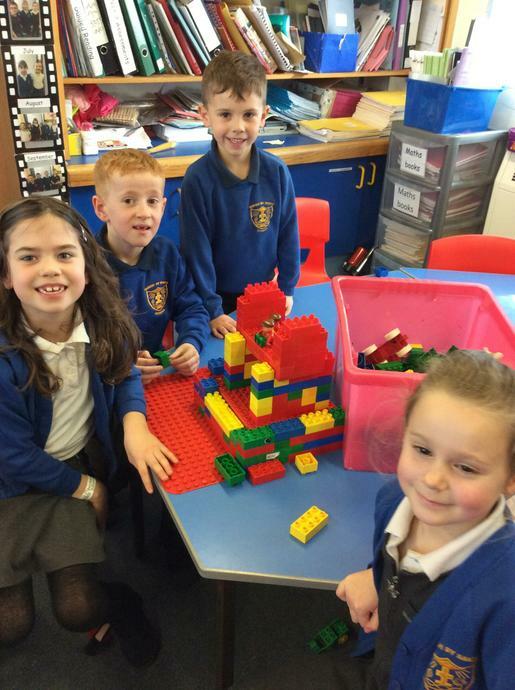 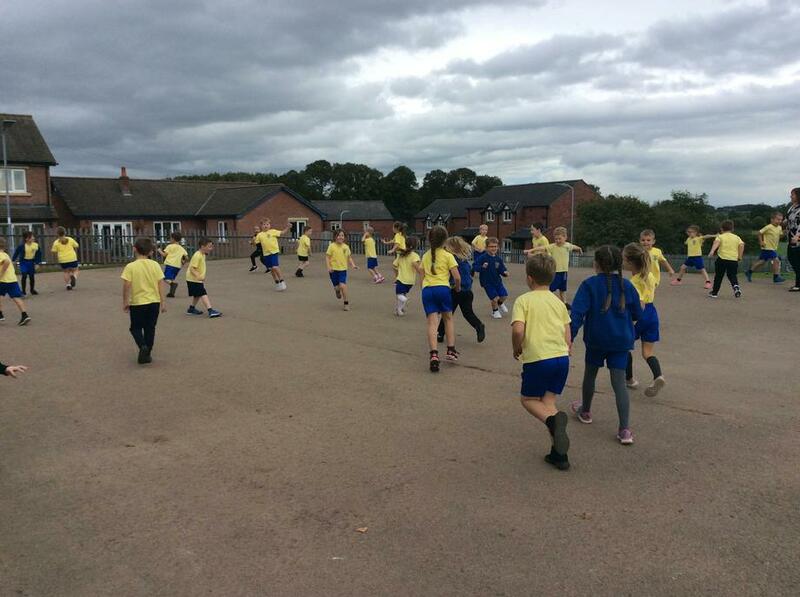 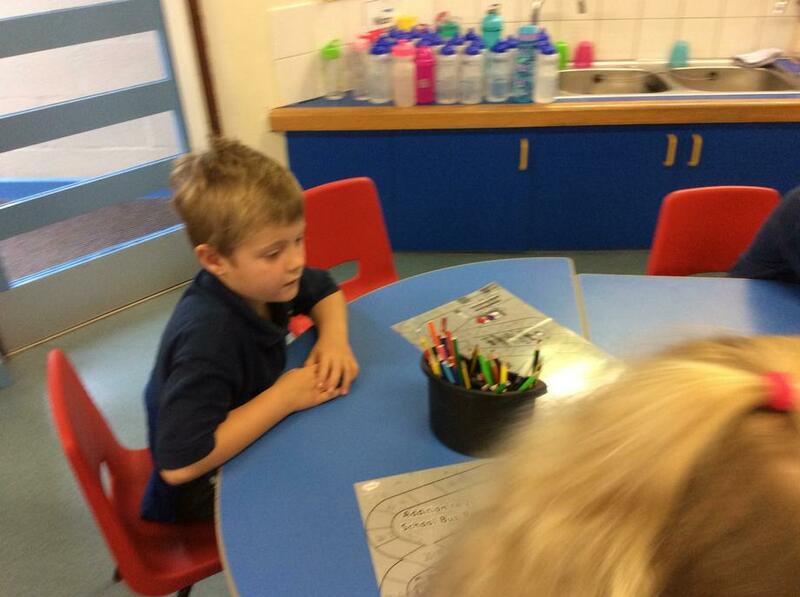 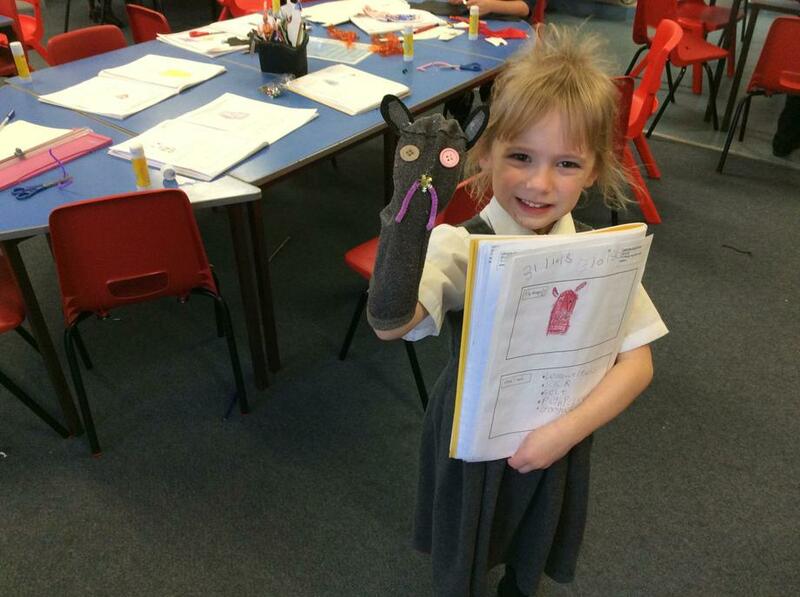 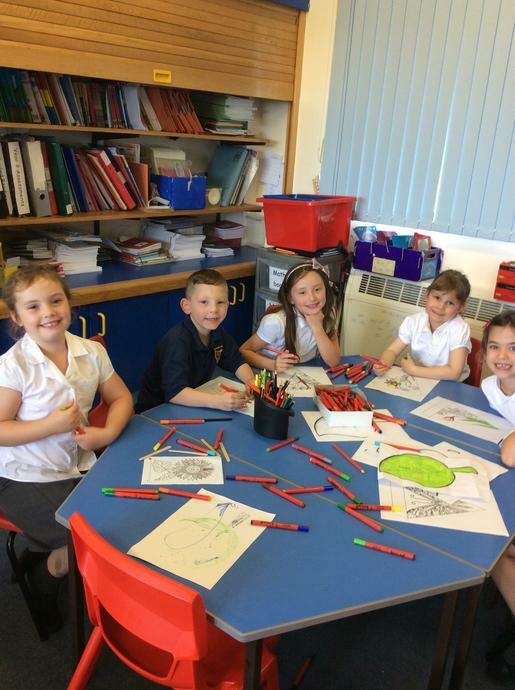 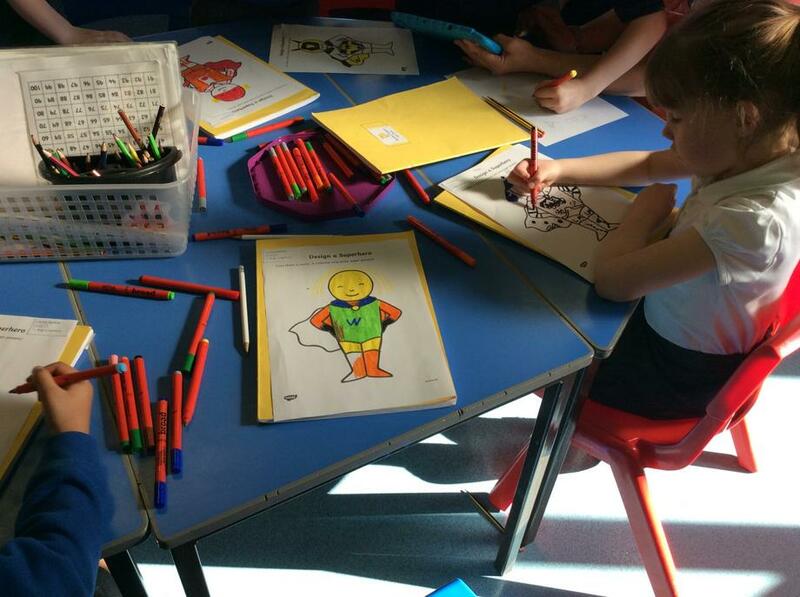 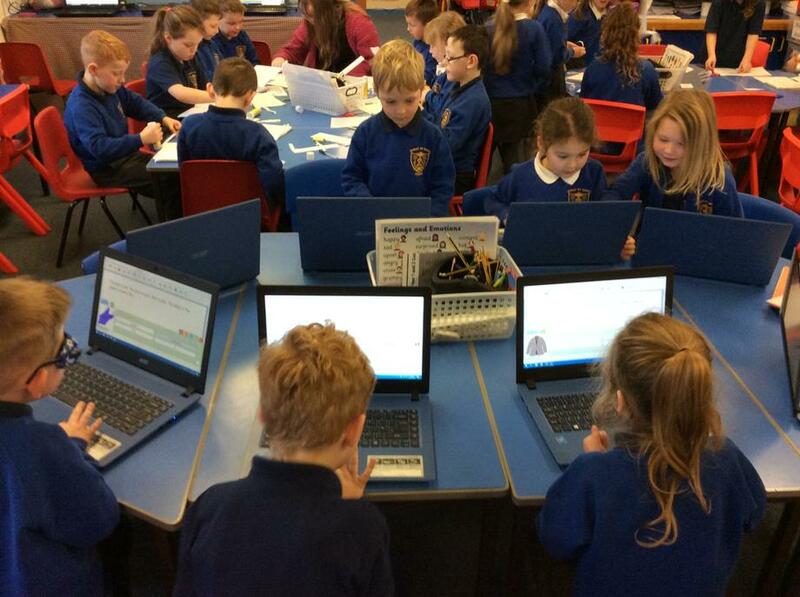 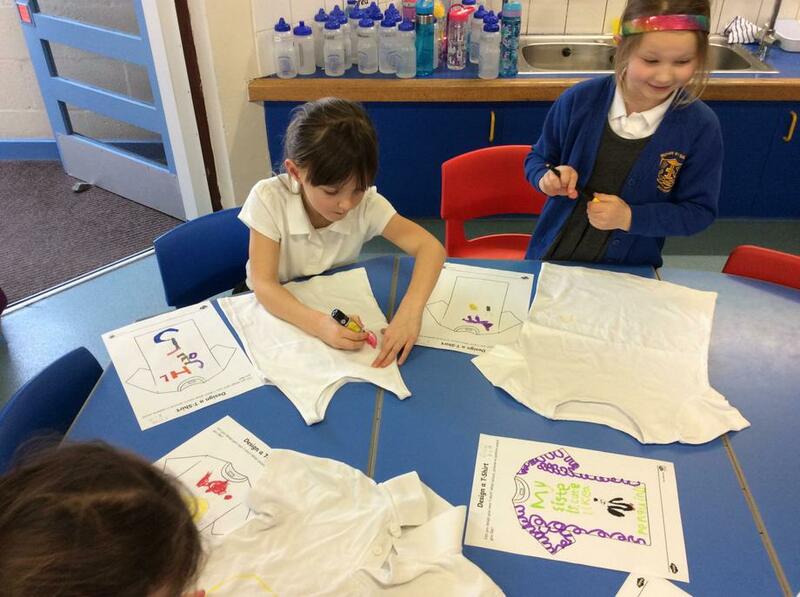 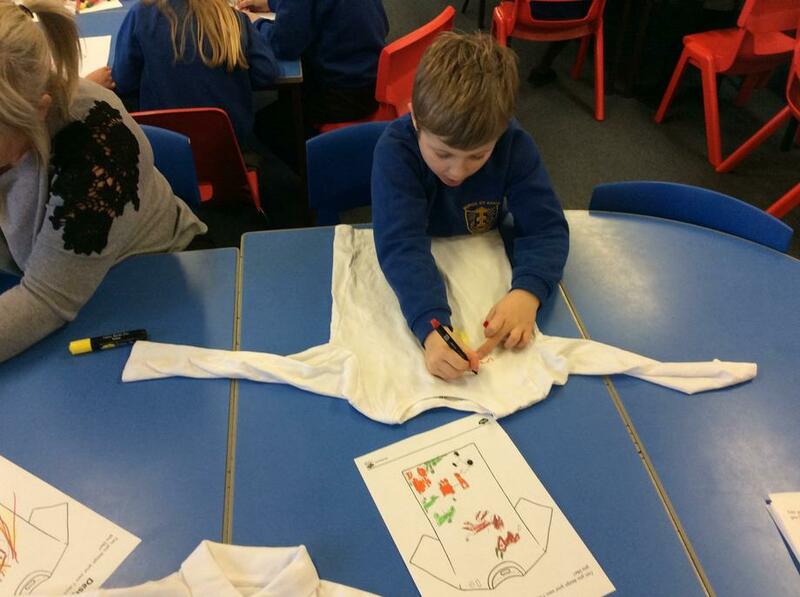 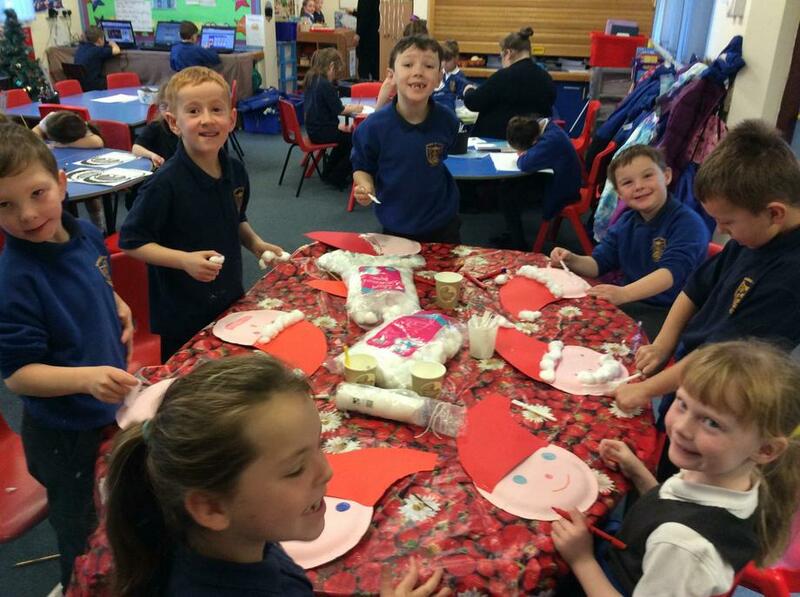 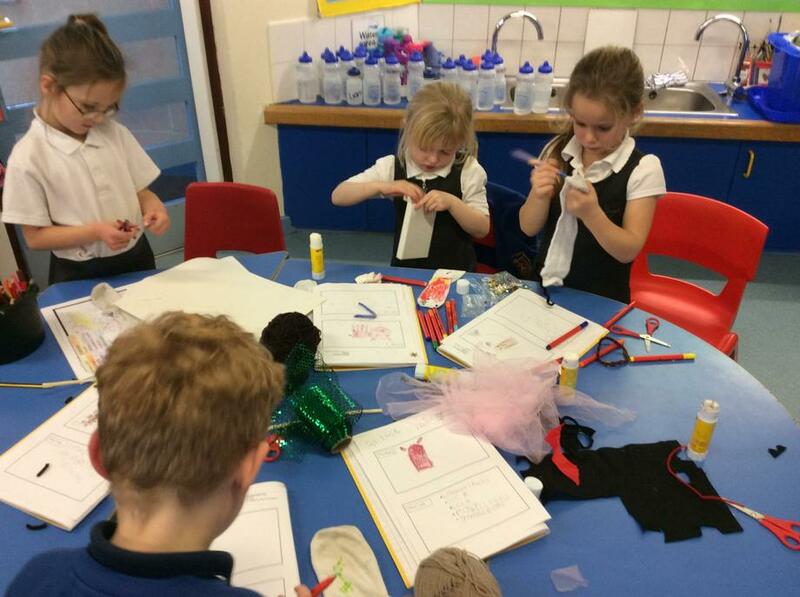 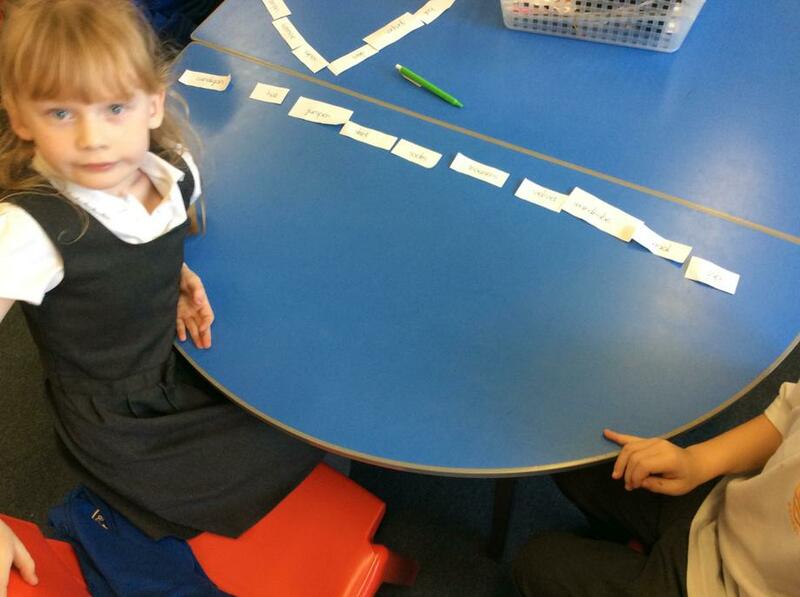 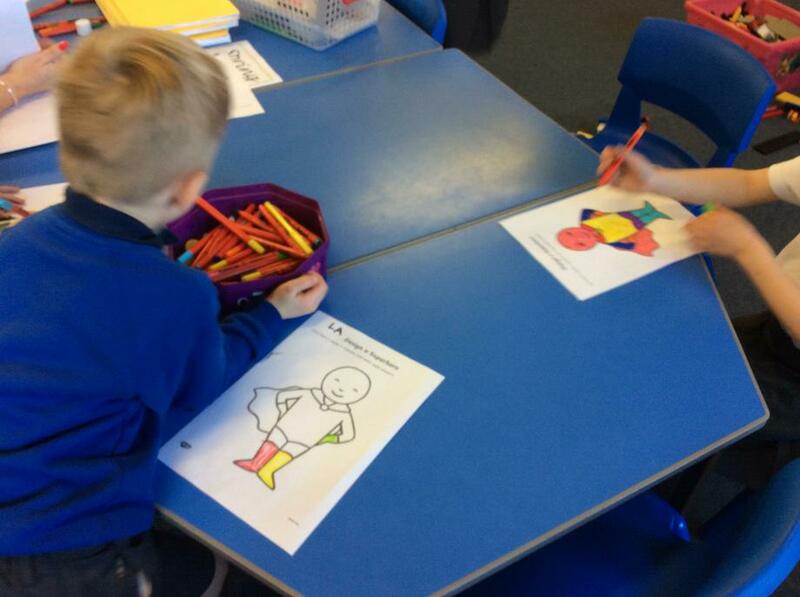 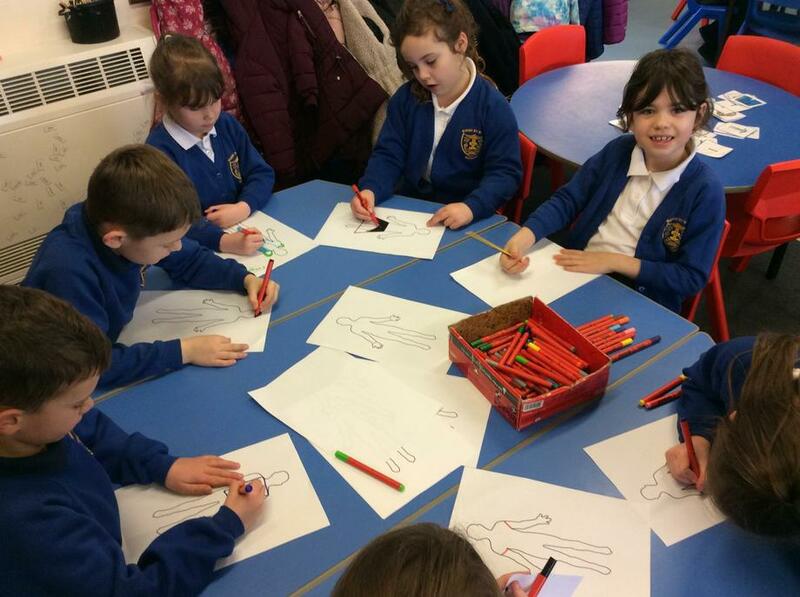 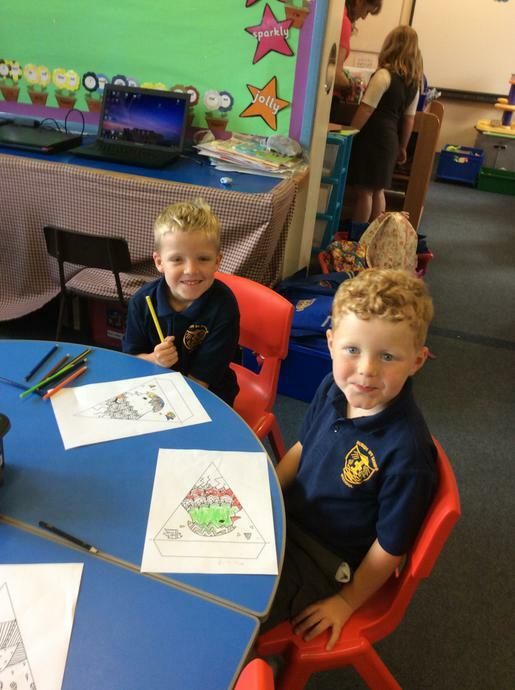 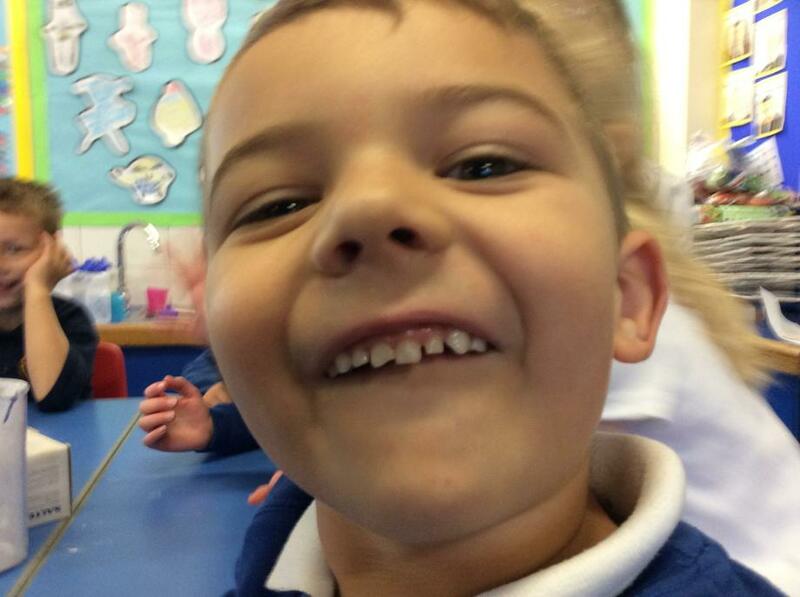 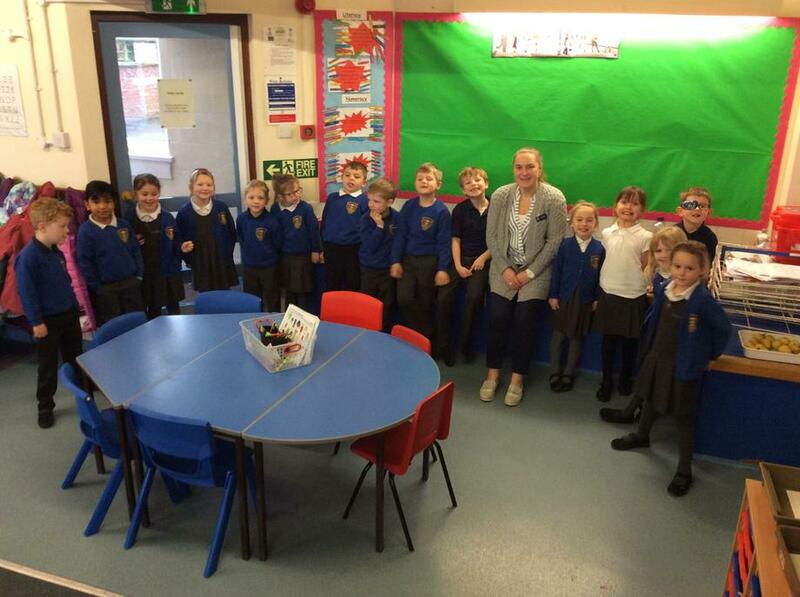 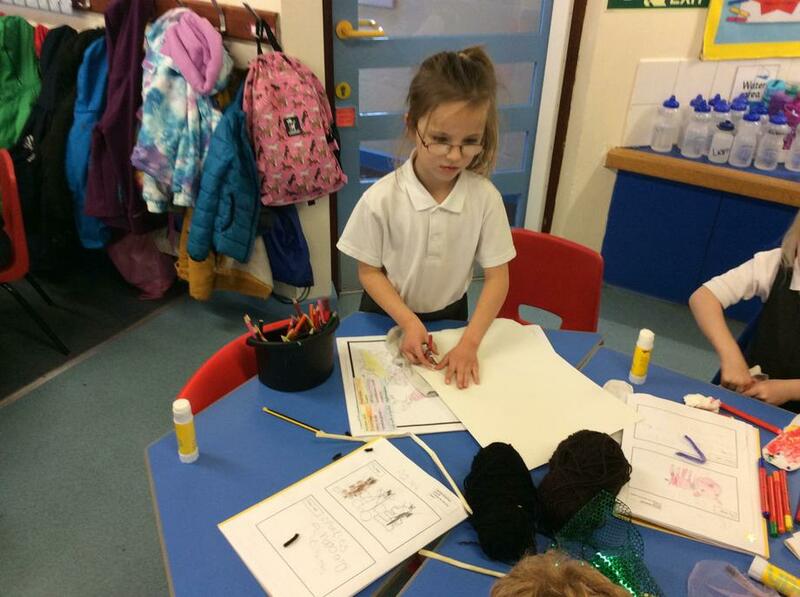 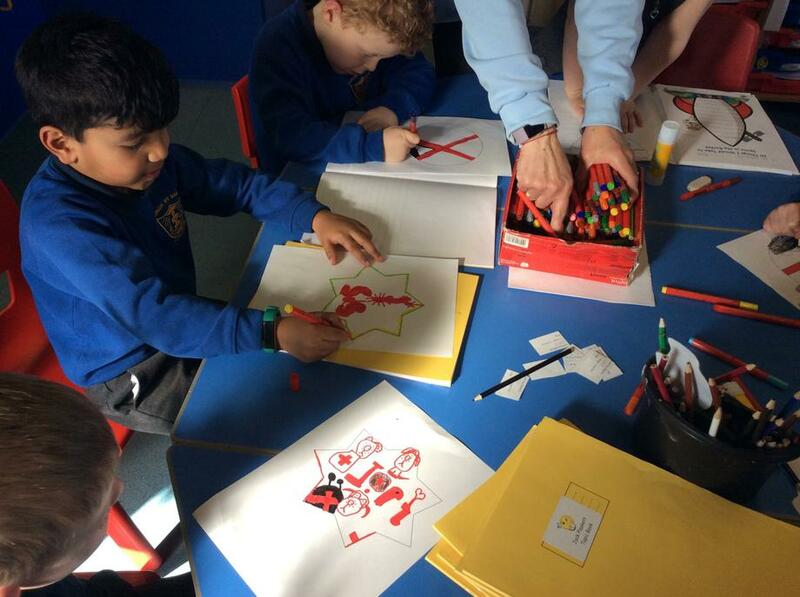 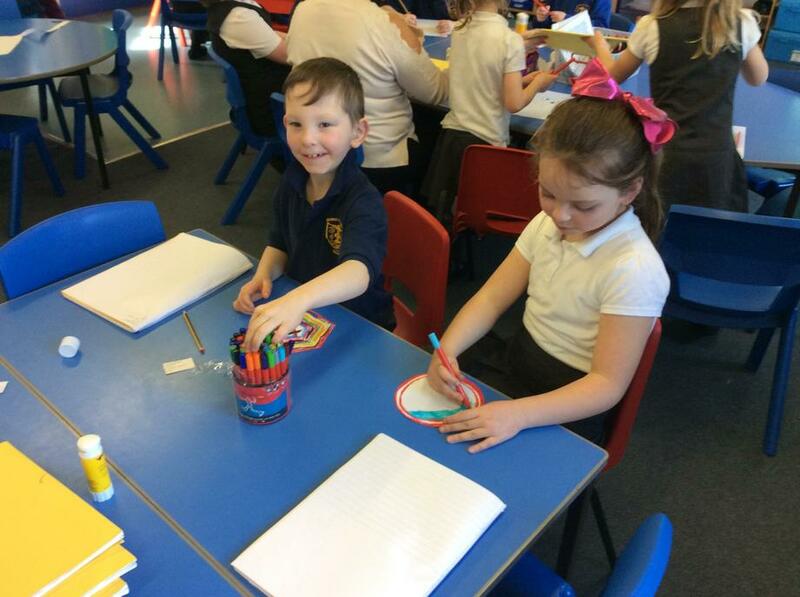 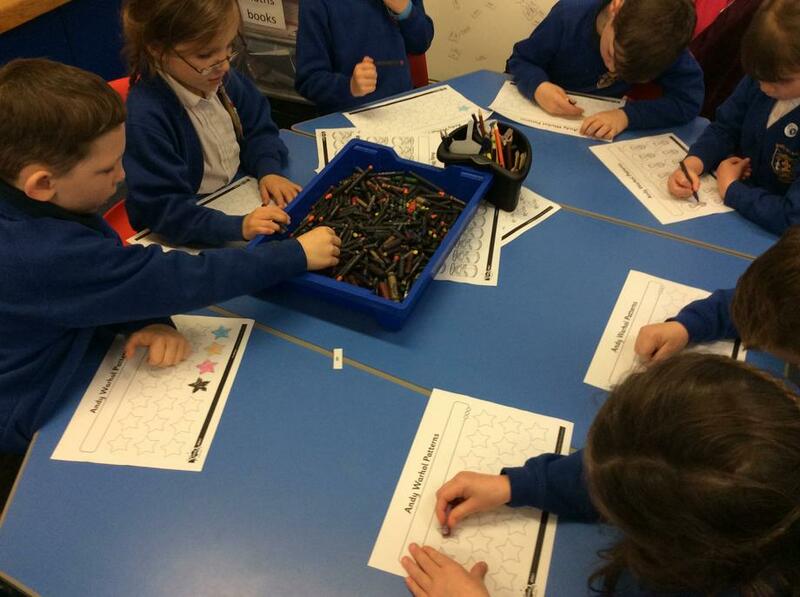 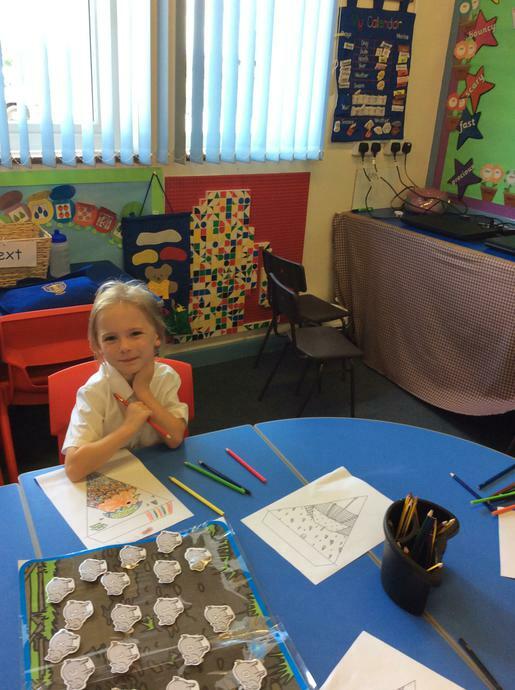 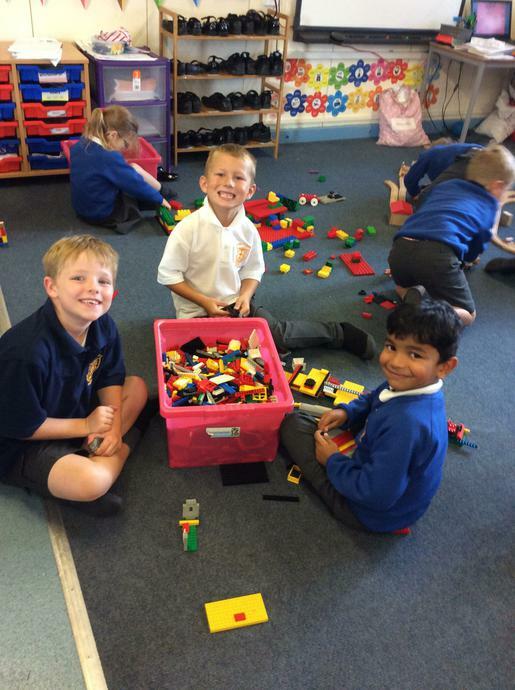 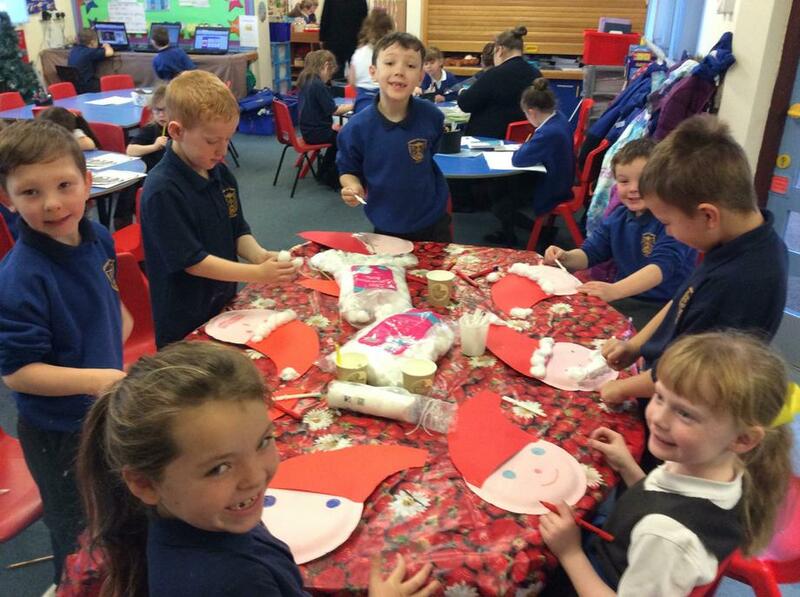 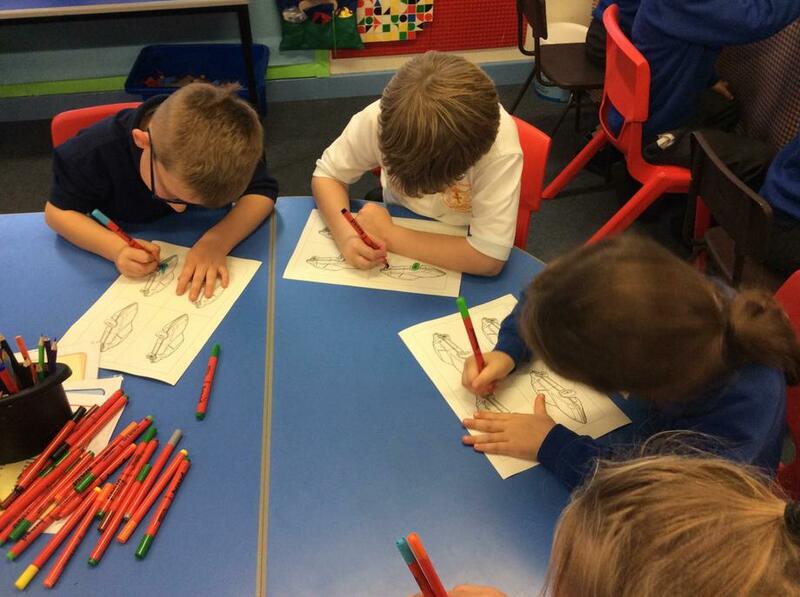 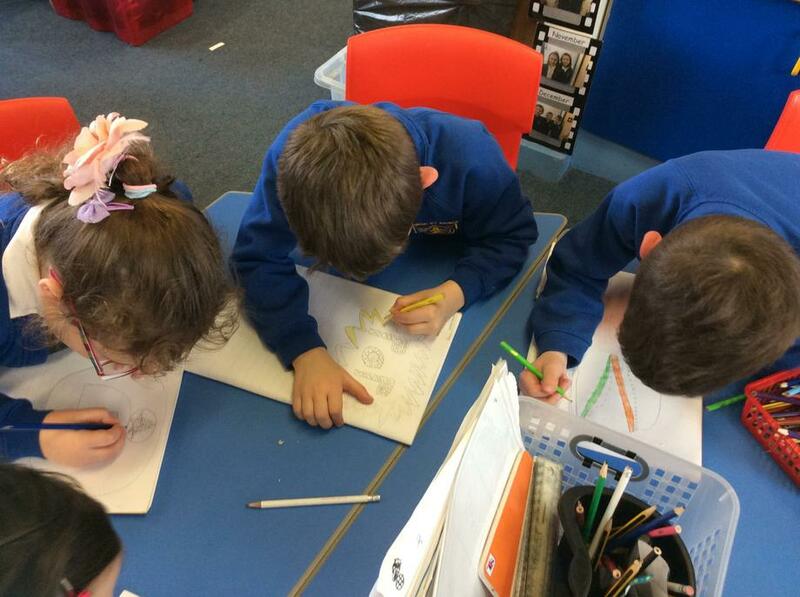 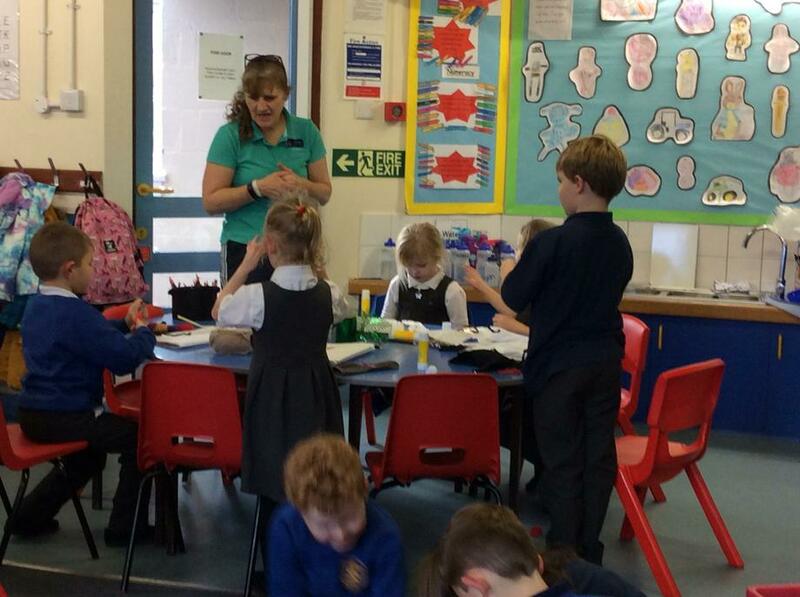 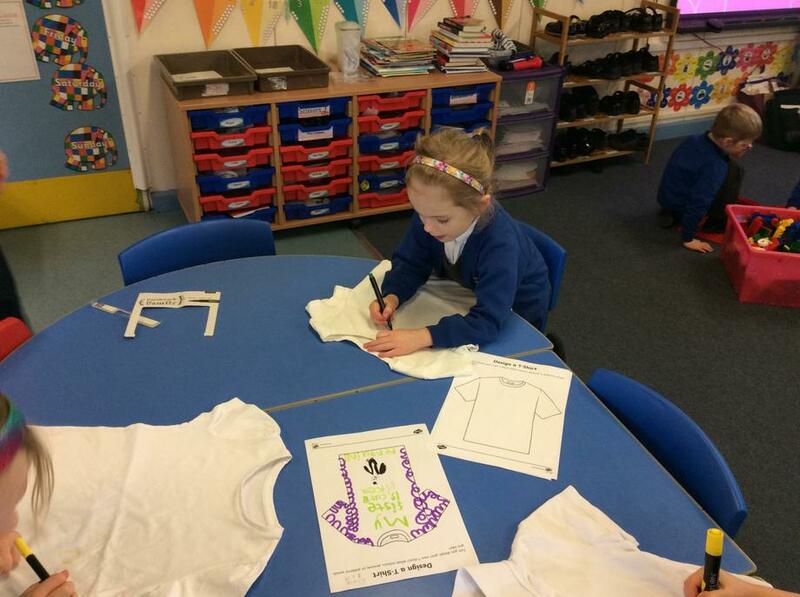 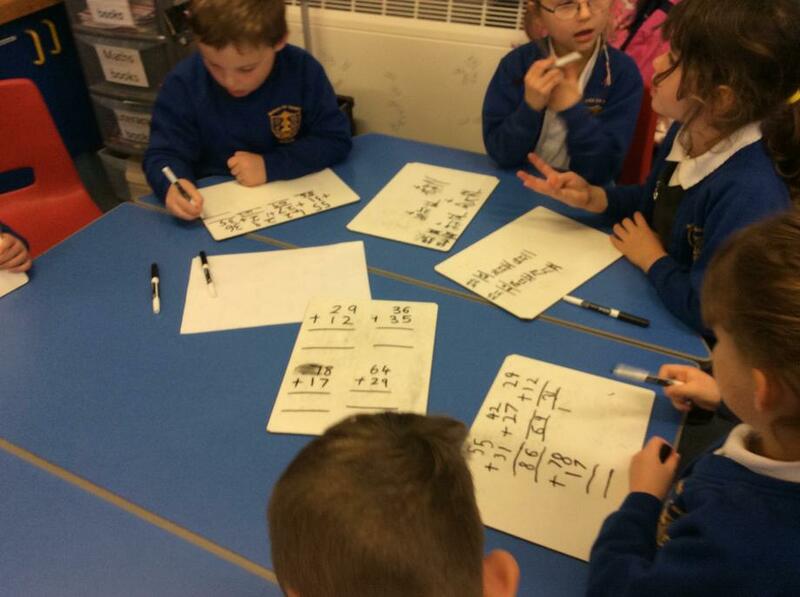 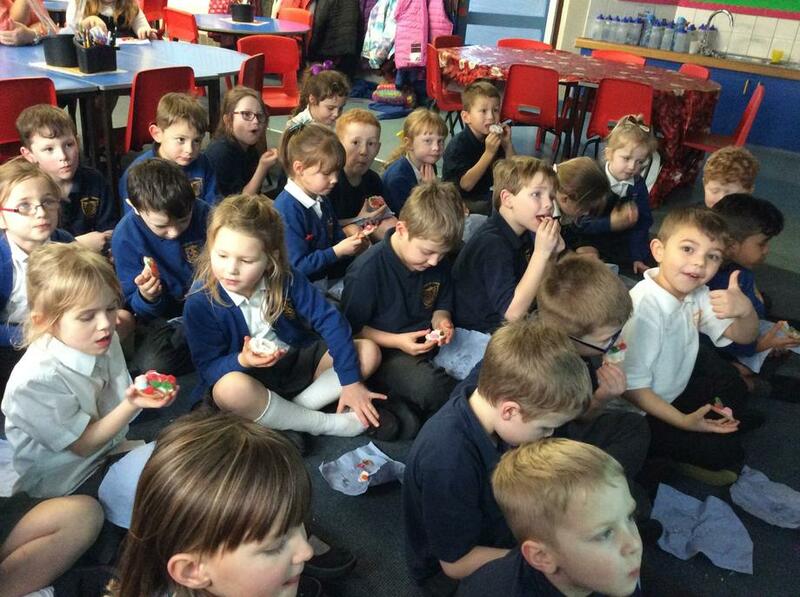 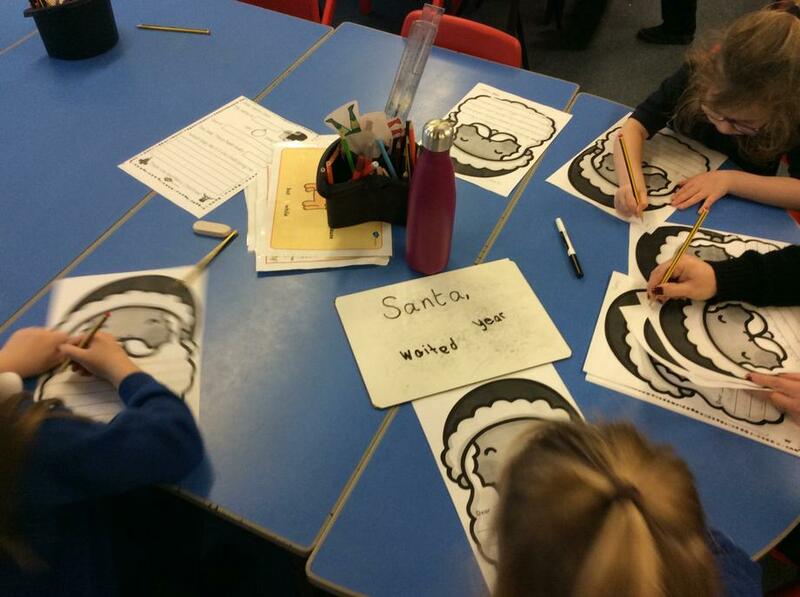 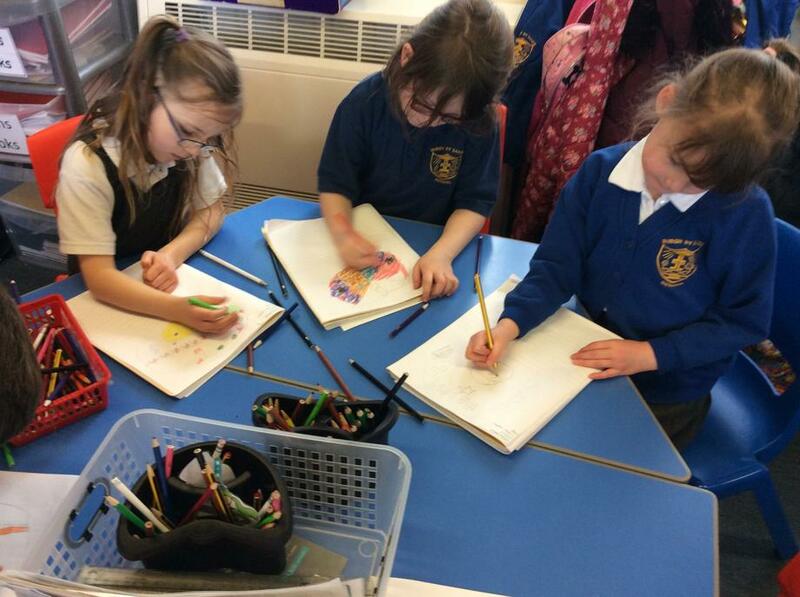 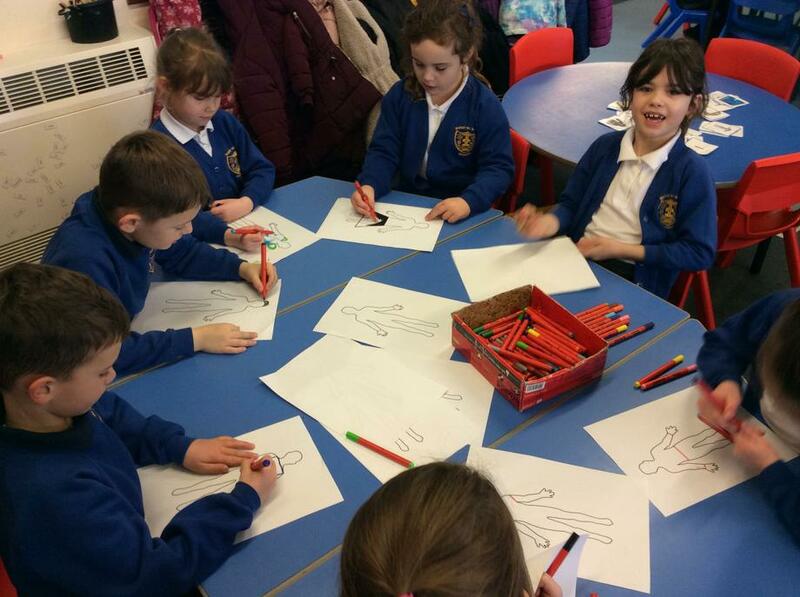 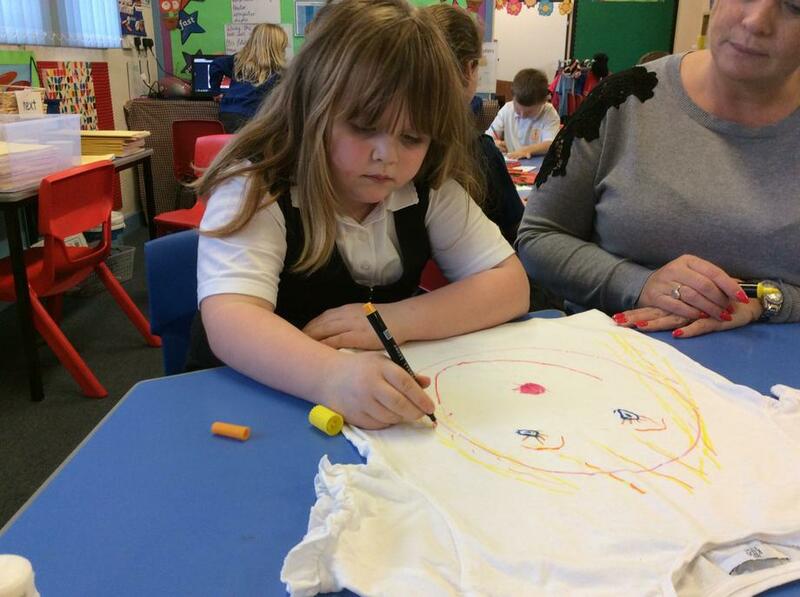 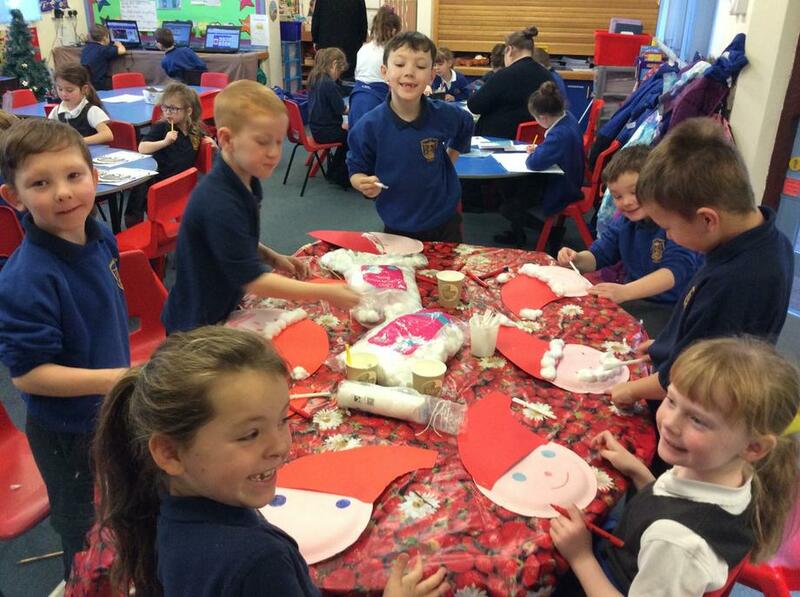 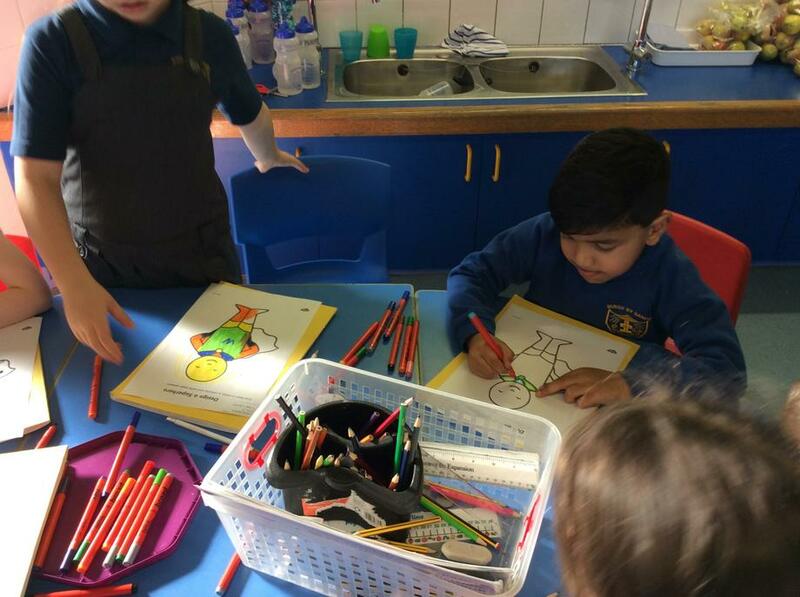 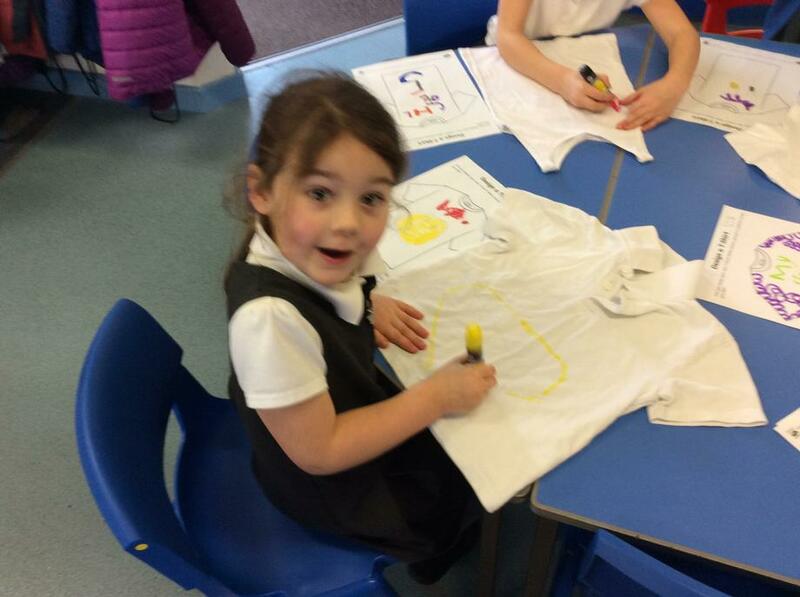 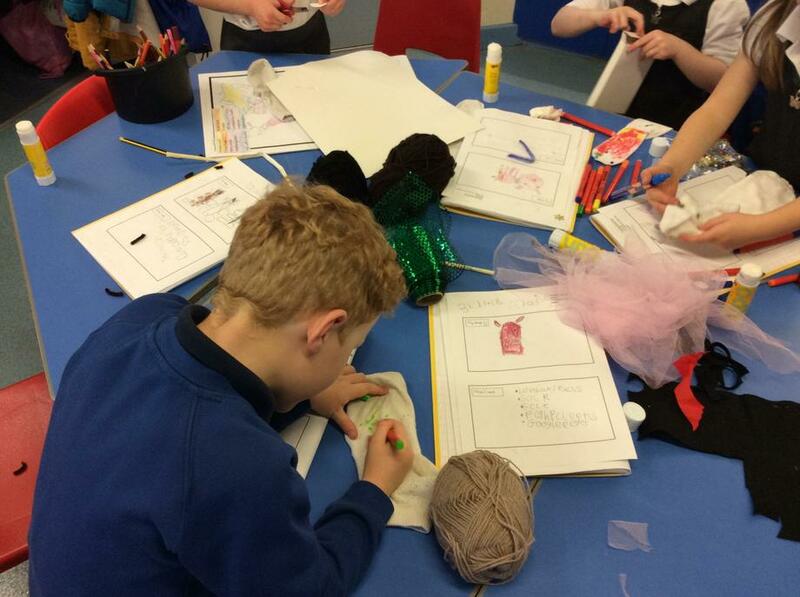 We had lots of fun on our first day back, and even managed to fit in some school work too!